Tomorrow morning (December 12) at about 10 am local time, we will leave Marina Rubicon heading for Martinique in the Caribbean. To get the best winds, the planned route will take us southwest towards Cape Verde before we turn more to the west. The passage is about 2900 nautical miles (5370 kilometers) and will take us 18 to 21 days. The forecast for the first week is excellent. The boat is ready to go and so are we. 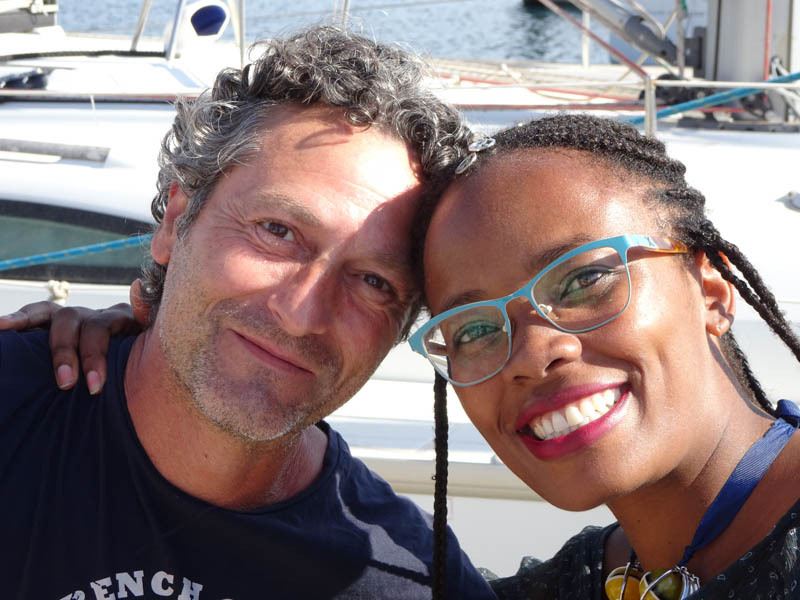 Having Tom Erik and Vivi-Ann along as crew will make the Atlantic crossing much easier. 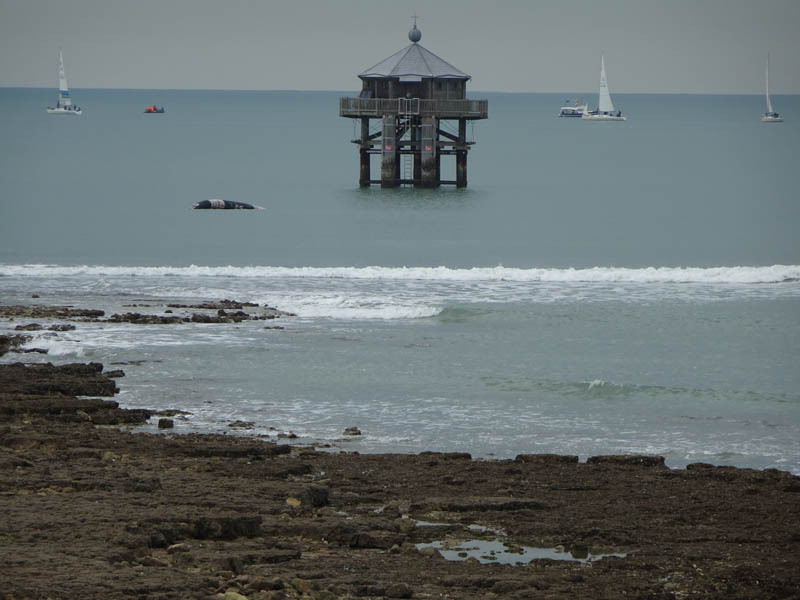 We will post updates to the blog en route and you can always check on our position at our shared map page here: https://share.garmin.com/MarkPitt. 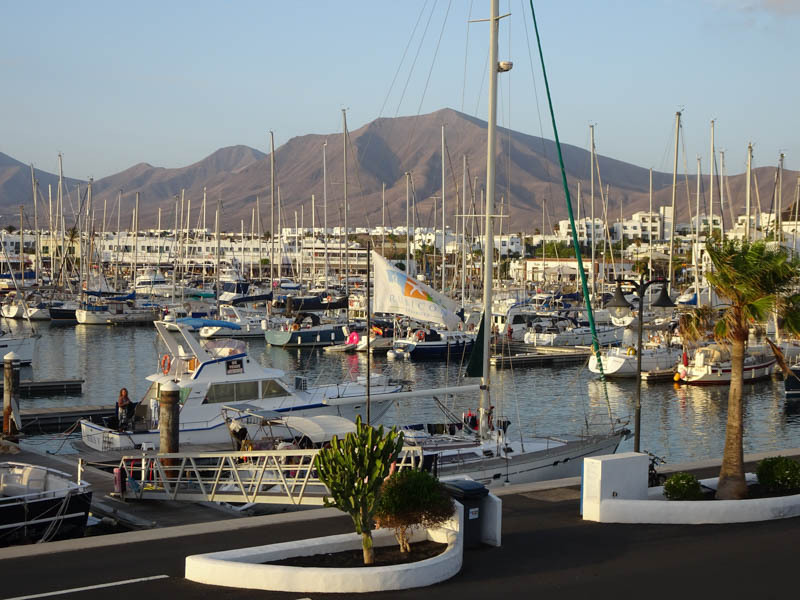 We are still at the Marina Rubicon at the southern end of Lanzarote Island in the Canary Islands. 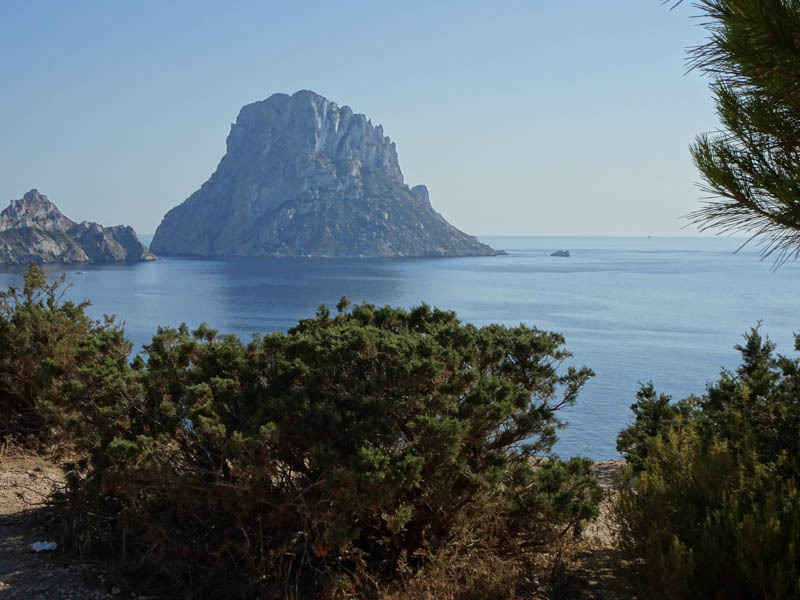 We have become very fond of this place, even more so now that we have had the opportunity to explore the island by car and foot. 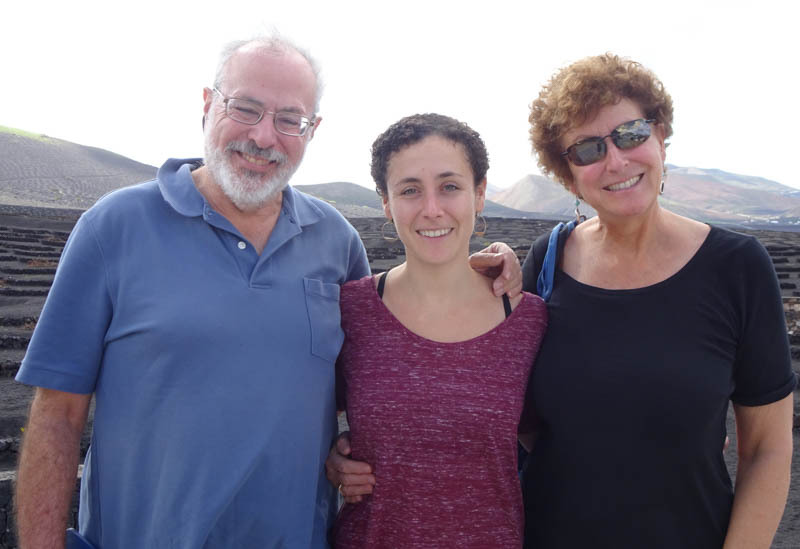 The highlight of the past month was the visit of our daughter Hannah and her friend Adina during the week of November 17. 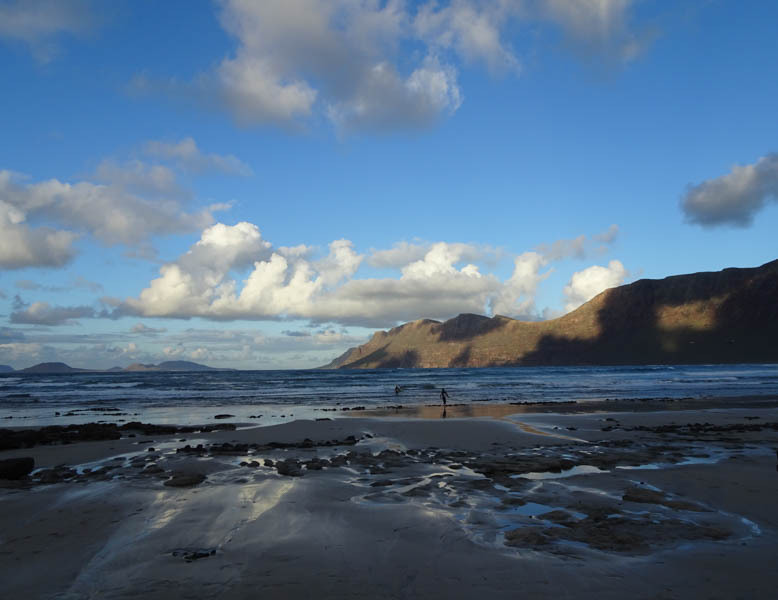 Unfortunately, the uniformly good weather we had been having ended with an unusual weather system that brought some rain, strong winds from the southwest, and big seas. So leaving the marina in the boat was out of the question, but we were still able to explore by land. 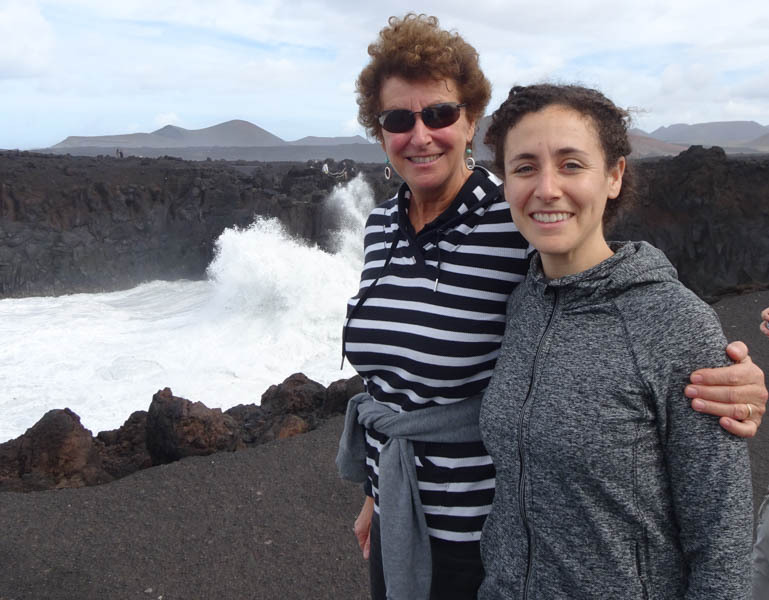 Hannah and Adina went off hiking for two days while staying at an AirBnB near the surfer’s beach, and with the big waves, there was plenty to see. 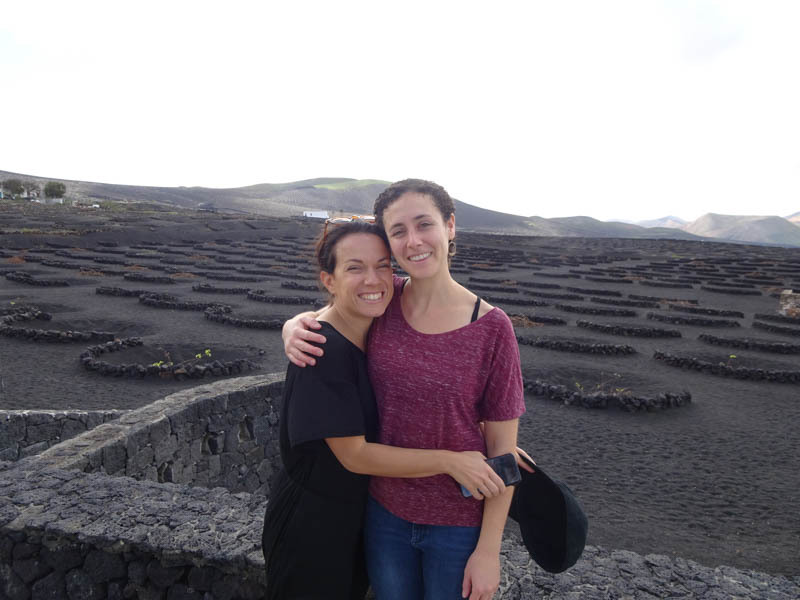 Hannah and Laura at Los Hervideros, famous for its lava cliffs. 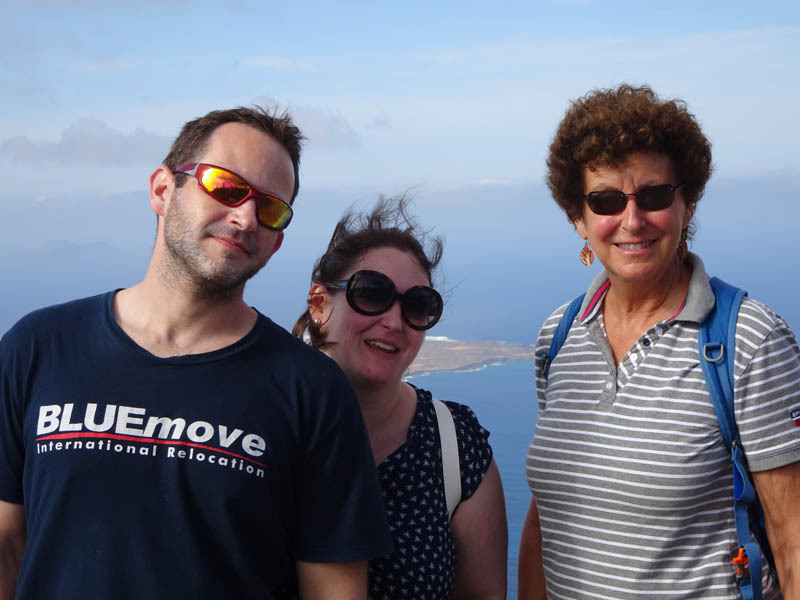 Our good friends Barbara and Frank from the sail boat “Destiny” also caught up with us in Lanzarote. 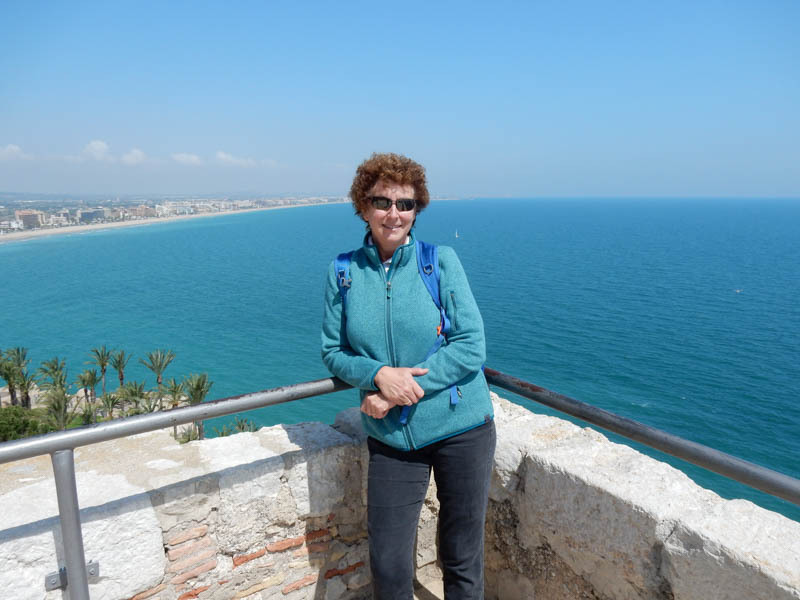 They came while we were in mainland Spain and France and spent a month at the Marina Rubicon. They are now at sea on the way to the Caribbean. 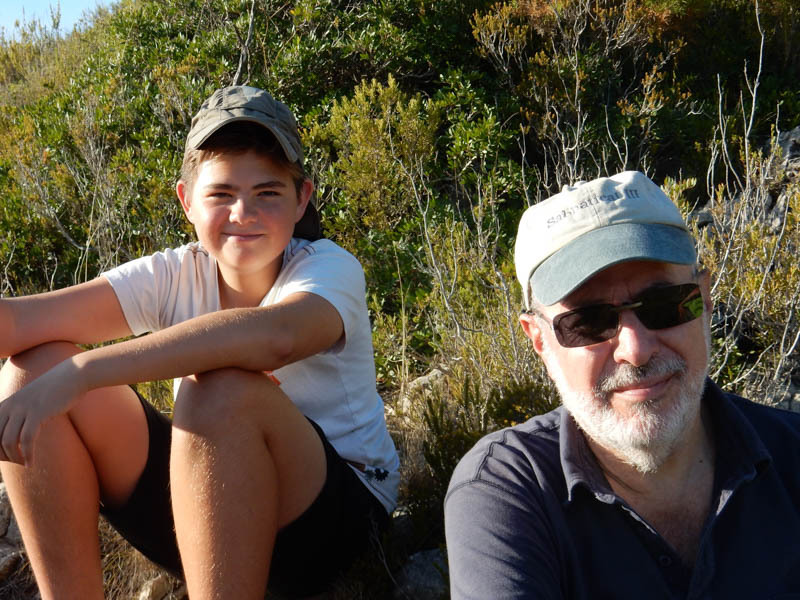 We had some great walks and memorable meals with them. 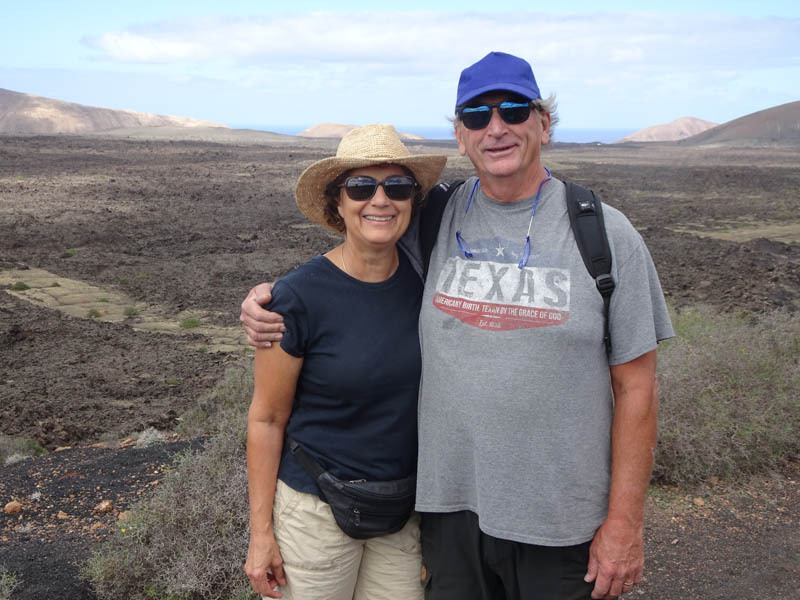 Barbara and Frank on our hike to Caldera Blanca. 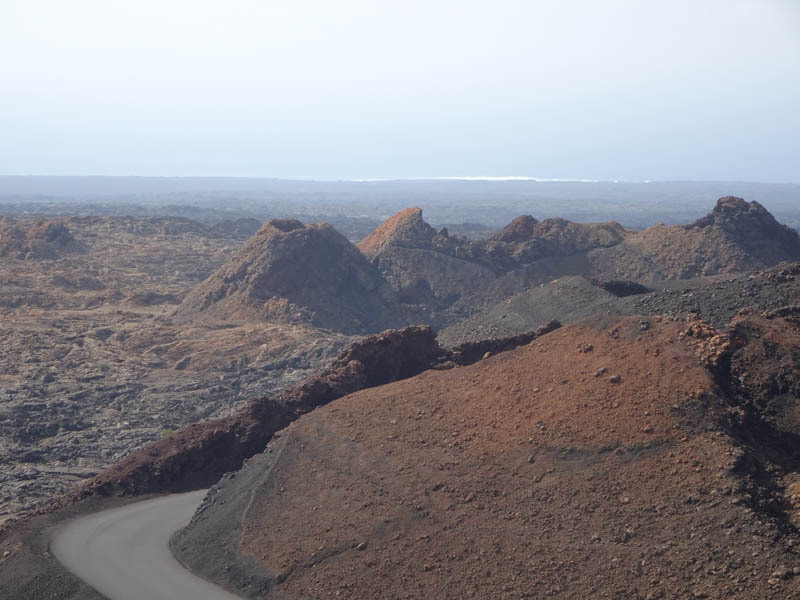 The volcanic plain leading to Playa Blanca is in the background. 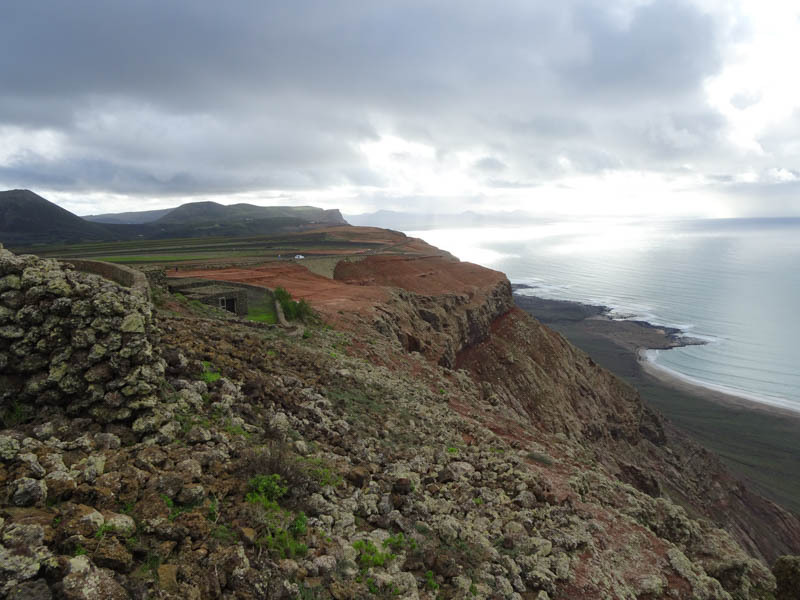 The rain brought our some greenery on the rocky path north of El Golfo. 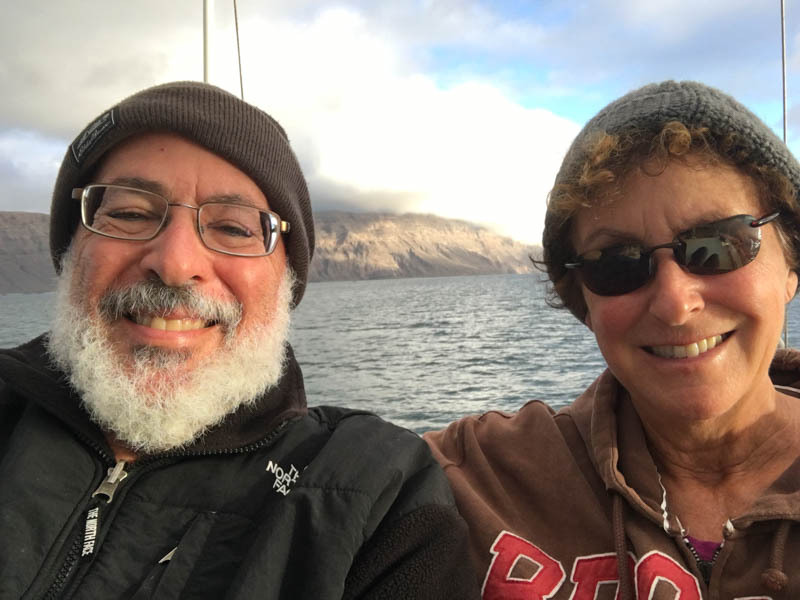 Since Hannah returned to California, we have spent almost all of our time preparing Sabbatical III for our upcoming Atlantic crossing. 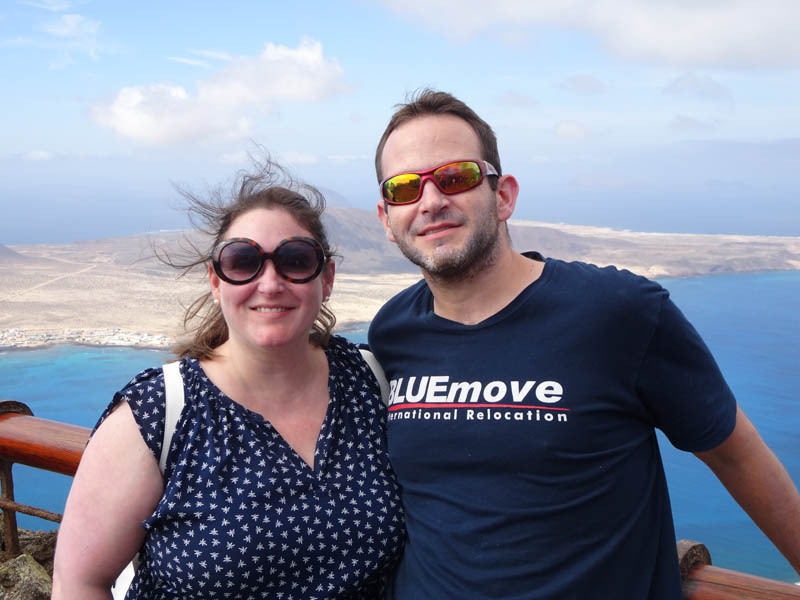 We have a Norwegian couple, Tom Erik and Vivi-Ann, joining us for the crossing. 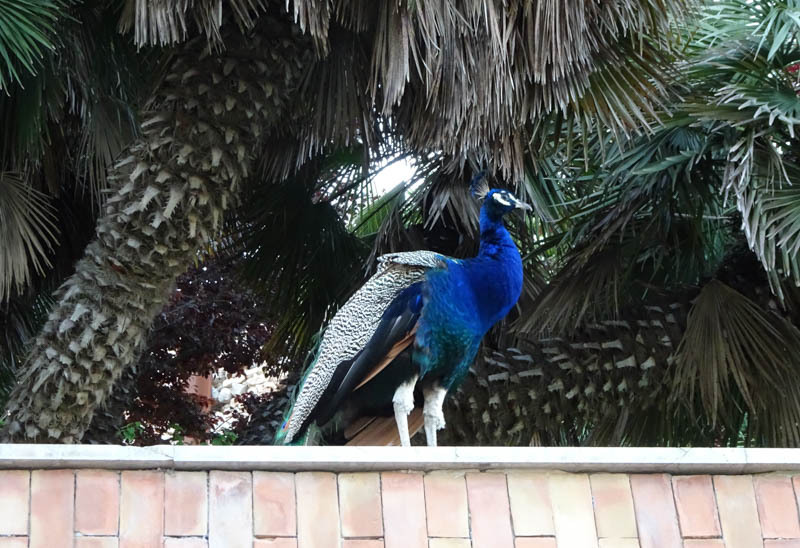 We found them on a volunteer crew site and they even visited us for two days when we were in Valencia in May, We all seem very compatible. Their presence will shorten our usual 6 hour night watches into 3 to 4 hour watches and give us much more time to rest during the day. 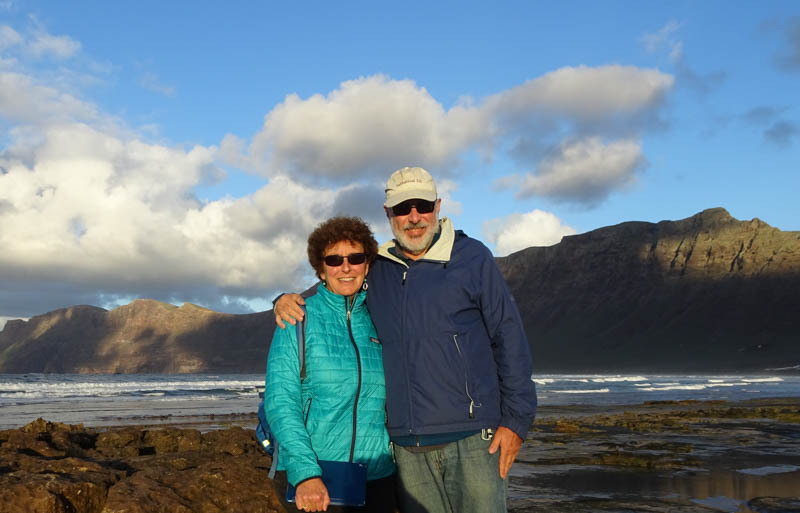 Tom Erik and Vivi-Ann arrive tomorrow (Monday, December 10) and we may start our nonstop crossing of the Atlantic as early as Wednesday (December 12). The boat is in excellent shape and full of more food than we could possibly eat. Laura has prepared a few meals of chicken curry and “Shirley’s” meat balls and put them in the freezer. The forecast is for pretty light winds to start so we may delay our departure for a couple of days. We will post our departure to the blog and you can always check on our position at our shared map page here: https://share.garmin.com/MarkPitt. You will need to scroll out to get an idea of where we are, otherwise you will only see blue ocean on the map. Our position and other relevant data are updated on this map page every 10 minutes once we depart. The sail will take 18 to 21 days. Our destination is the Marina du Marin in Martinique. 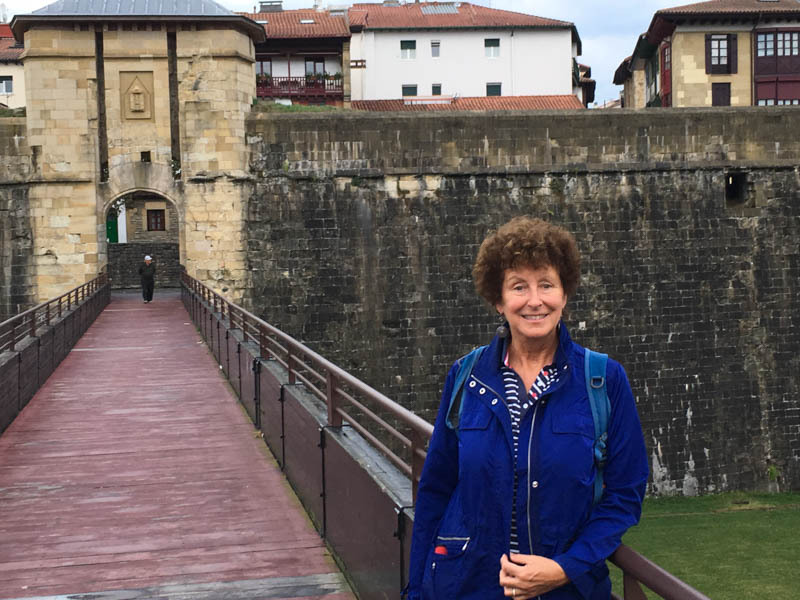 We left Hondarribia, Spain, in the Basque Country, on October 13 heading for Saint-Émilion, 35 km northeast of Bordeaux, and a three hour drive away. 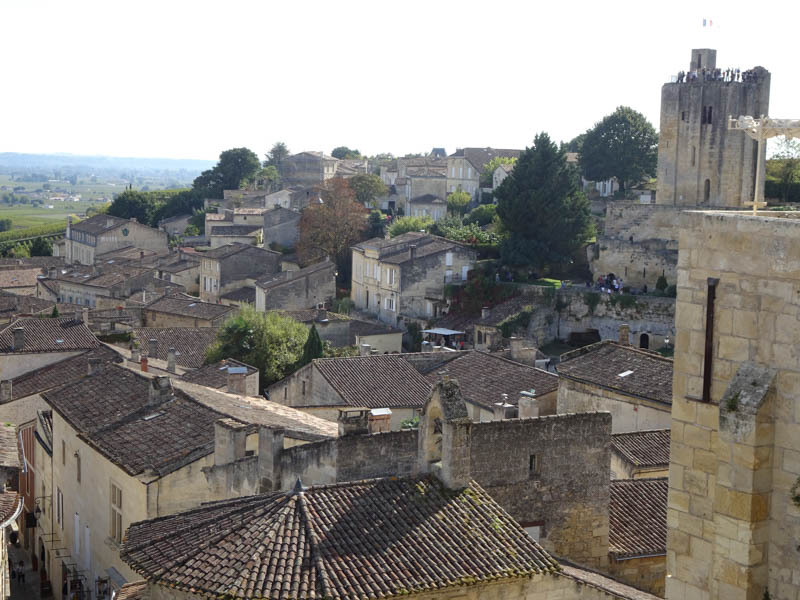 Saint-Émilion’s history goes back to prehistoric times and is a UNESCO World Heritage Site, with churches, ancient structure, and ruins stretching all along steep and narrow streets. 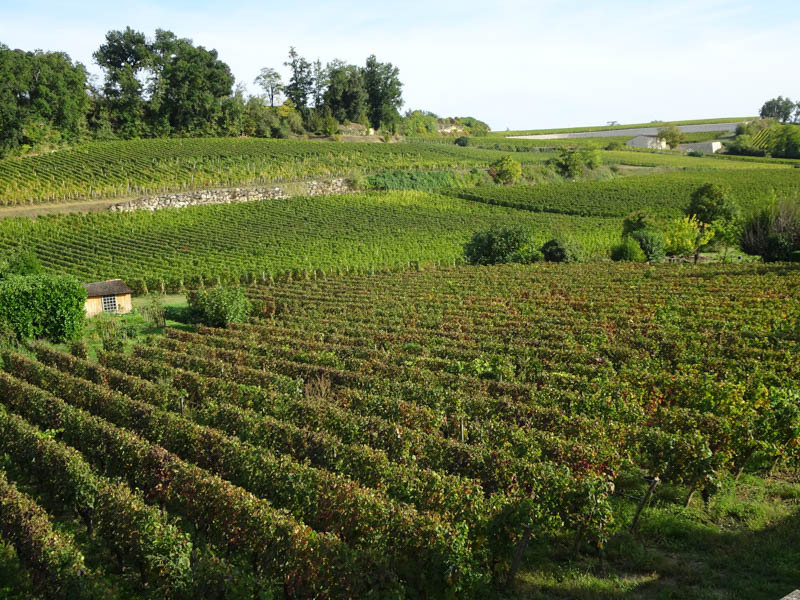 It is one of the principal wine growing areas of Bordeaux. We arrived on a sunny and warm Saturday afternoon and the streets were crowded with tourists. It rained almost continuously the next day and the streets were empty save for the puddles. 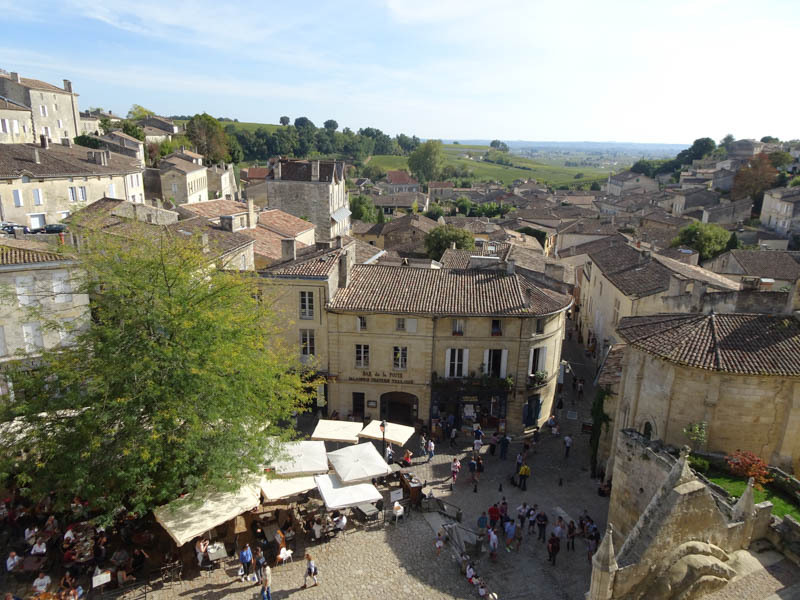 We still squeezed some walks through the picturesque streets in between showers, and did a quick wine tasting at a vineyard outside of town on the drive north the next day. 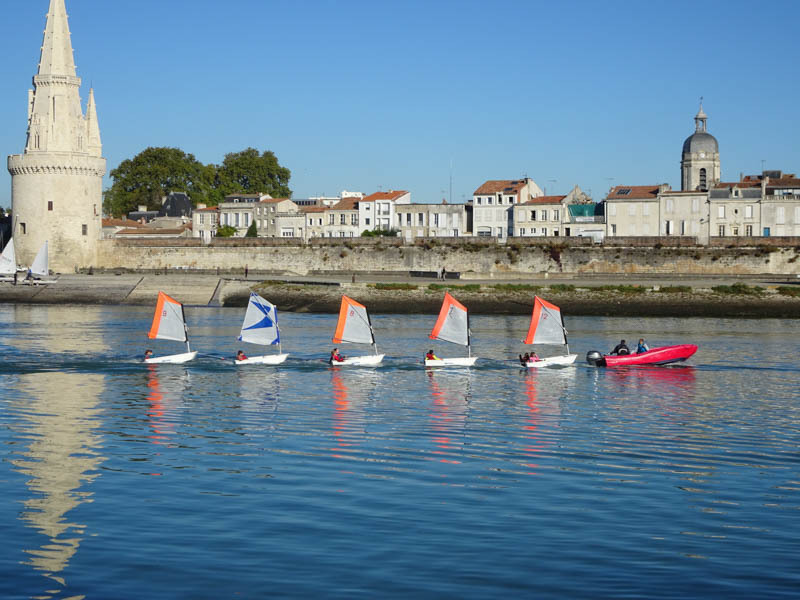 From Saint-Émilion we drove two hours north to the beautiful city of La Rochelle on the Bay of Biscay in the Charente-Maritime department. 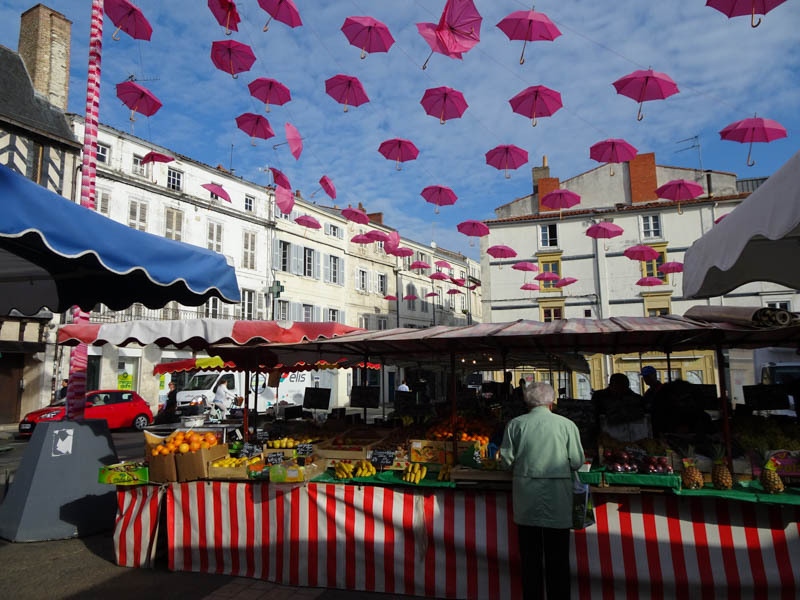 La Rochelle has special meaning to us. 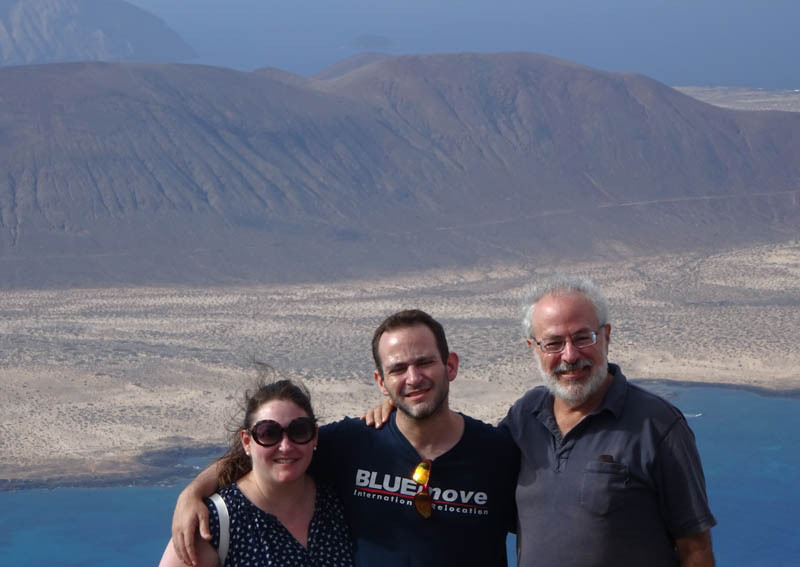 It is the place where Sabbatical III was built by the Amel shipyard, and this was our third trip to this lovely town. Our fond recollections of La Rochelle arise not only from the thrill of taking possession of the boat that has been the center of our lives these past 15 years, but also from the charming and authentic nature of this town of 75,000 and, perhaps strangely, from the unforgettable Soupe de Poisson at Bar André on the waterfront. 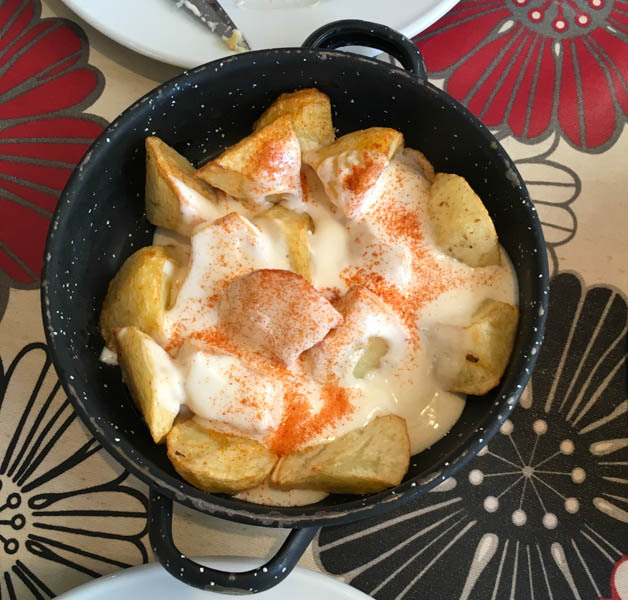 The Amel staff took us to Bar André during both of our visits in 2003 and introduced us to the Soupe de Poisson. 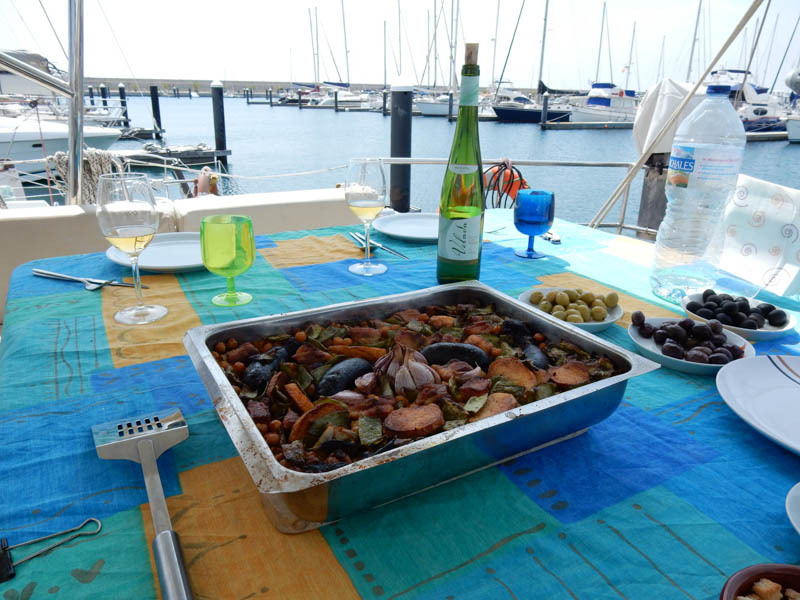 It was our “go to” meal during the chilly weeks of late October and early November 2003 when we were living on-board the brand new Sabbatical III in the nearby Marina Les Minimes. 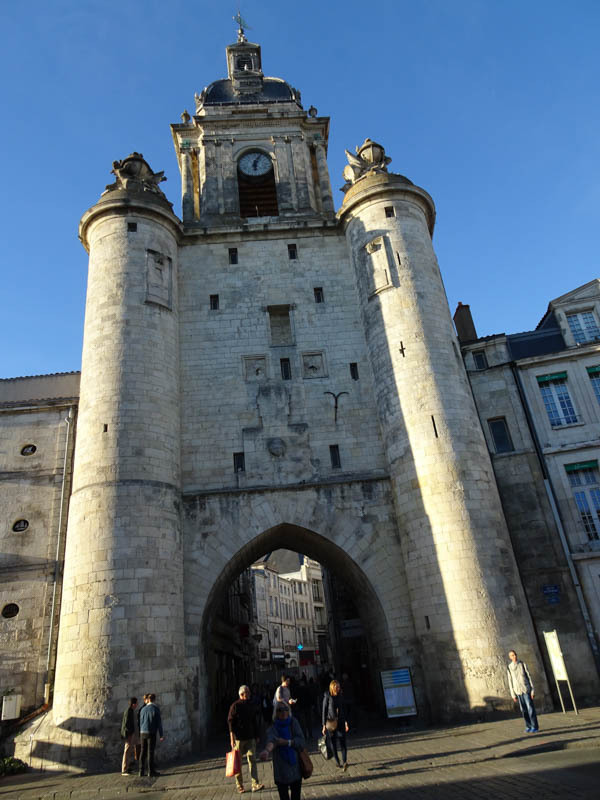 So on the 15th birthday (to the day) of Sabbatical III, we had another wonderful stay in La Rochelle. 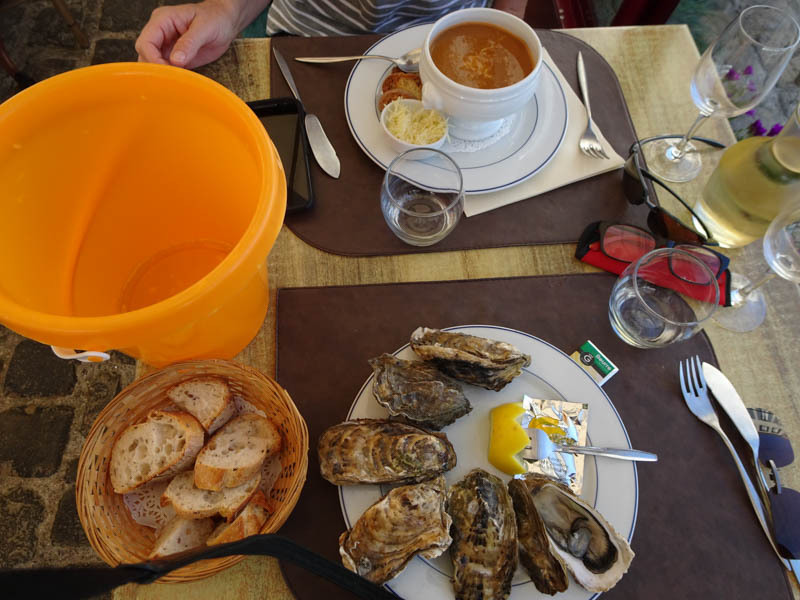 The Soupe de Poisson was as good as we remembered and the town was even better in unusually warm and sunny weather. 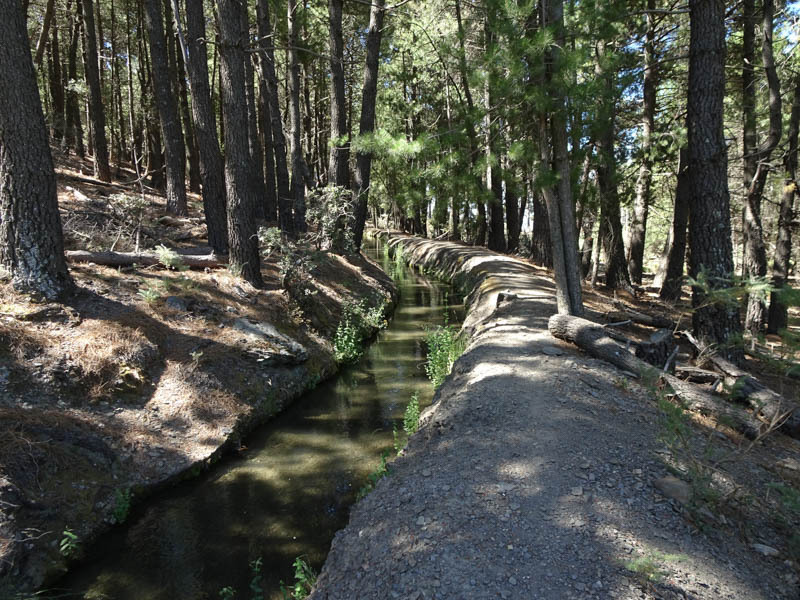 We stayed in a quiet hotel located within the long narrow park in town and found that we could walk almost everywhere from there. We arranged a test sail of the new Amel 50 on a beautiful but almost windless day. 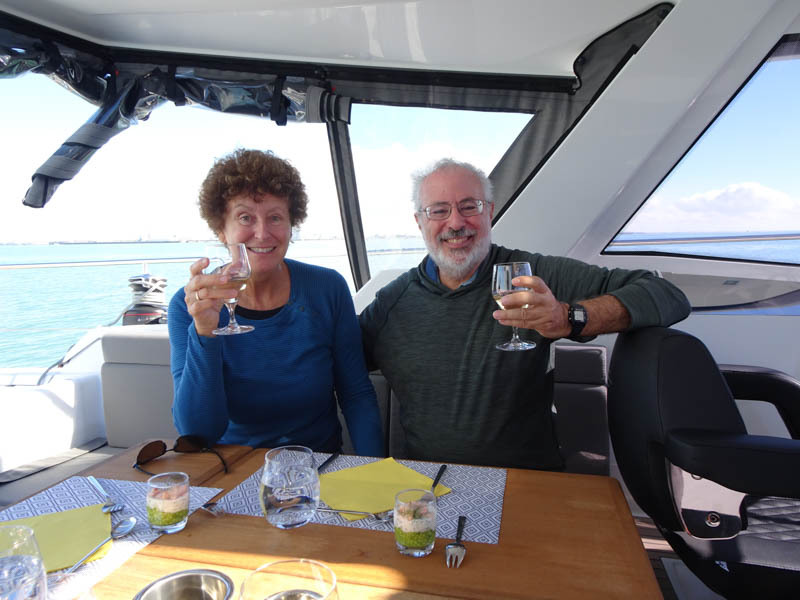 A hostess aboard cooked us a multi-course meal as we slowly sailed from La Rochelle to the nearby island of Île de Ré. 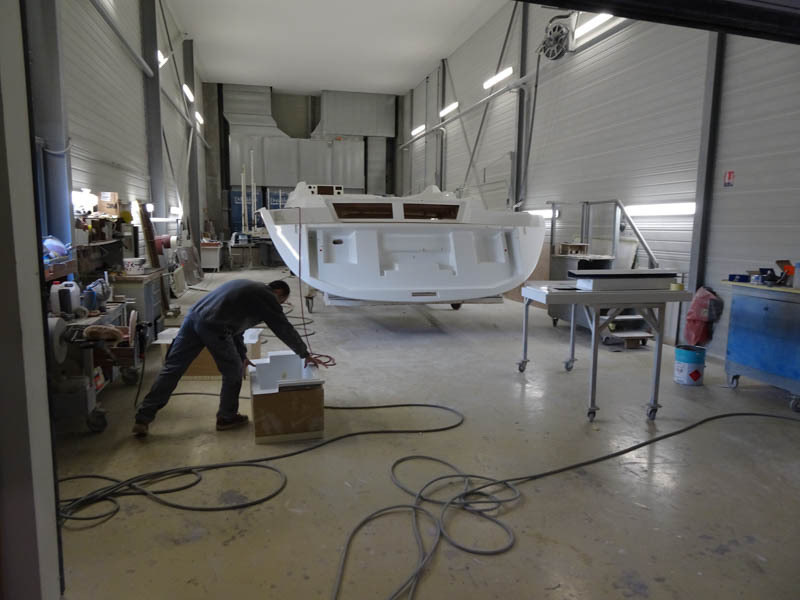 The boat was fantastic with the easy sailing pedigree of previous Amel boats like our Super Maramu but also new features and interiors creating more light and space. 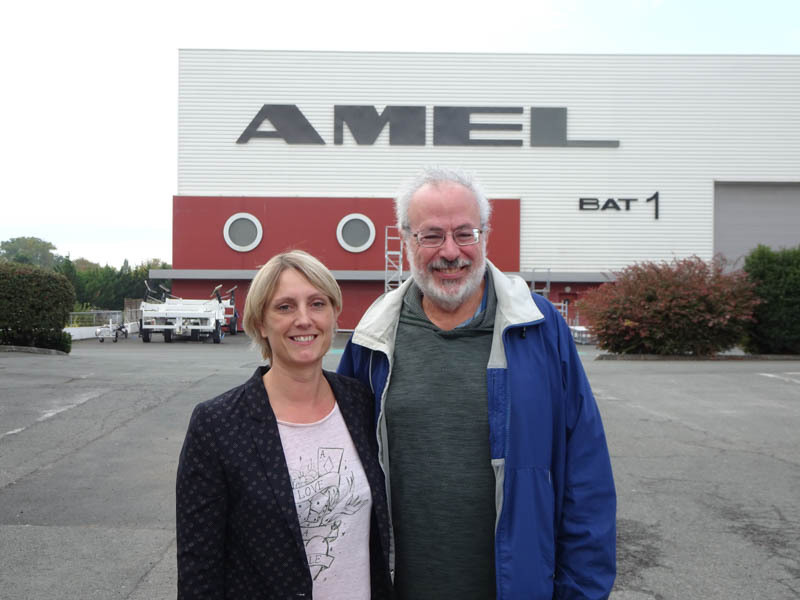 We also visited the Amel factory and viewed the process of building an Amel 50. 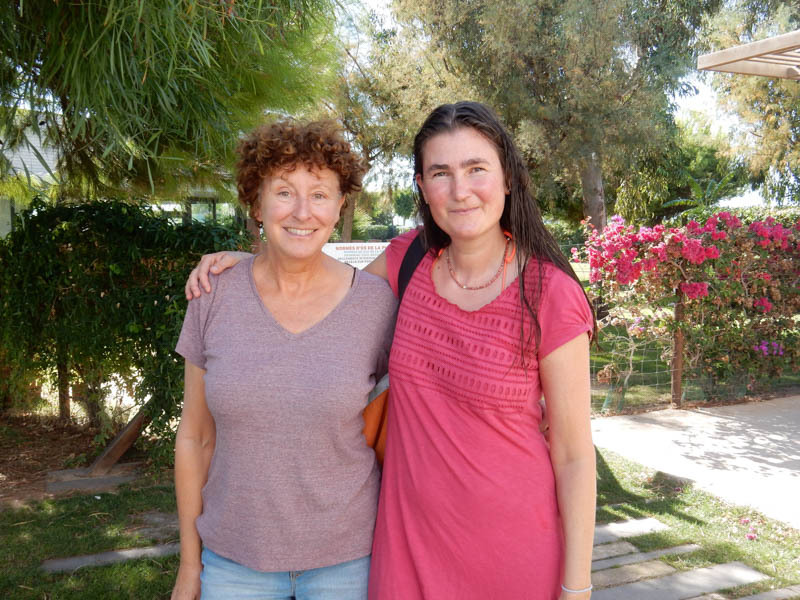 Plus, I finally got to meet Maud Touillet, the “service after sales” representative that I have been dealing with for the past few years via email. Who is this caring and efficient person who answers my emails with the information that I need and sends me parts to where ever I might be? Now I know. 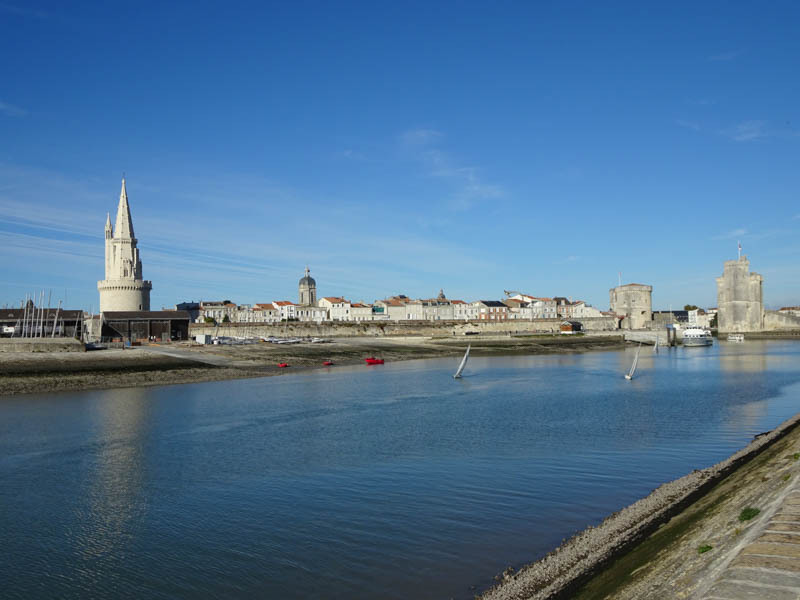 On our last day in La Rochelle, we drove over the bridge to Île de Ré, described as the “Martha’s Vineyard of France.” The island has a network of cycle tracks, and many residents rarely use cars for transportation. 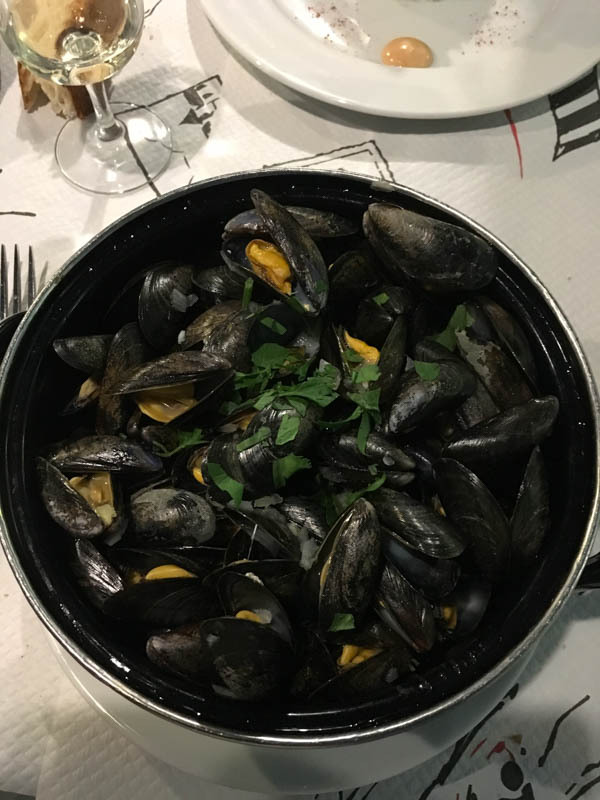 They are famous for their oysters, mussels, and fish. 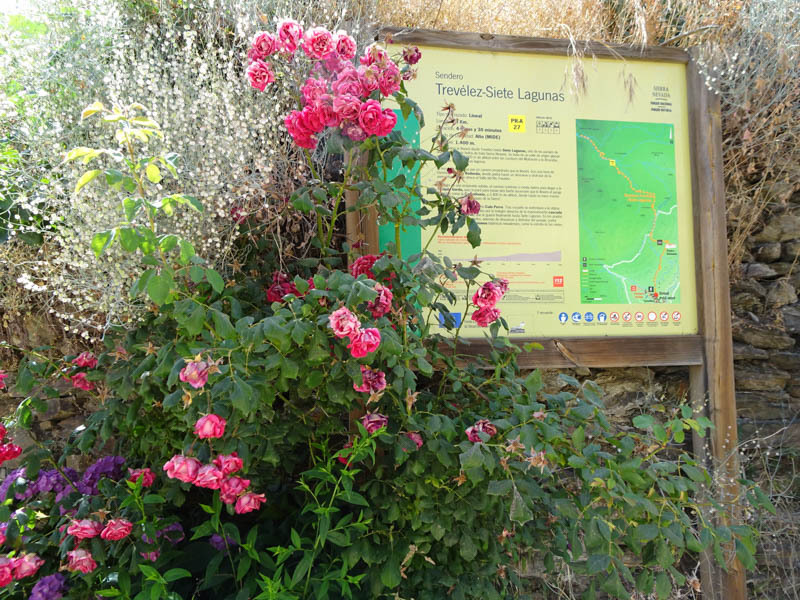 We walked for miles on the northern shore promenade, had a wonderful lunch, then walked along the long, wide beaches of the southern shore before returning across the 3 km bridge to La Rochelle. 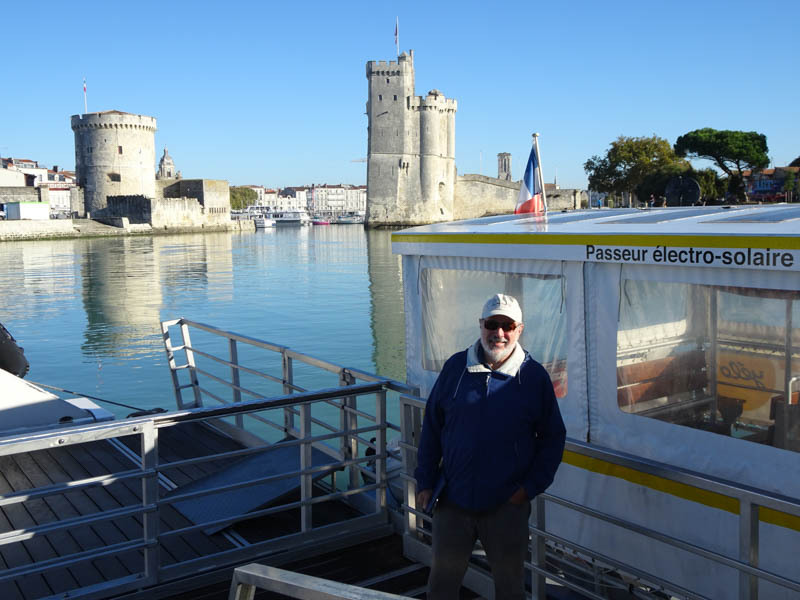 We left La Rochelle on October 20 and drove all the way back to the Basque country in one day. 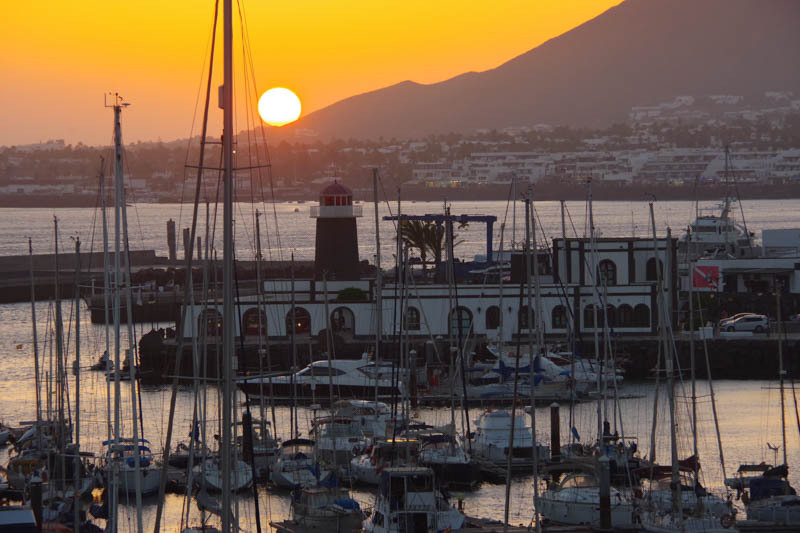 We flew back to Lanzarote Island the next day and returned to Sabbatical III at the Marina Rubicon, where we still remain. 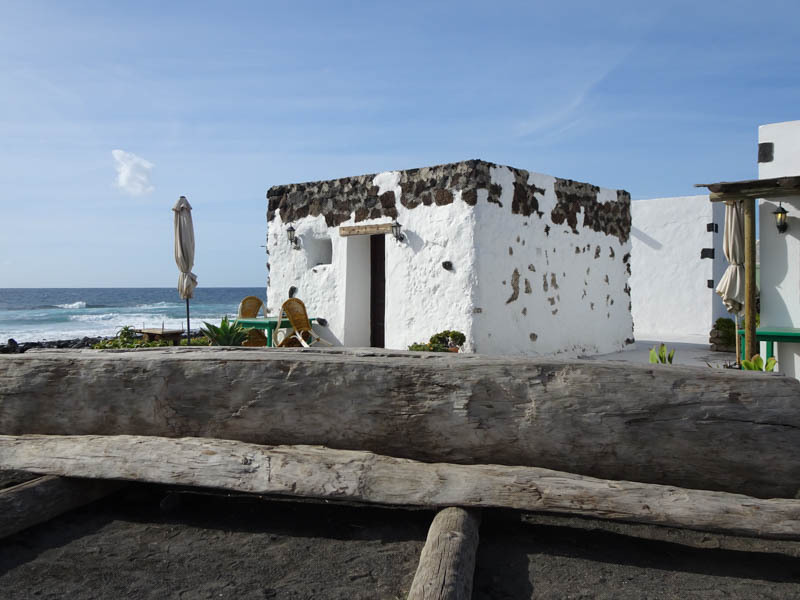 The Canary Islands are a popular destination for European tourists and many discount airlines fly there from a number of mainland European cities. 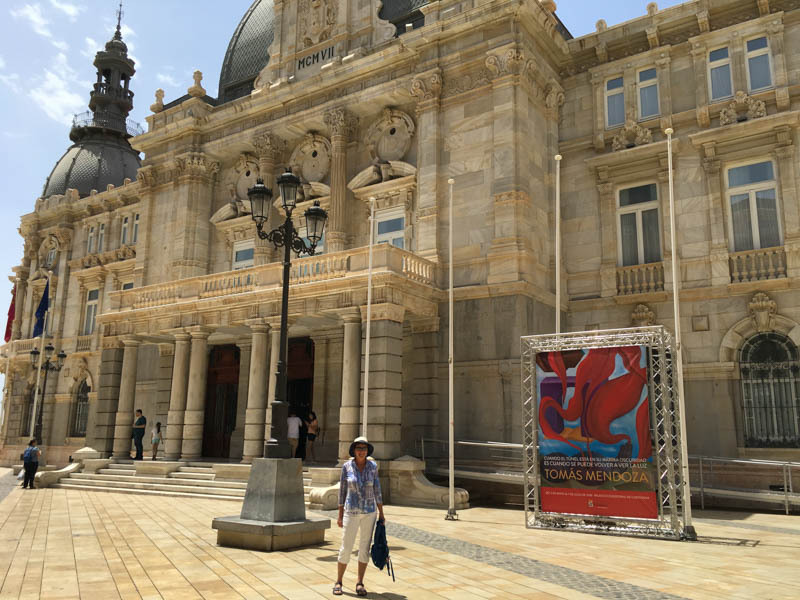 Last month we looked for cheap nonstop flights from Lanzarote and found one to Bilbao in Basque Country, so we bought tickets. 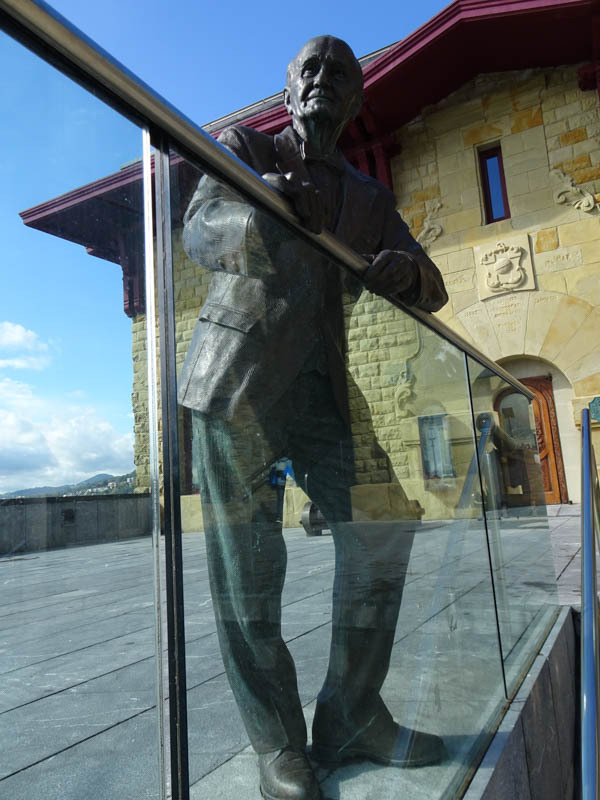 On October 7, we flew into the Bilbao airport and took a 75 minute bus ride directly from there to San Sebastián, the cultural capital of the Spanish Basque region. 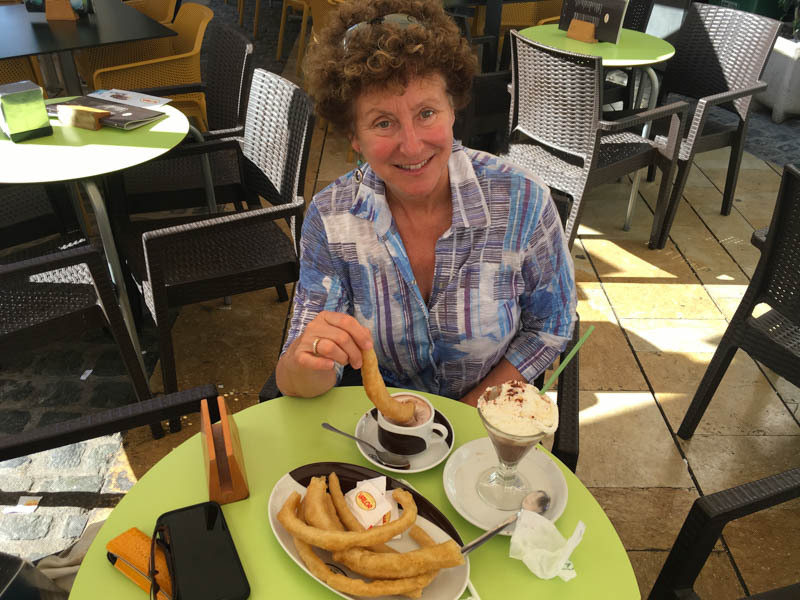 We spent four days in San Sebastián followed by two days in Hondarribia, a beautiful town that is the home town of our dear friend Irene. 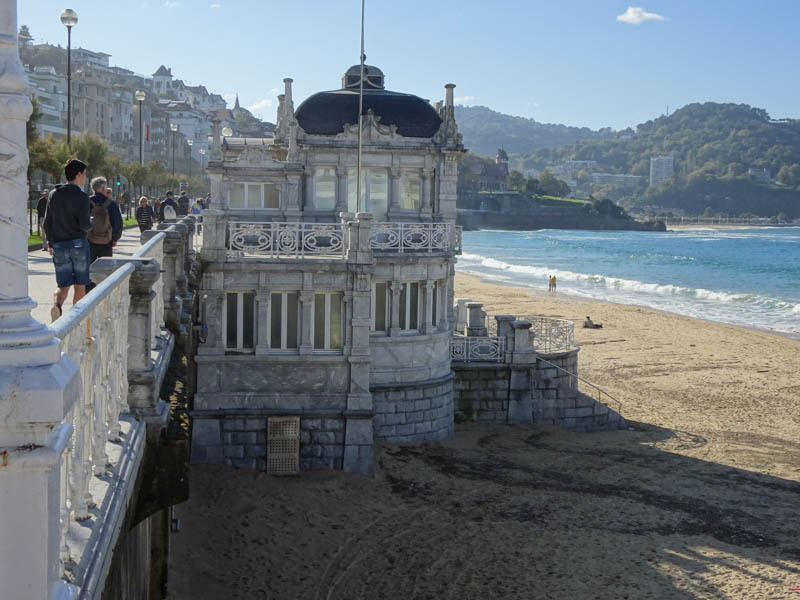 San Sebastian is considered by many to be the world’s top food spot. 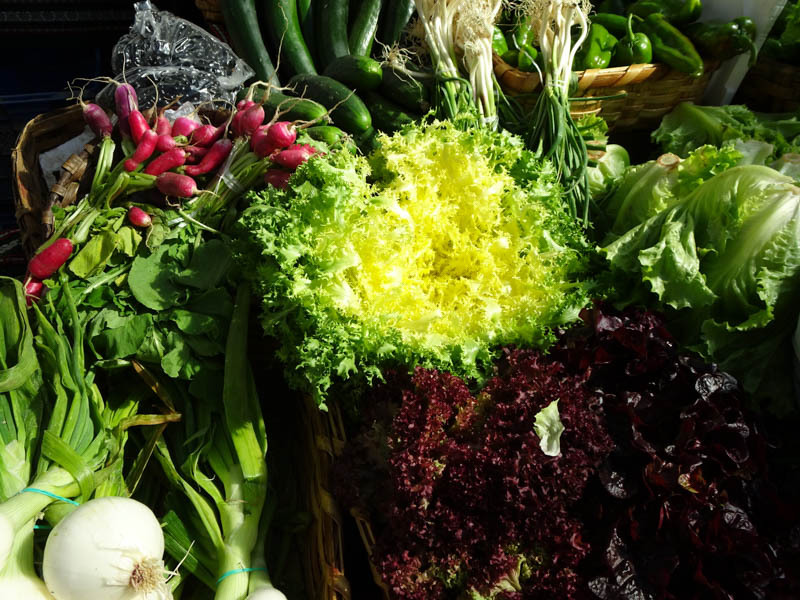 It has more Michelin stars per capita than anywhere else in the world. 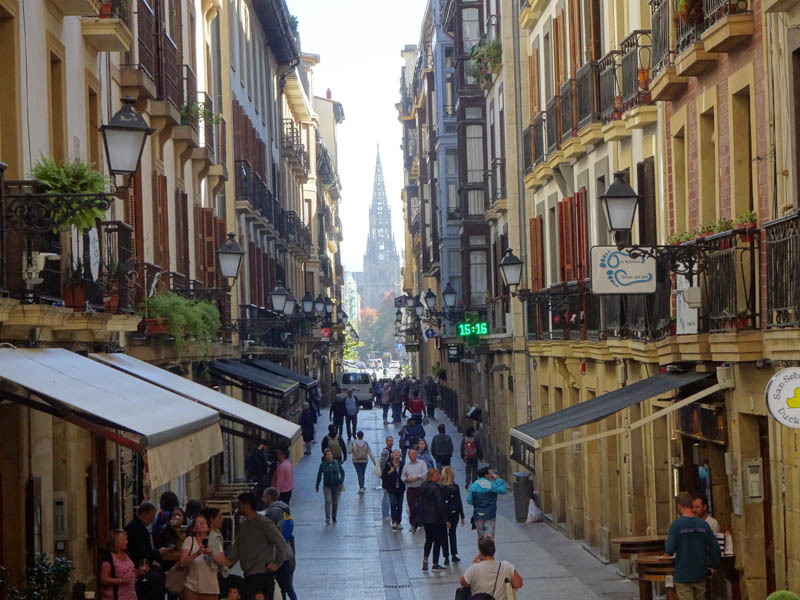 But what makes San Sebastián (or Donostia as it is known in the Basque language) especially appealing is the quality of the everyday food, in particular the hundreds of pintxo bars. 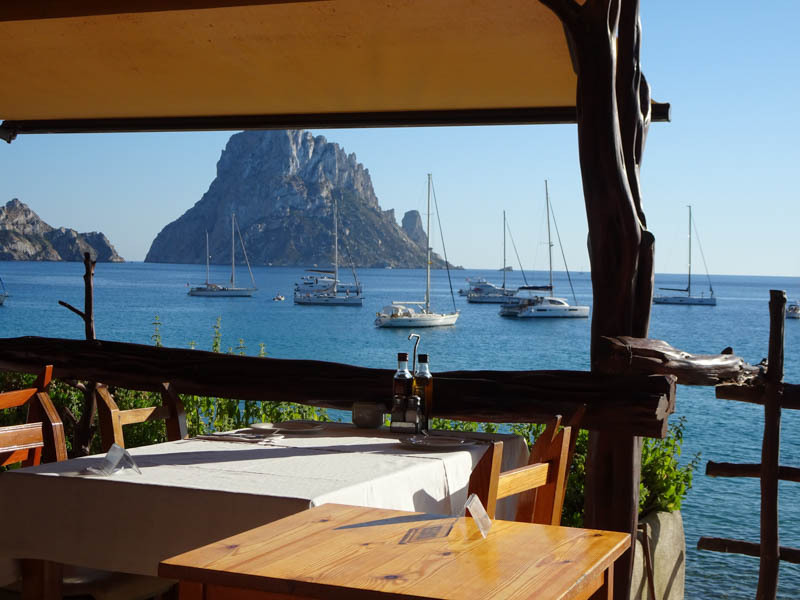 These are simple wine bars selling everything from traditional snacks to high-end gourmet dishes in small portions – and with small prices. 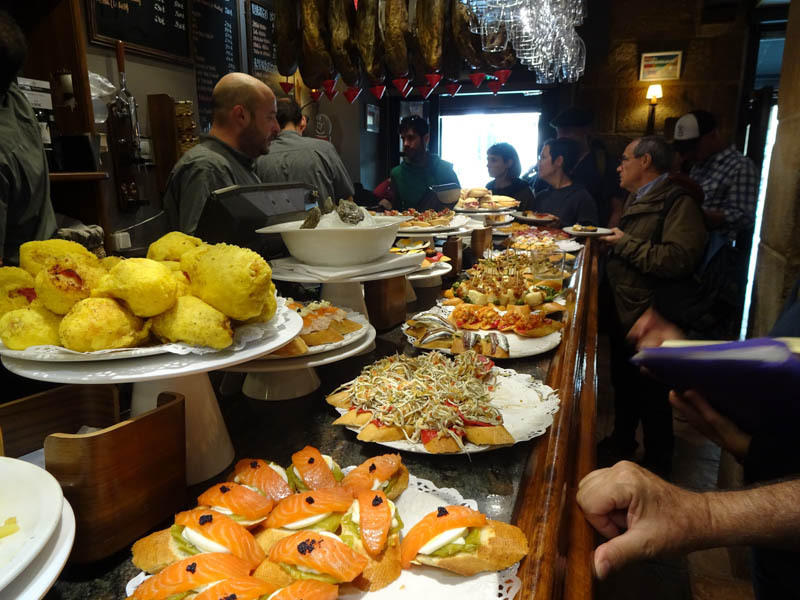 Going for pintxos means bar-hopping your way through the city, eating a few plates at each place before continuing. Everything is laid out on the bar for you to see before choosing, We almost always ordered Spanish cider (or sidra) as our accompanying drink. 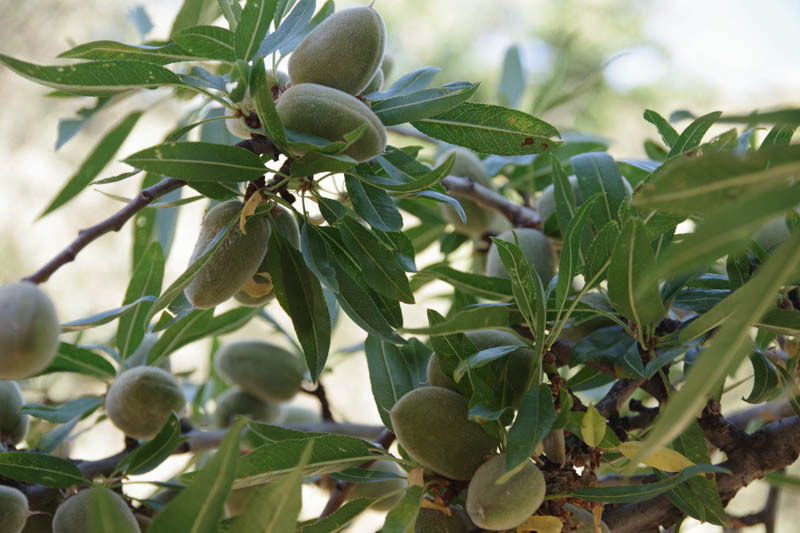 Sidra is fermented naturally and has an alcohol content similar to beer. 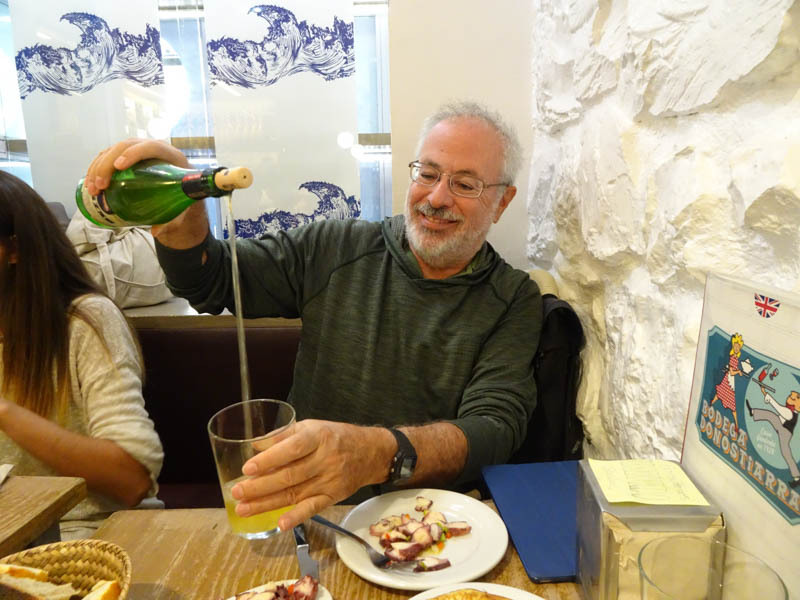 Spain has a custom known as “throwing the cider.” A server pours the cider from a height of approximately one meter to aerate and enhance the aroma and flavor of the cider. 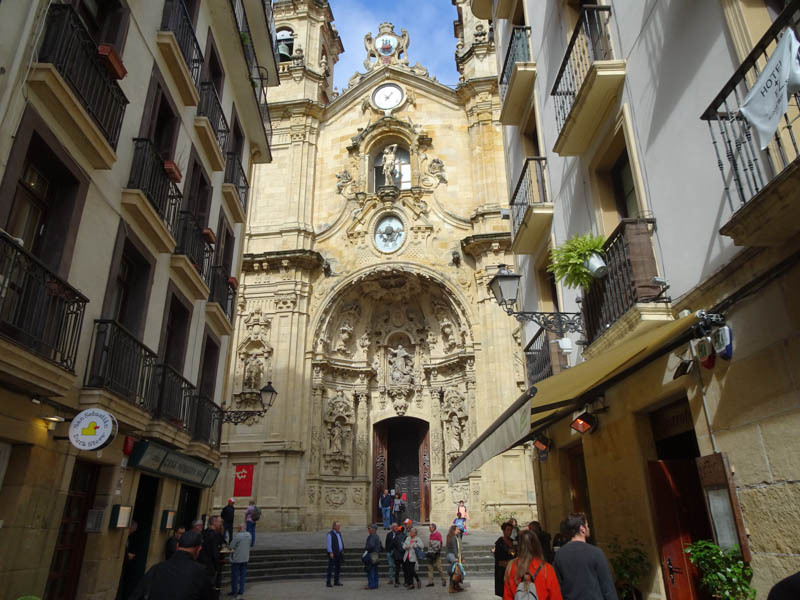 The weather was almost ideal the whole time we were in San Sebastián and the city was perfect for walking. 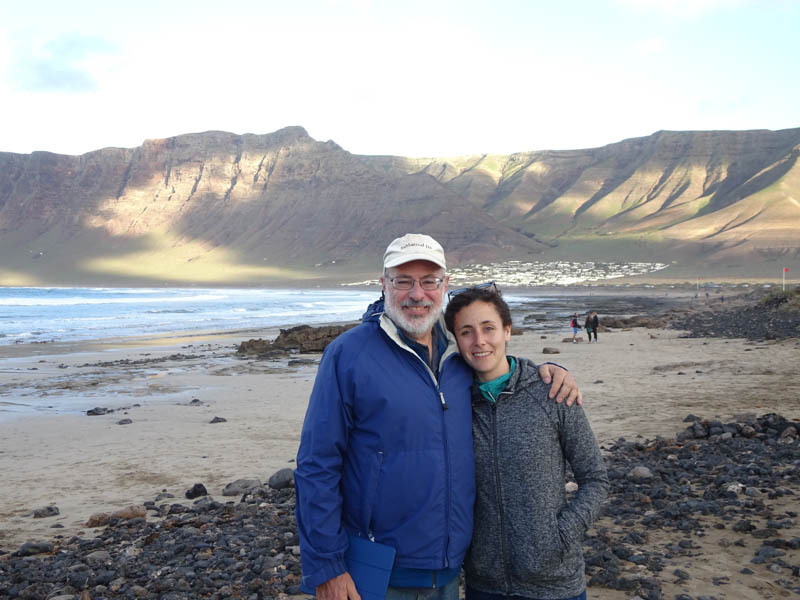 We walked along the river, under a cliff face with breaking waves below, and along a long sandy beach. 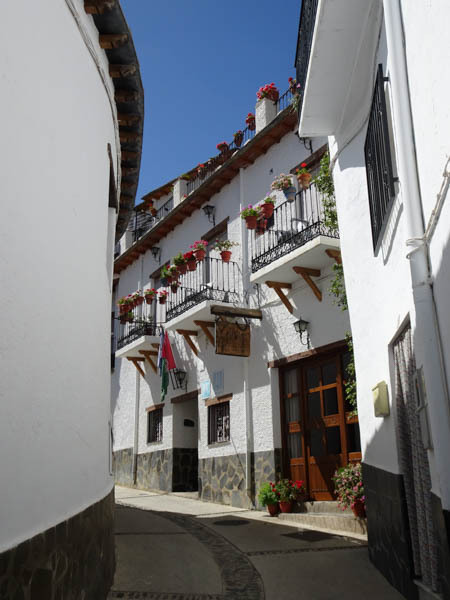 Plus, of course, through the beautiful old parts of the city. 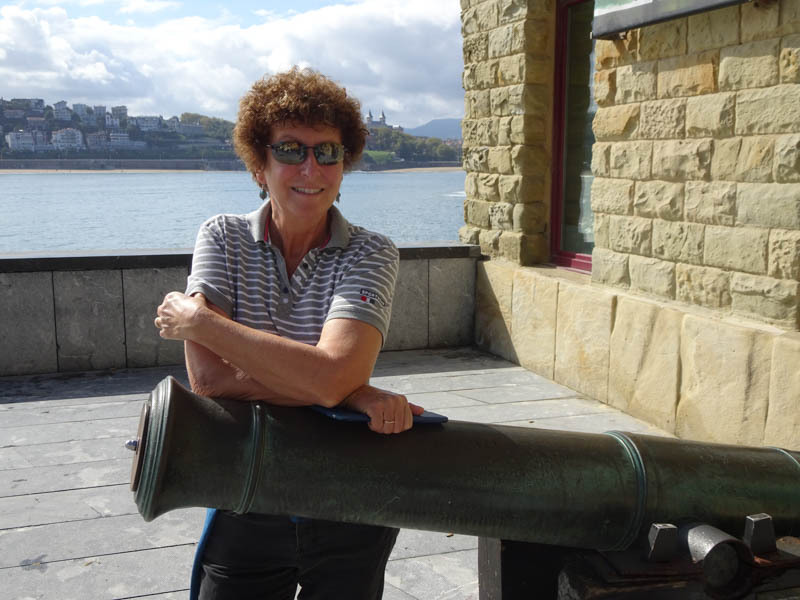 On October 11, we picked up a rental car in San Sebastián and drove west along a beautiful high road that roughly followed the coast heading for the small coastal towns of Getaria and Zumaia. 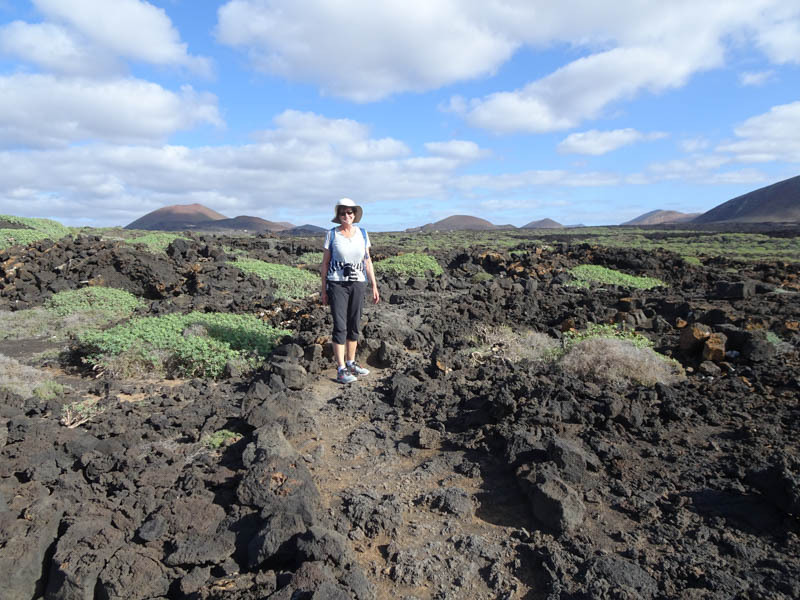 The greenery of the countryside was almost overwhelming for us after two months on the barren volcanic island of Lanzarote. 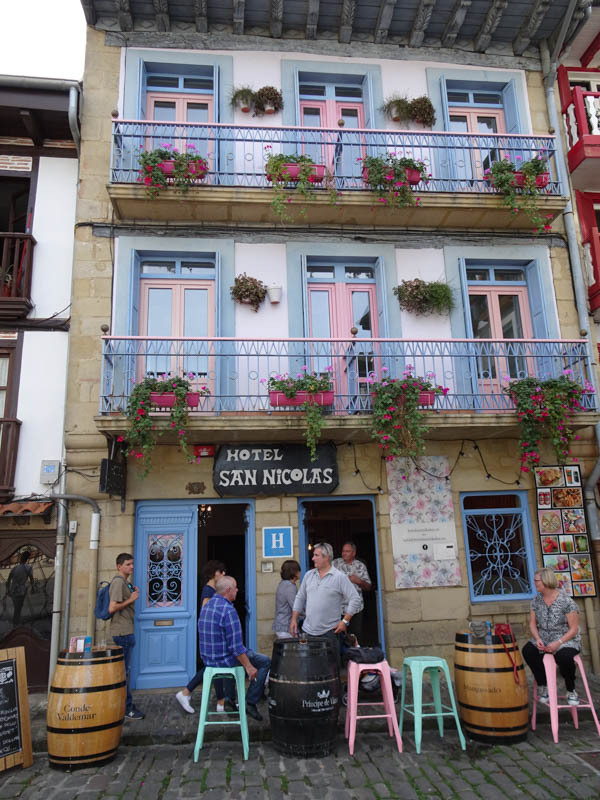 Before dark, we turned and headed east to our next destination, the Basque town of Hondarribia, on the French border. 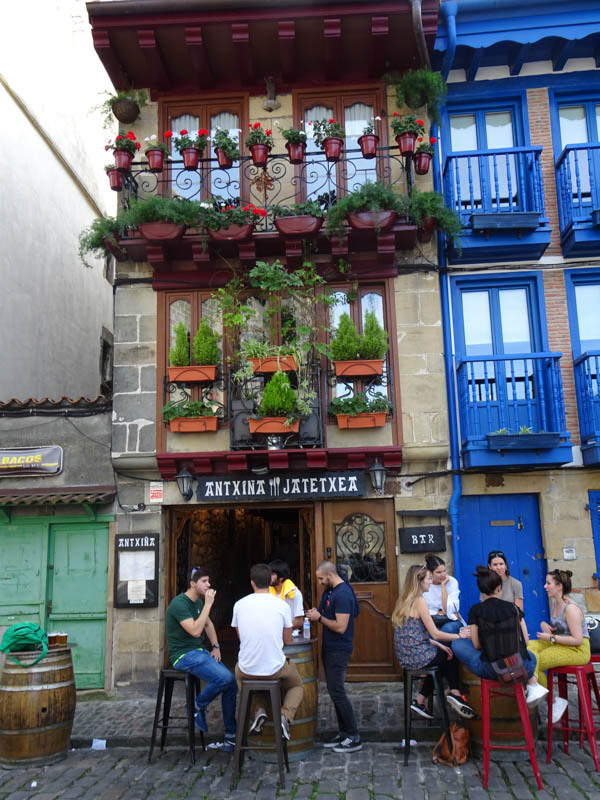 Hondarribia has an ancient old quarter set on a hill with walls and a castle, and a newer section nearby with excellent pintxo bars. 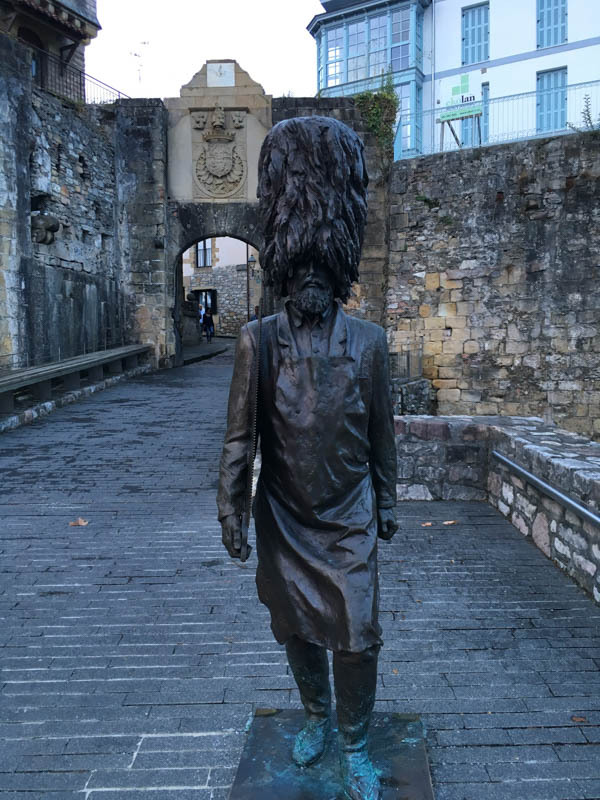 After two nights in Hondarribia we drove to Saint Emilion in Bordeaux and La Rochelle in Charente-Maritime. That trip is the subject of our next blog post. 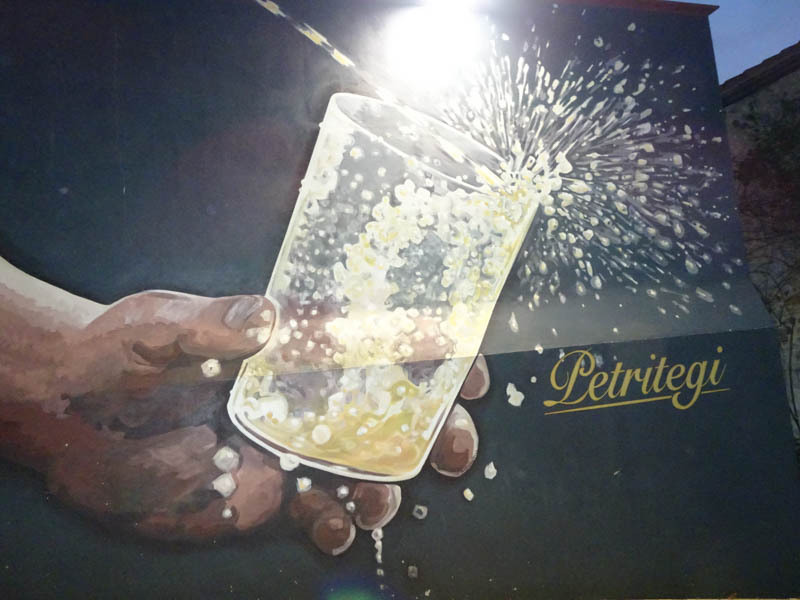 However, on the way back to catch our return flight from Bilbao, we stopped for the night at a cute hotel next to the Petritegi Cider House in Astigarraga (outside of San Sebastián), where we had booked a meal. At the cider house, everyone sat on long benches next to “picnic” tables. 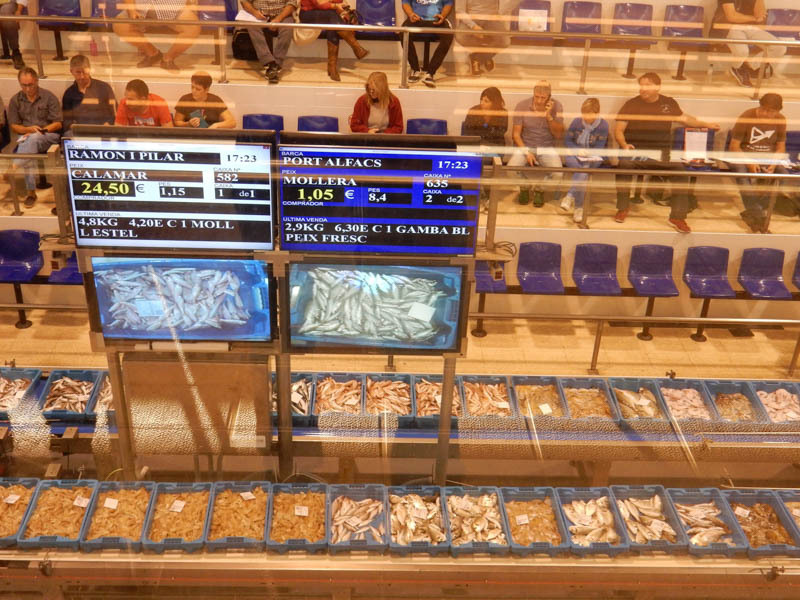 We were served many courses of delicious local food plus all of the sidra we wanted. To get sidra, you left the dining hall and went to the large fermenting room where there were many numbered barrels of sidra, each slightly different. 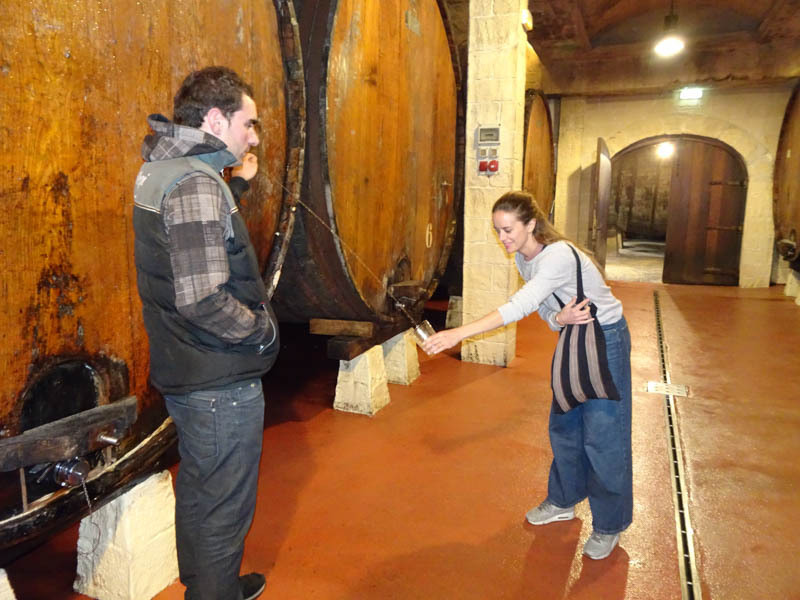 We pointed to the barrel we wished to sample, and a young man would pull a cork to let the sidra stream out into your glass held at least one meter away. A lot of sidra ended up on the floor but as we became more proficient at judging the stream, most wound up in our glass. Good thing the the hotel was just a 1/2 mile walk away. We have been in the Marina Rubicon for 8 days now and we are quite content here. 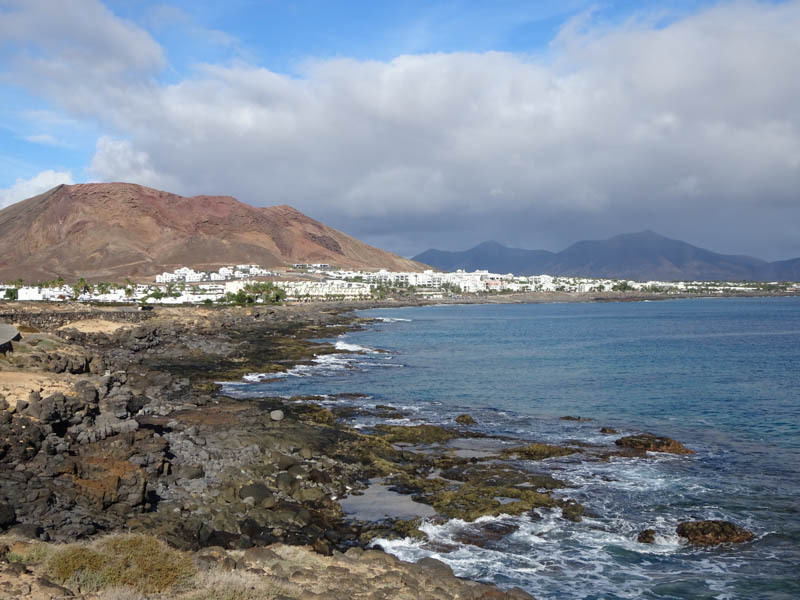 We rented a car for three days and did a small tour in the southern half of the island, plus, of course, a trip to the supermarket in the main city of Arrecife. 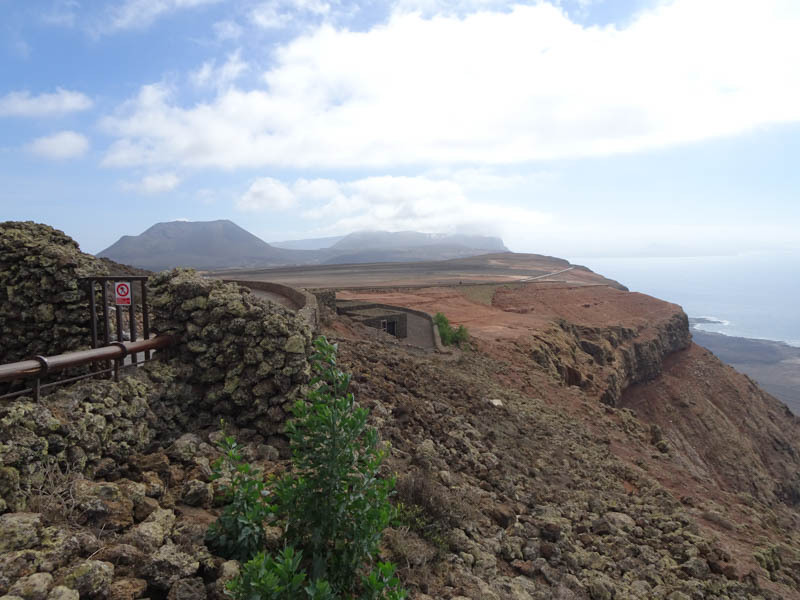 The island is completely volcanic and quite barren. 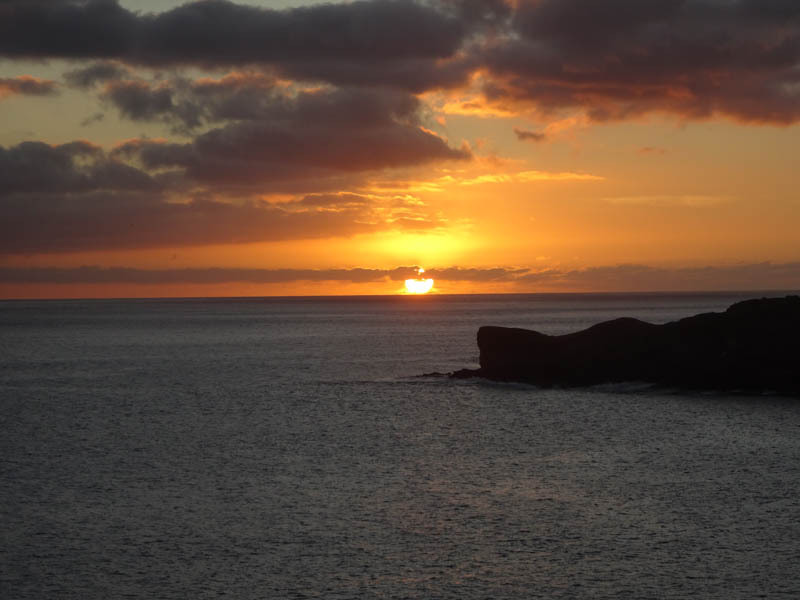 There were repeated volcanic eruptions from 1730 to 1736 that covered more than one-quarter of the island in lava. The lava flows are still quite obvious. 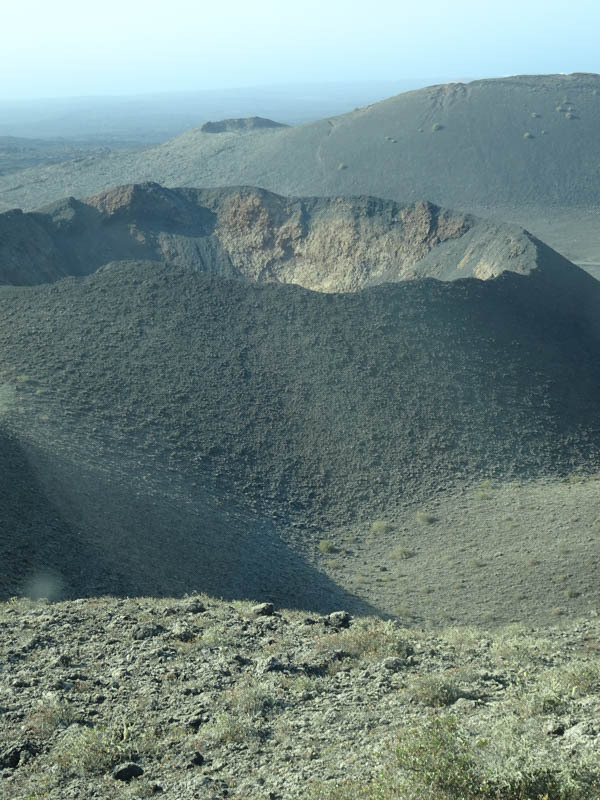 There is very little vegetation, mostly black volcanic cinder, ash, and rock. 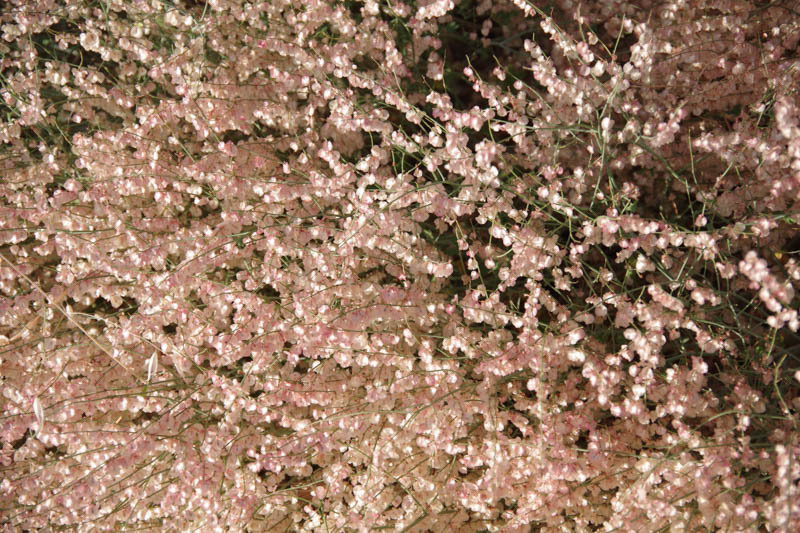 Beautiful in its own way. 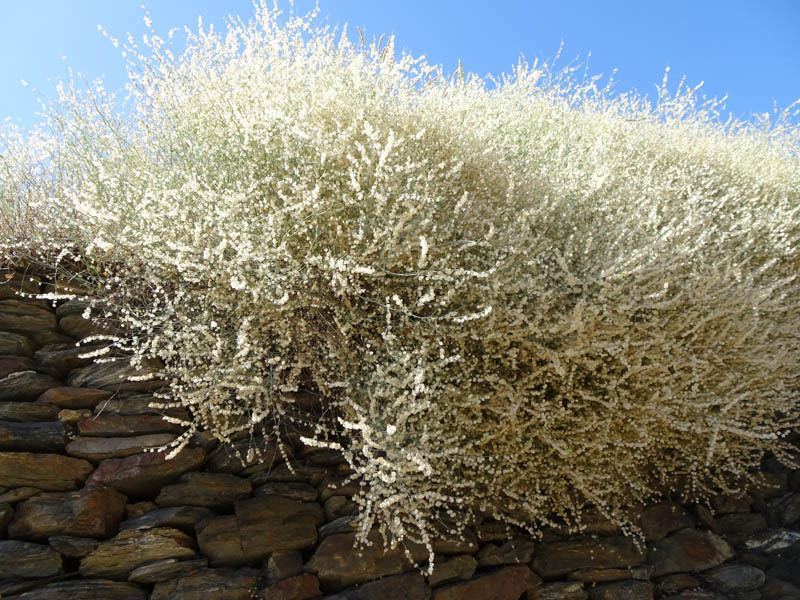 There is little rainfall and no natural vegetation to retain any rain that falls. 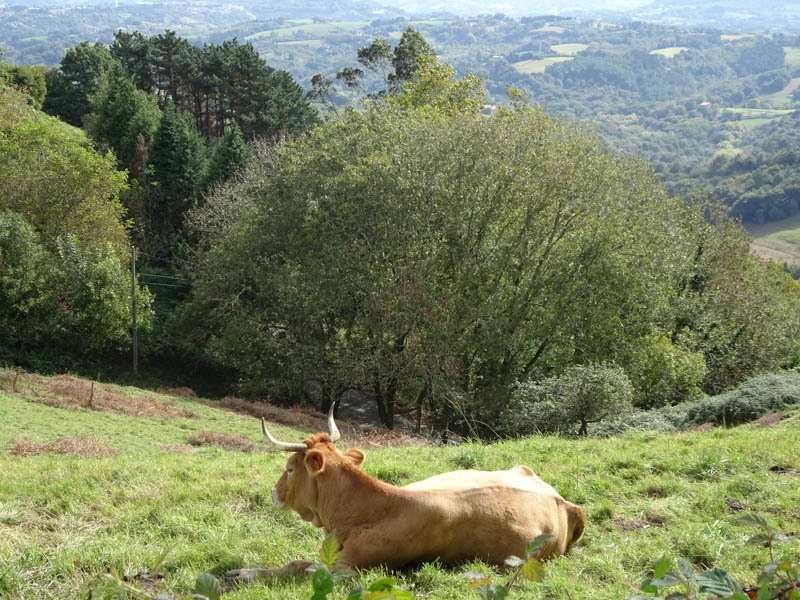 So it is a bit of a surprise that wine production is the dominant agricultural pursuit and has been for a few hundred years. 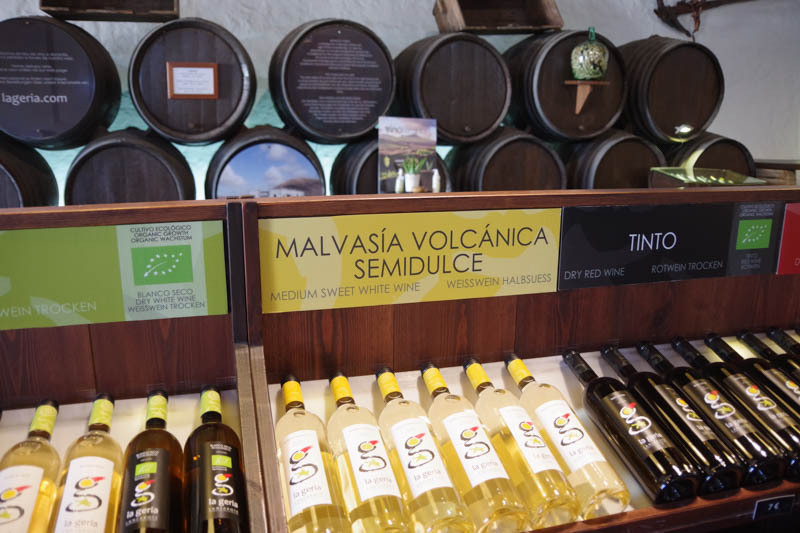 Here they grow the Malvasia grape in a unique way, and produce a wine that was praised by Shakespeare hundreds of years ago. 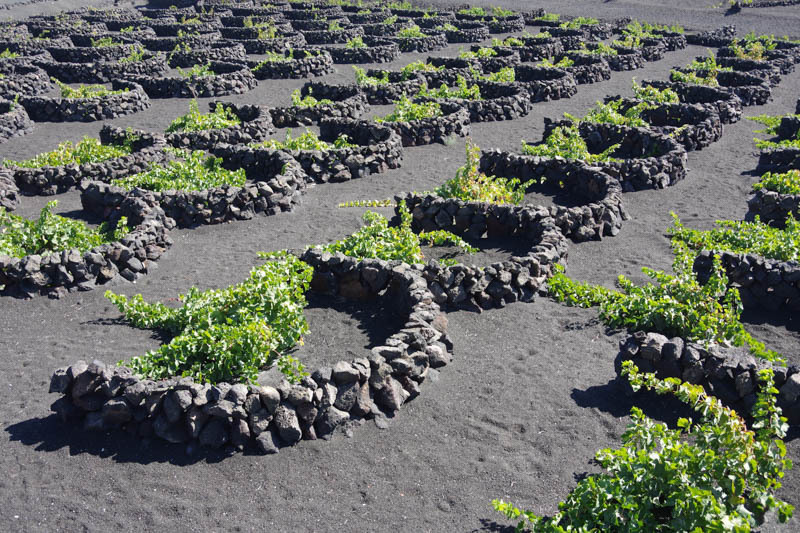 Grapevines are placed in a hole scooped out of the volcanic ash. One vine per hole. 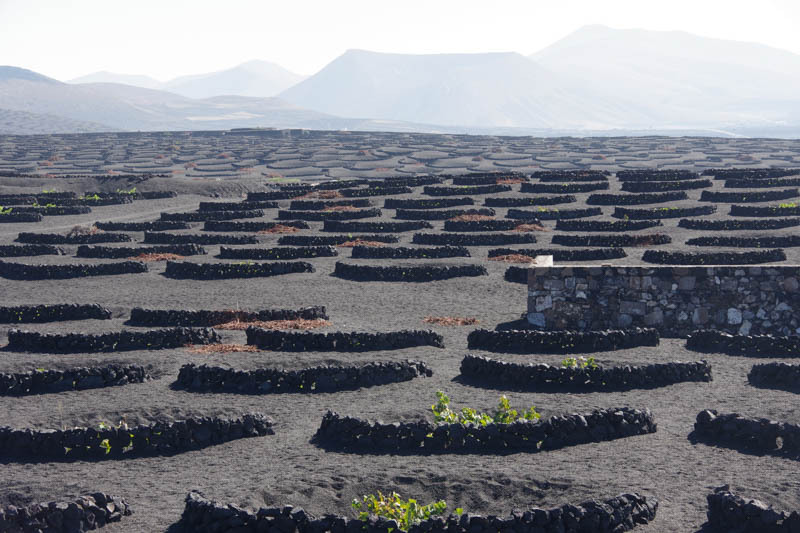 The vines are covered with volcanic gravel (picón). 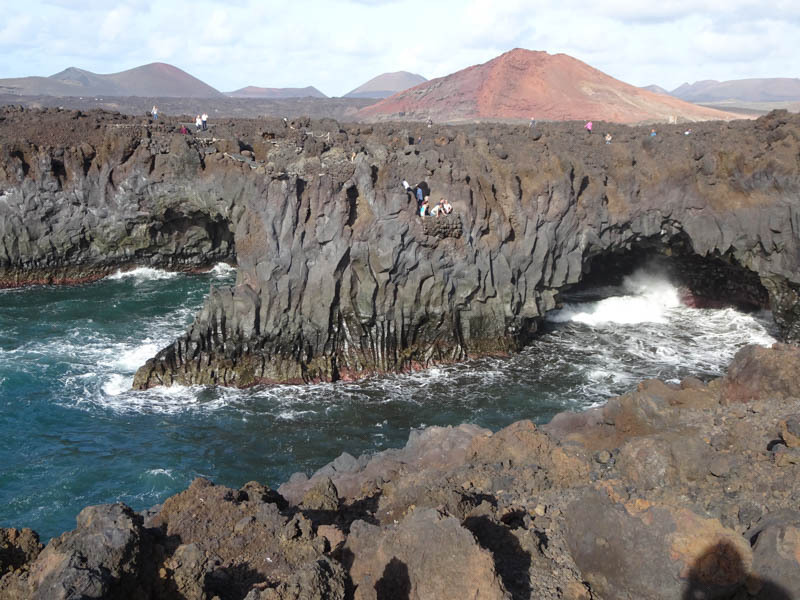 The hole is surrounded by a semi-circle of volcanic rocks to keep it from drying out. 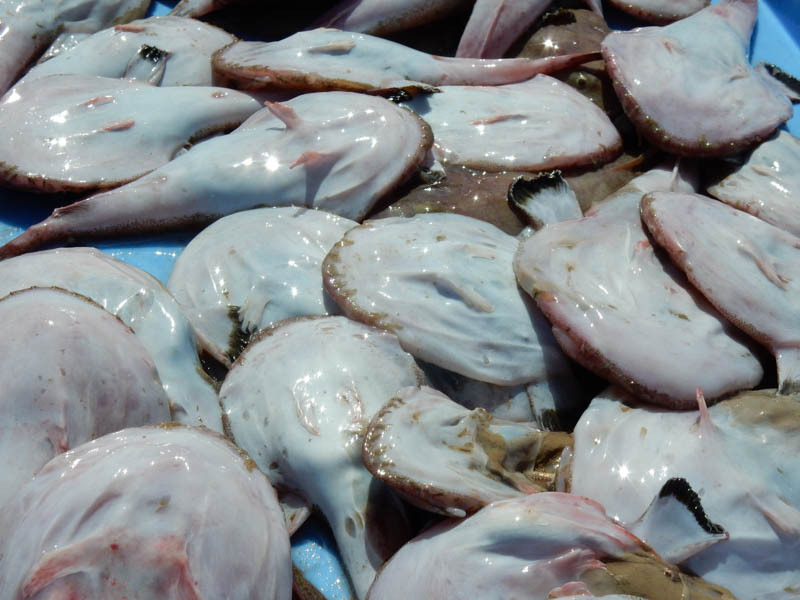 At night, the picón absorbs the moist ocean air that blows off of the Atlantic, slowly releasing moisture and keeping the roots of plants cool. 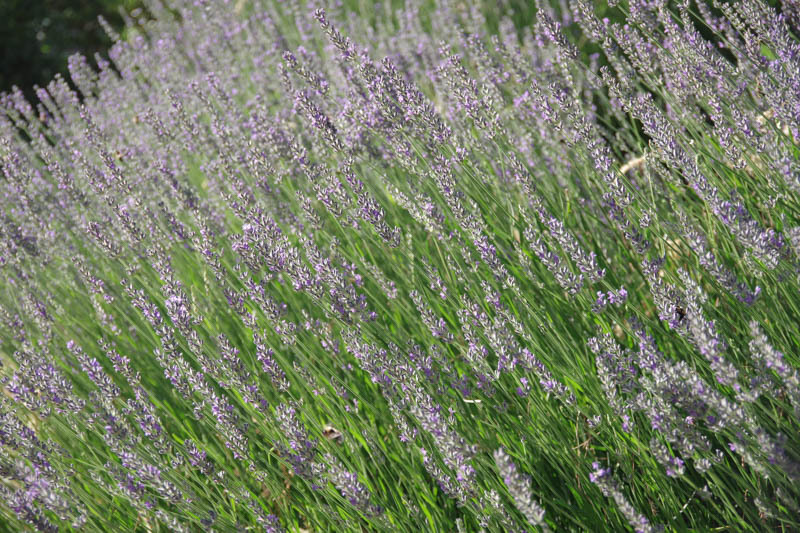 We can attest to the moisture in the air because every morning Sabbatical III is wet with dew. 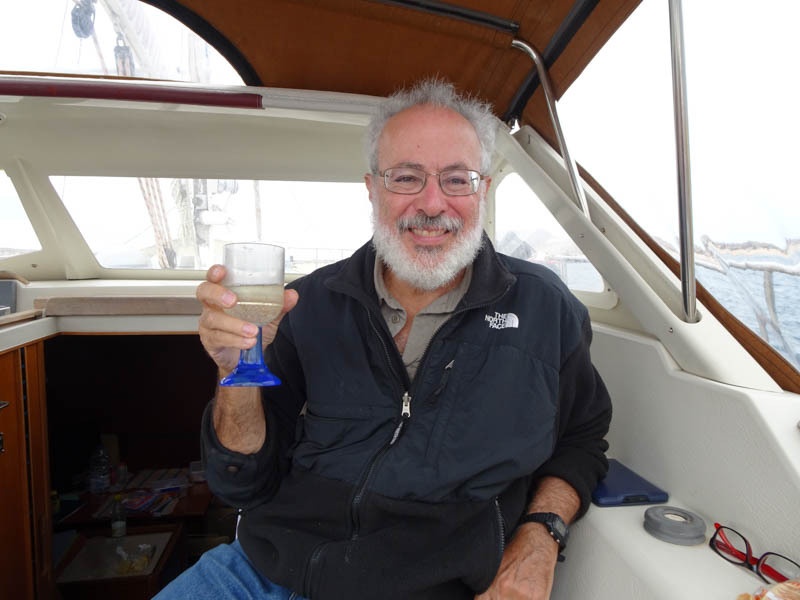 Toasting Mark’s sailing circumnavigation. Laura’s is not yet completed. 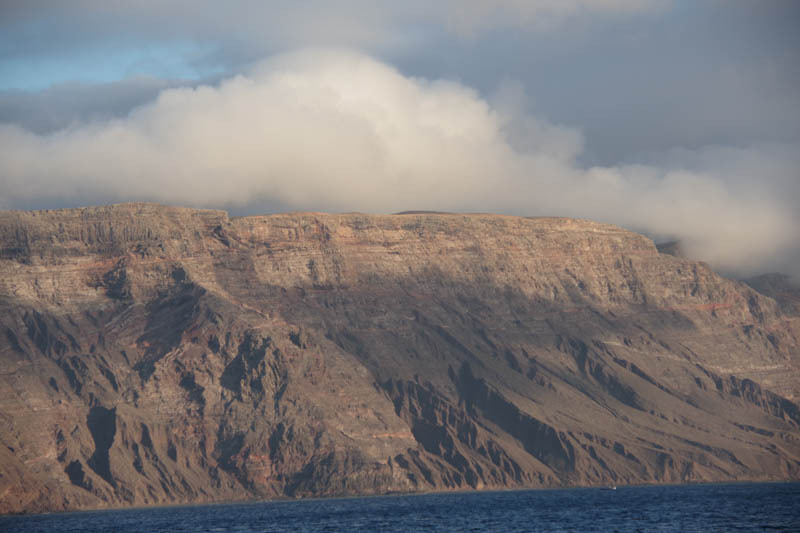 About 15 years ago, in November 2003, Mark left the Canaries heading west aboard Sabbatical III. 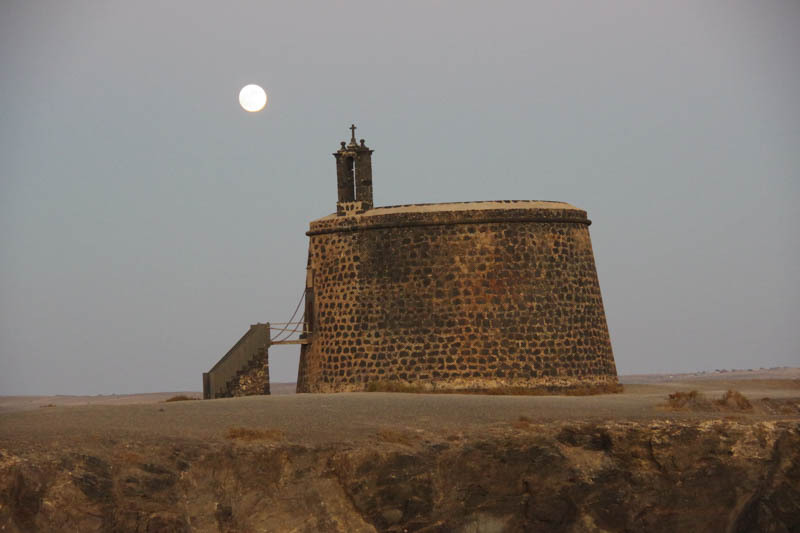 On August 16th, he arrived in the Canaries from the east, closing the circle of a sailing circumnavigation. Very cool. 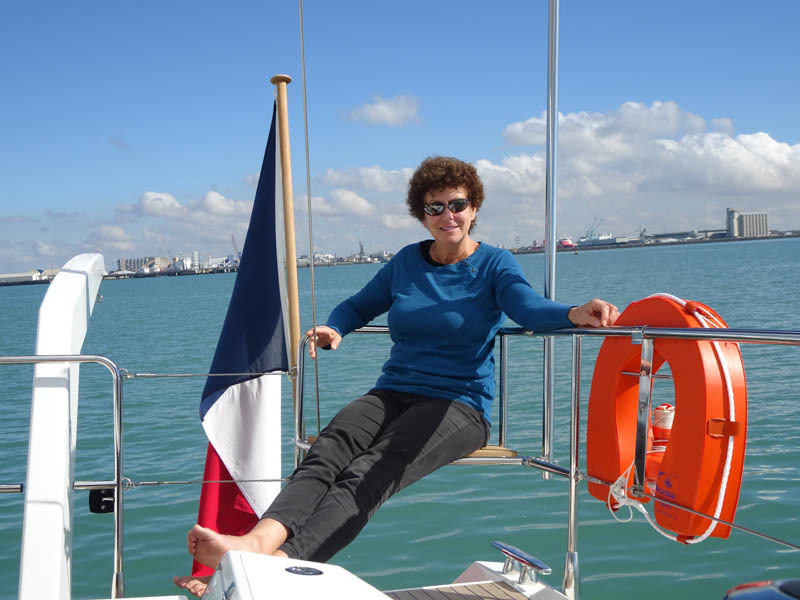 My (Laura) completion of a sailing circumnavigation will have to wait until late December, when we arrive in Martinique after crossing the Atlantic from the Canary Islands. 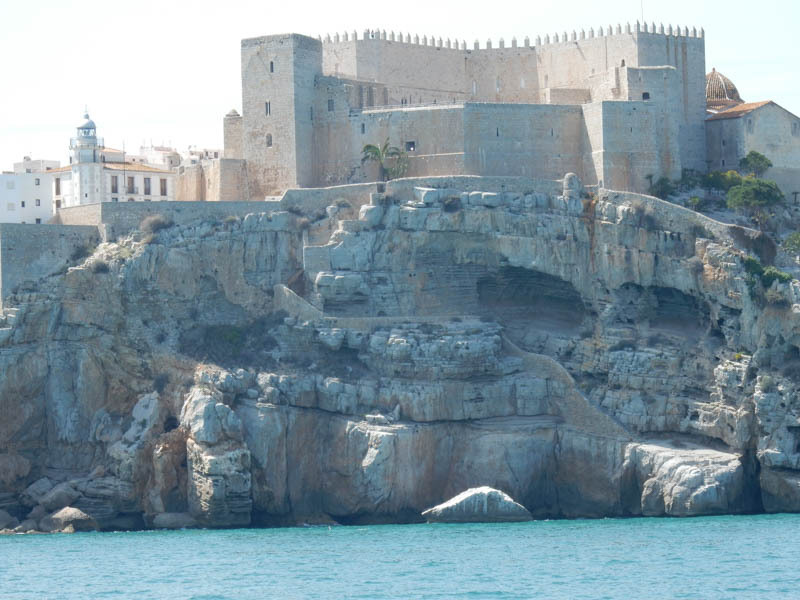 We left Marina Alcaidesa on the Mediterranean side of the Gibraltar at first light of August 12. This was the best time to leave in order to have the least adverse current through the Straits. The trip west through the Straits is literally uphill. 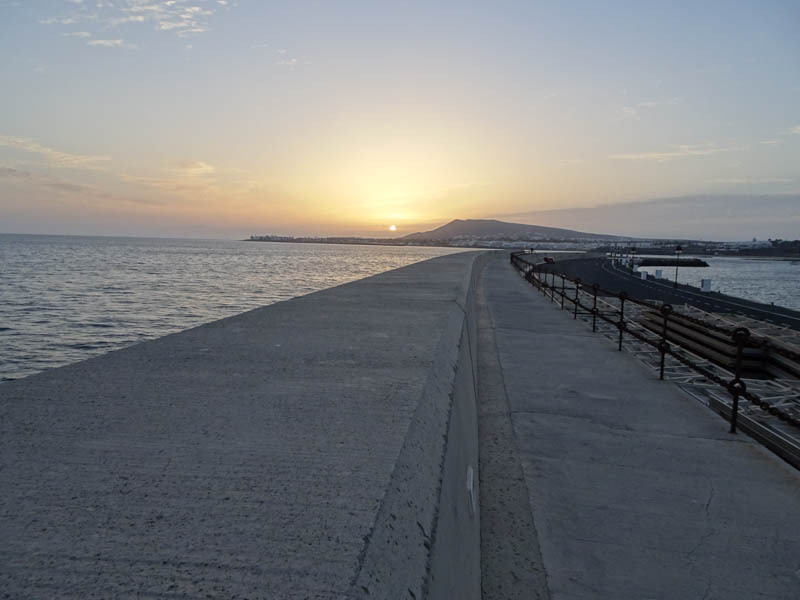 The Atlantic side of the Straits of Gibraltar is as much as 10 feet higher than the Mediterranean side. Consequently, the current almost always runs from west to east. We left when there was an especially high tidal variation due to the phase of the moon. That means the high tide in the Atlantic is higher than on most days, but also that the low tide is lower than on most days. Mark used detailed current predictions generated by David Gal of Israel and available from openskiron.org to time our departure and course. They were very accurate. Our passage through the Straits also benefited from strong easterlies. 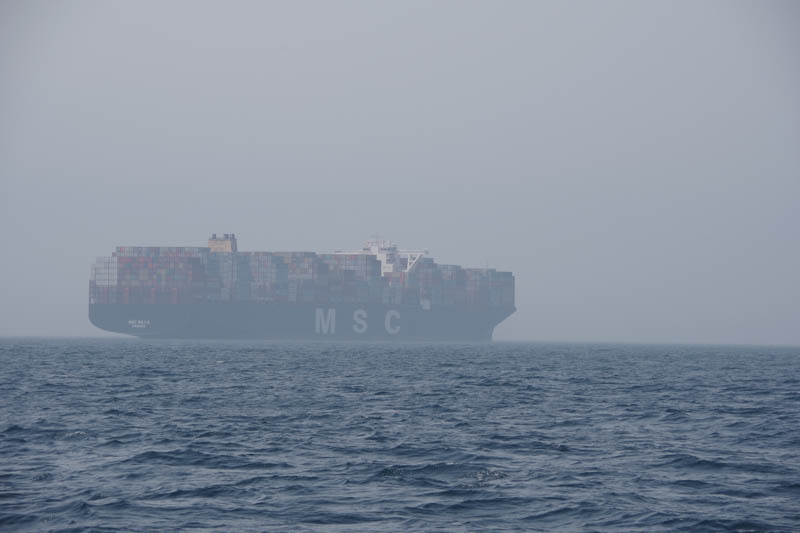 There was a lot of ship traffic as expected, but with AIS it was not a problem even with patchy fog. 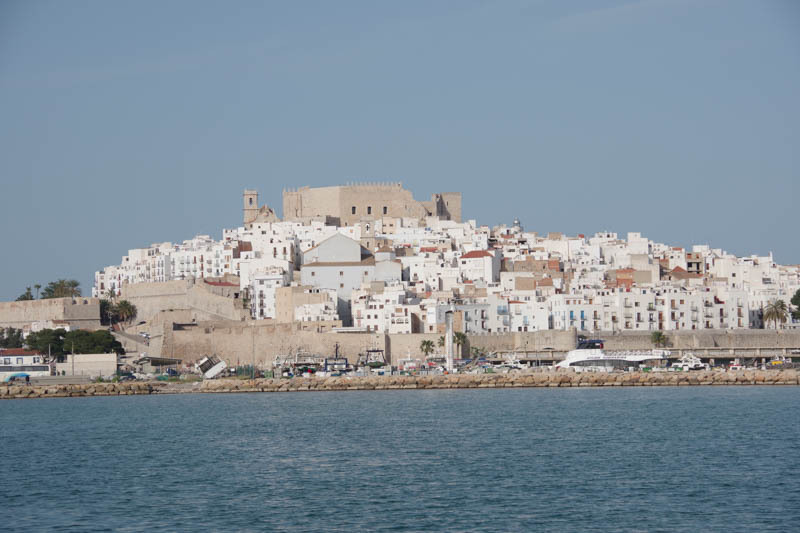 You certainly have to stay on guard throughout, especially when crossing to the Moroccan side of the Straits. By about noon we were officially in the Atlantic and were sailing smoothly with speeds up to 9 knots. 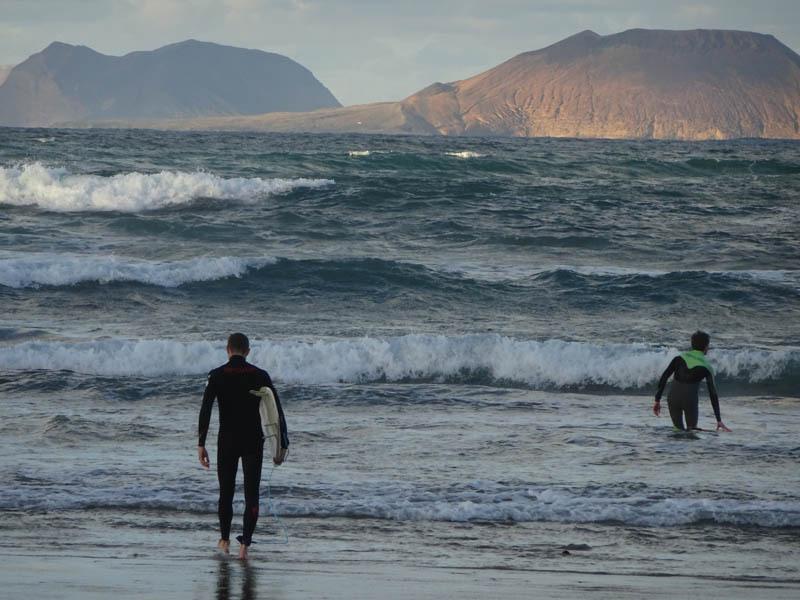 The next morning we encountered a serious westerly swell and confused seas that was quite uncomfortable. I got very sea-sick (and threw up for the first time I can remember on the boat). It was not a good day for me as my sea-sickness was pretty debilitating. The hours dragged on, and my only respite was when I could sleep (which was quite often). Mark took extra long watches that allowed me to rest. 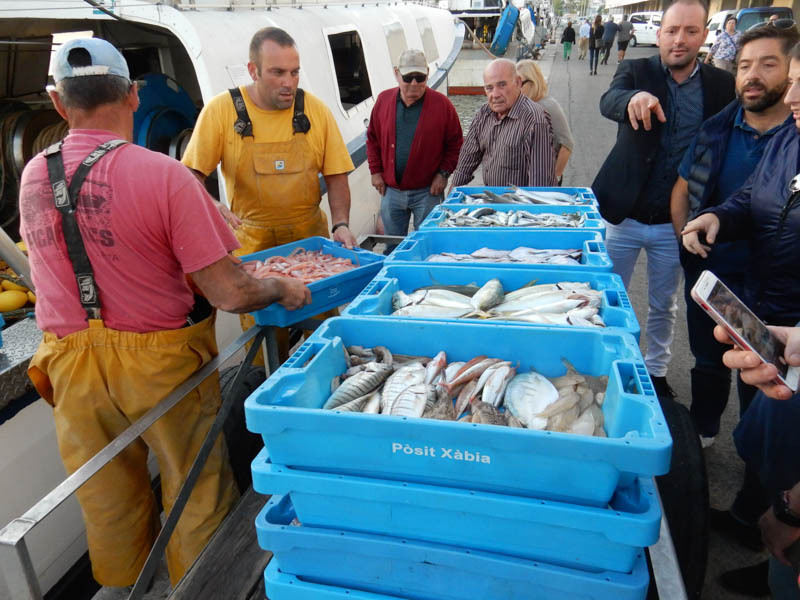 By the morning of the third day things were much better as northerly winds and seas came up. 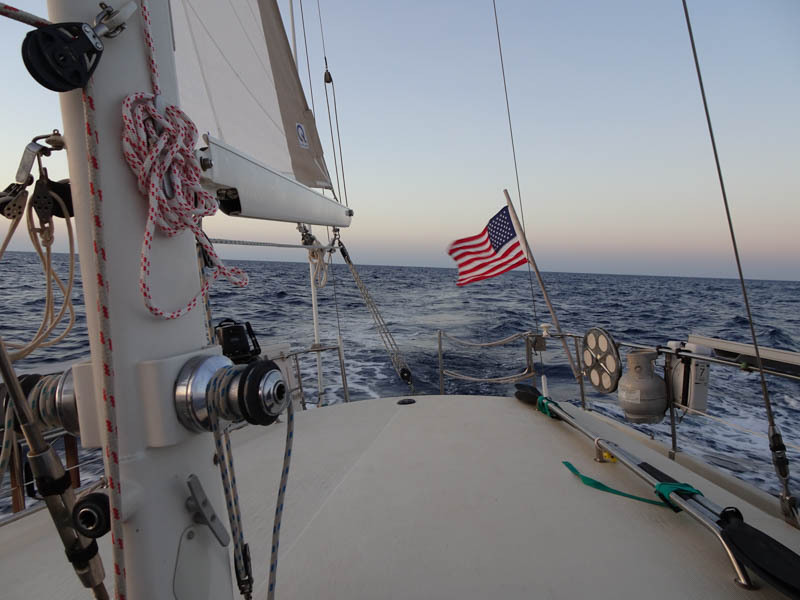 We put our big genoa on a pole and set the mizzen with a preventer and stayed with that sail configuration the rest of the passage. The wind increased to 25 knots but it was comfortable and we made such good speed that we had to slow down by triple reefing our sails on the fourth day so as not to arrive in the dark. Even with a triple reefed genoa and mizzen it was hard to go slower than about 5.5 to 6 knots. 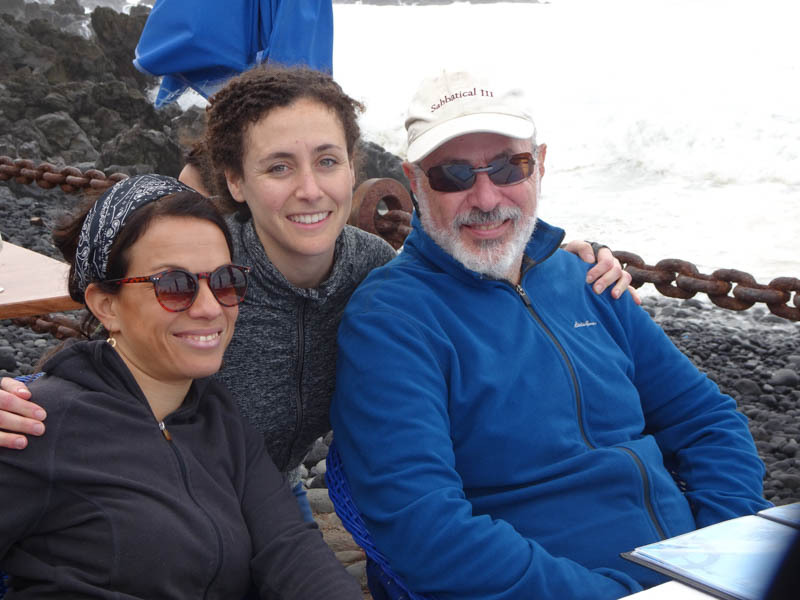 There was no moon so we were very glad that we had timed our arrival for first light so that we could navigate through the channel with good visibility before dropping anchor in Francesa Bay in Graciosa Island. 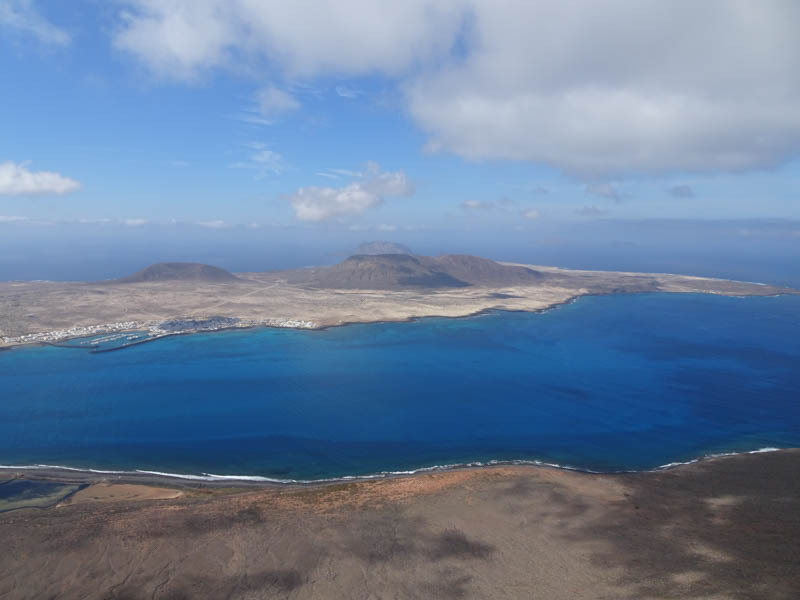 Graciosa Island lies at the northern end of Lanzarote Island and its waters are a marine preserve. 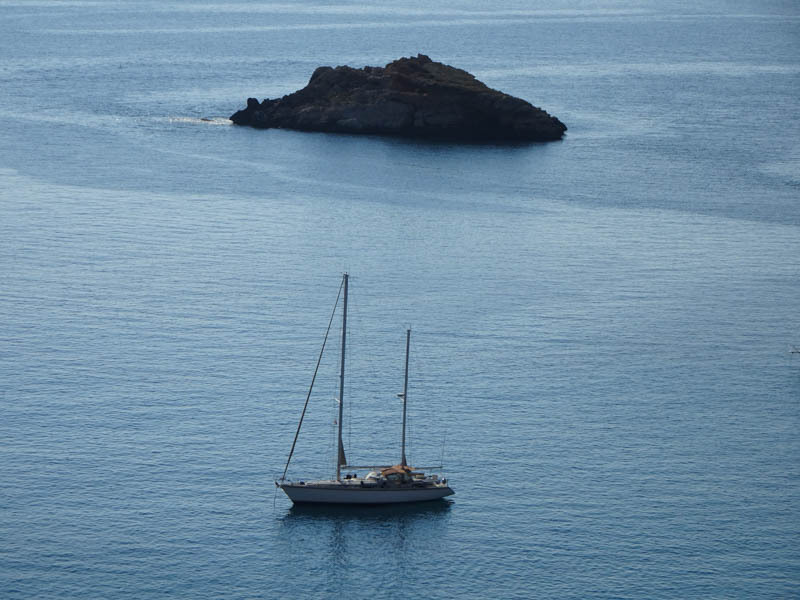 Only one or two other sailboats were at anchor for the three nights that we were there. 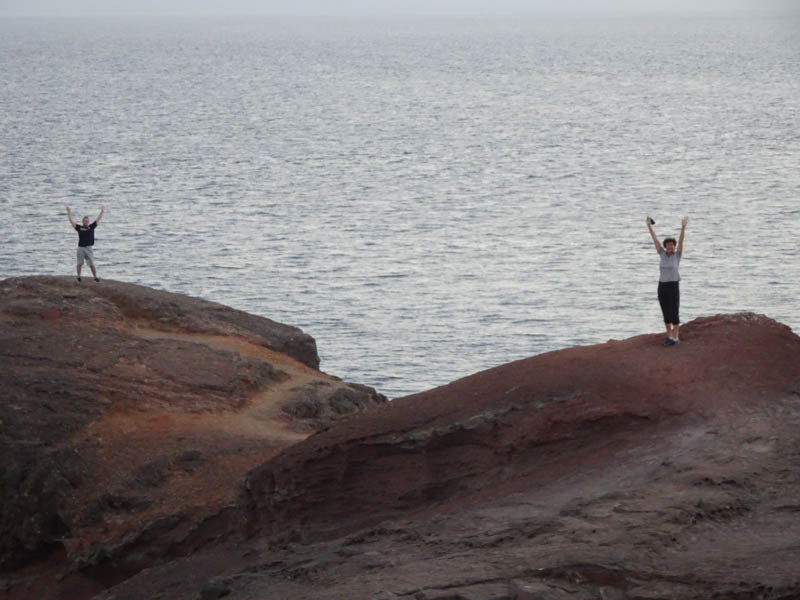 We were surprised by how barren these volcanic islands are, and how cool the temperatures are. 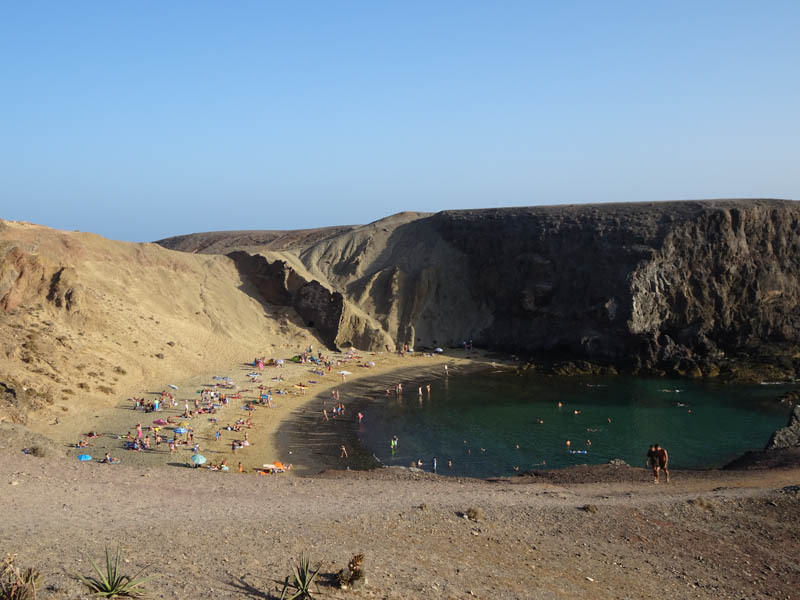 On the fourth day in the Canaries we proceeded to the southern end of Lanzarote Island and anchored for the night at Playa Papagayo. 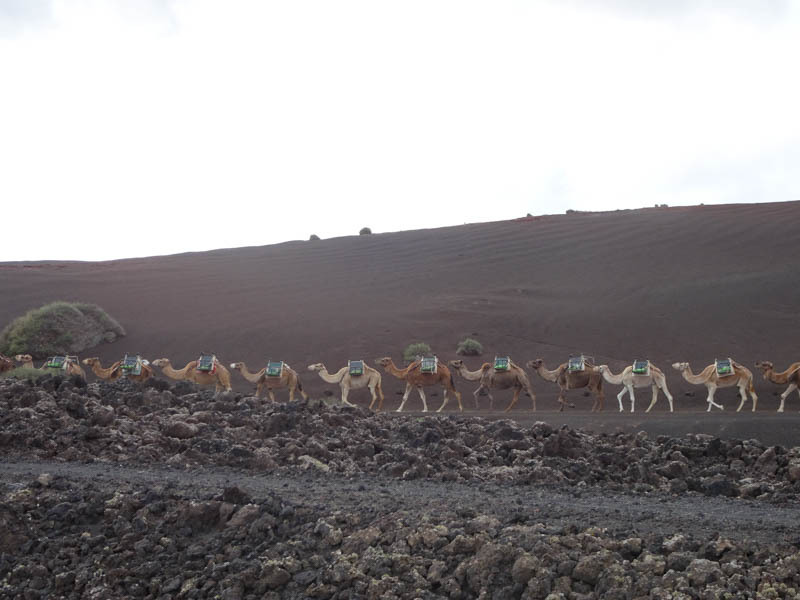 The wind shifted 180 degrees a few times in the evening and our anchor chain wrapped around some volcanic rocks. A British sailor in a nearby boat spent 45 minutes in the water with a snorkel mask giving us directions to unwind our chain from the rocks. The next morning (yesterday) we entered the nearby Marina Rubicon where we will be based for the next few months. This looks like a lovely place to spend time. I am particularly happy with the swimming pool. 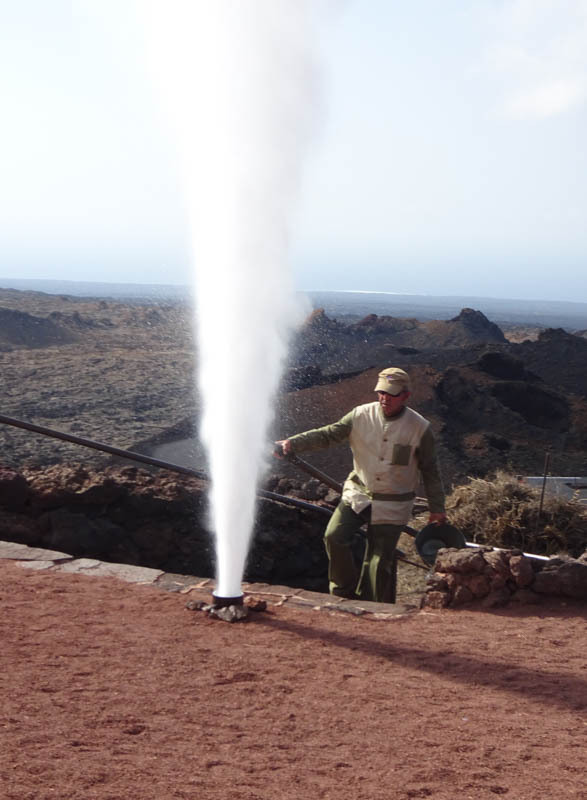 More on Lanzarote later. 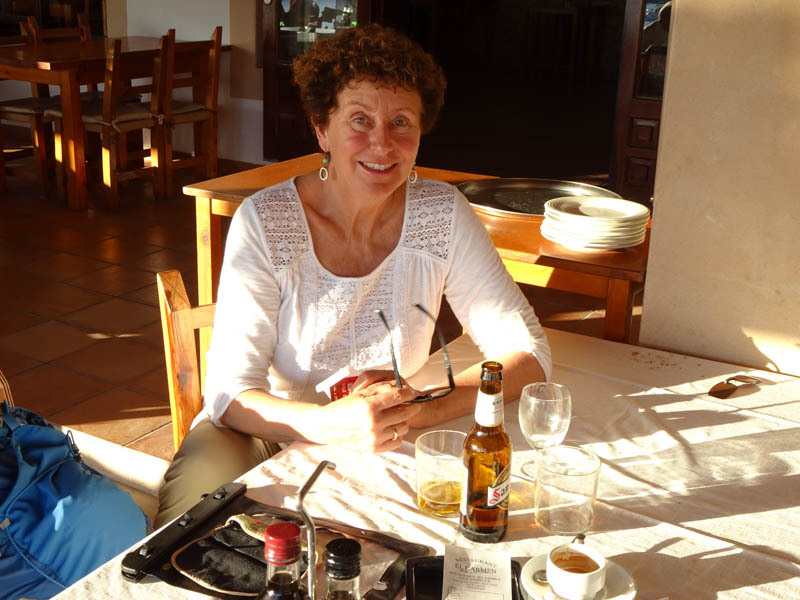 Just the day after we returned to Almerimar from the mountains, we saw that there was a very good forecast for strong south-easterlies for the next two days (following about 10 days of either westerlies or no wind). Since we only needed one day of wind for our 140 nm trip to Gibraltar, we thought this sounded great. 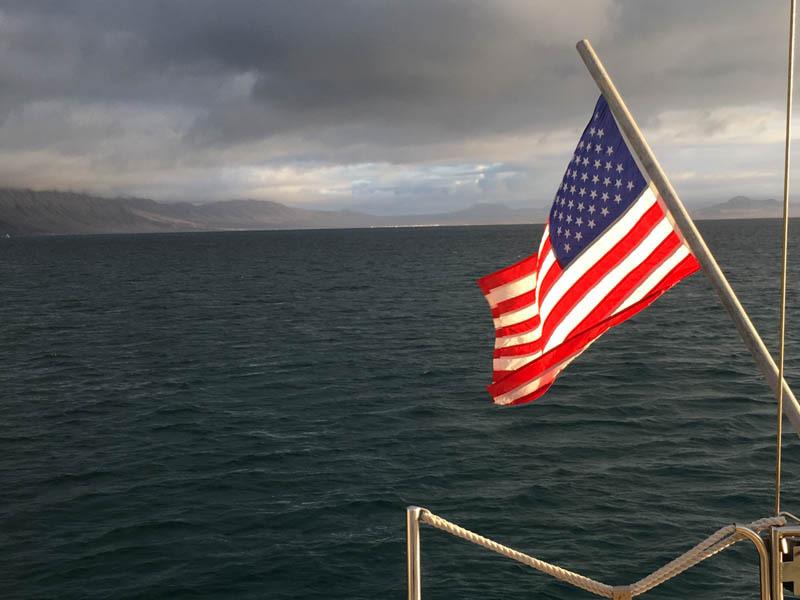 The forecast sounded like it might be a little too strong, actually, with winds of 25 knots, and gusts up to the mid-30’s and a meter and a half of seas. 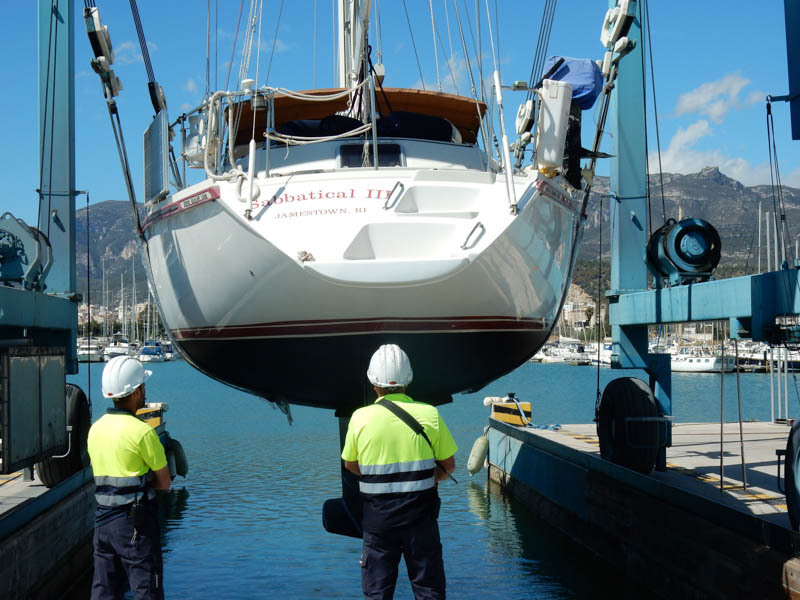 We decided that it was better to have a slightly raucous sail than to motor, so we quickly got things ready for departure. 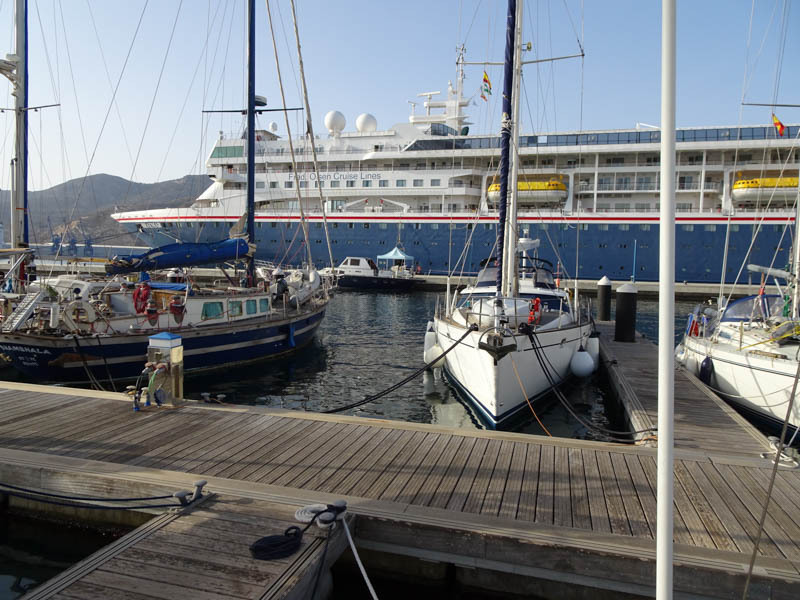 We pulled out of the marina at 13:00 on Wednesday, August 1st and for the first 45 minutes we had gorgeous wind and smooth seas. Then, in an instant, the seas got very confused and the wind stopped. After about an hour it started building again, and we thought we were going to be able to sail, but it never really came back with any force, and it certainly wasn’t from the S.E as predicted. It was mostly on the nose, but very light. So we ended up motoring the entire way. Mark had the sails up for a few hours in the middle of the night, and for a few hours in the morning, but without the motor we would not have moved much at all. 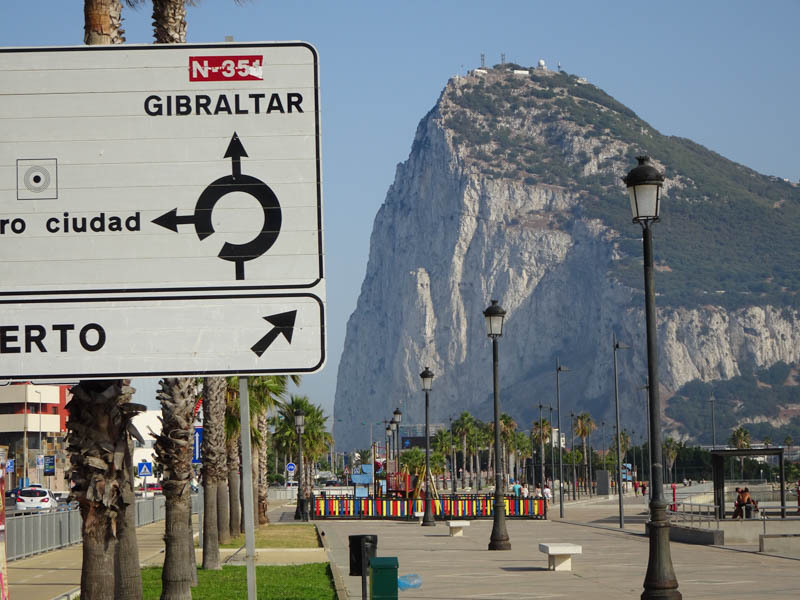 Only when we turned the corner at Gibraltar did the winds come up fiercely. 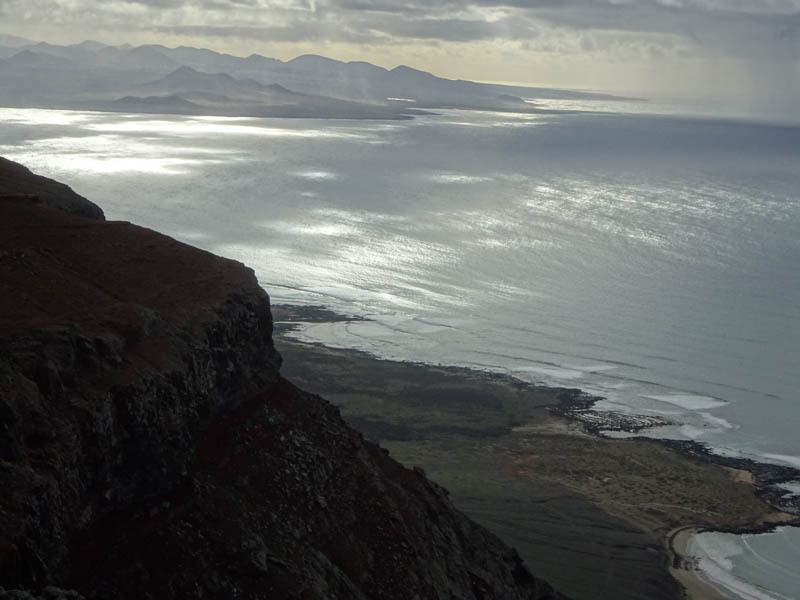 The winds came careening off the top of the mountain with a great deal of force and we finally found our easterlies…. But just 135 miles too late. 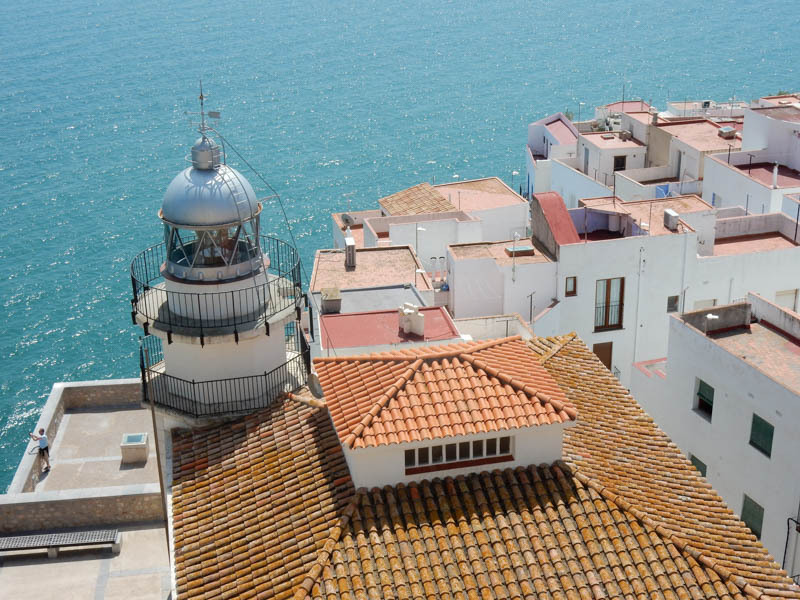 We are at Marina Alcaidesa, which is in Spain, directly adjacent to the Gibraltar border. 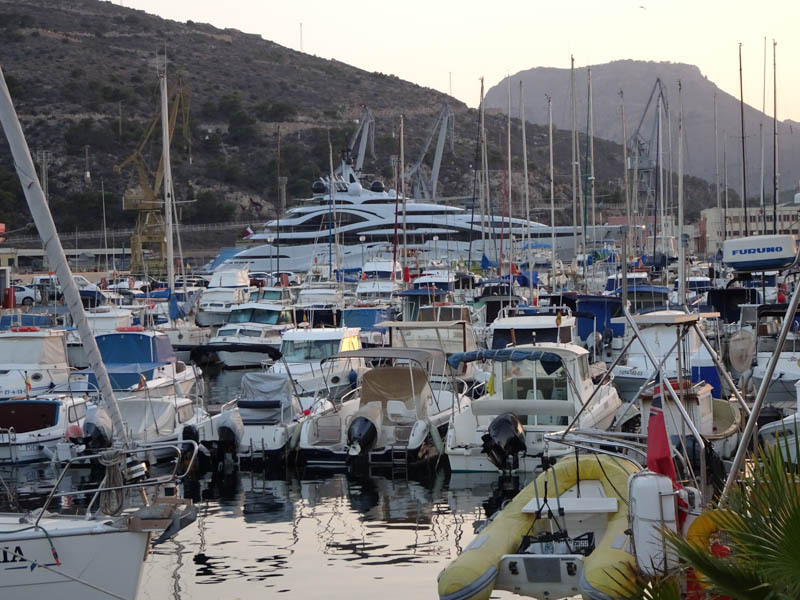 The marina is in a town called La Linea de la Conception. 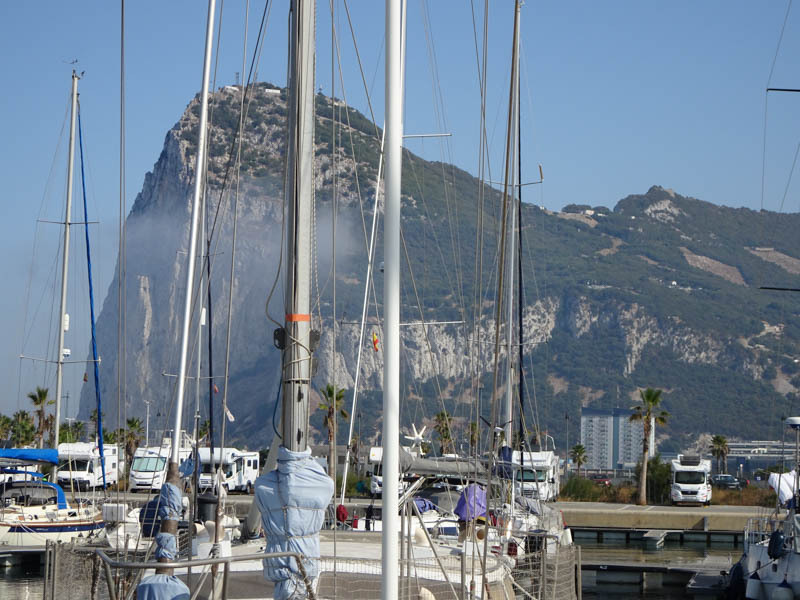 It is not very pretty, but the marina is clean and quiet and very nice and we have an absolutely terrific view of the Rock of Gibraltar which is very impressive. We both had bad colds this week and really didn’t venture out too much for several days, except to go look for food. For the first few days it was very foggy here, at least in the morning. This is apparently quite typical here when there are winds from the east, and it was a life-saver as it kept the temperatures very cool. Our thermometer was reading about 72 degrees Fahrenheit while the rest of Spain was experiencing temperatures in the 100’s. 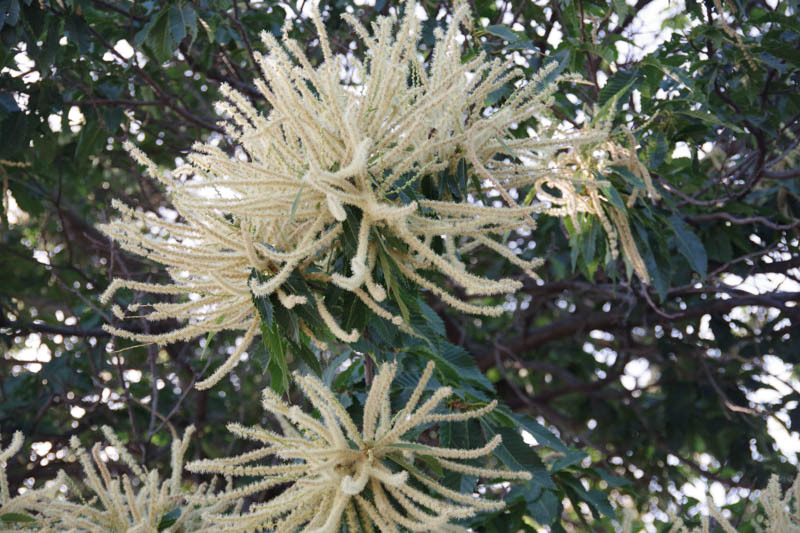 Once the sun came out in the afternoon, it heated up quite a bit, and by Wednesday afternoon we were sweltering along with the rest of the country. Miraculously a nice westerly wind picked up just when we thought we were going to melt and it cooled everything down a lot. We wonder how long this heat wave will last in Europe. 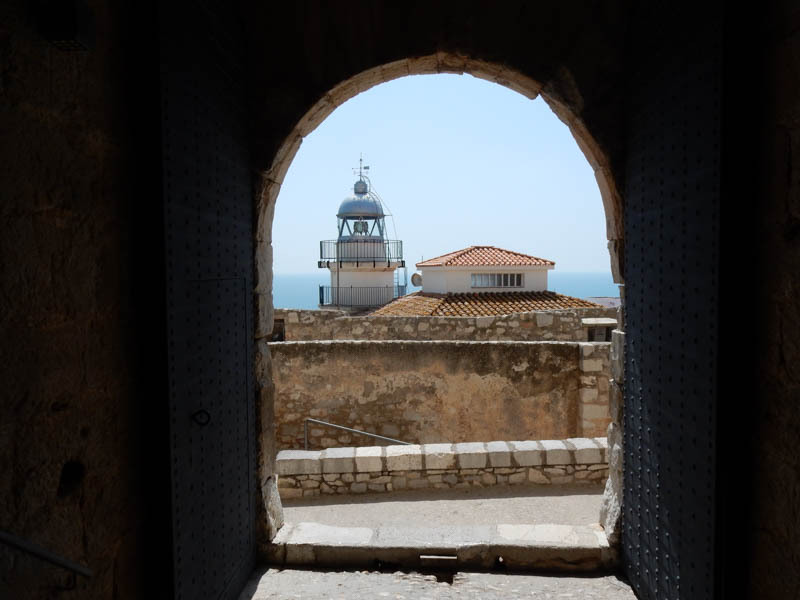 We visited the old town of Gibraltar, which involves going through customs at the border (they don’t stamp your passport, just look at it) , walking across the runway of the Gibraltar international airport and then walking another half mile or so to the quainter parts of the town. We thought the coolest part of the whole thing was walking across the airport runway (along with dozens of other people). They apparently are going to build a tunnel in a few years for pedestrians, but in the meantime, everyone who goes between the two countries has to walk or drive across the runway (and there are probably thousands of cars and buses doing it every day). 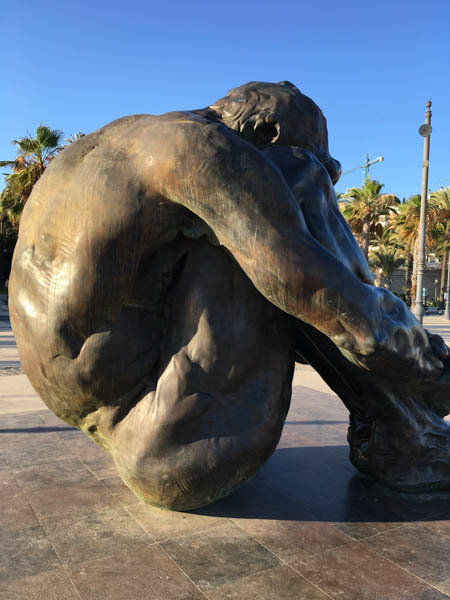 We keep in touch with many sailing friends through Facebook, and had learned a few weeks ago, that some very good friends on the sailboat “Nathape” were here in La Linea. 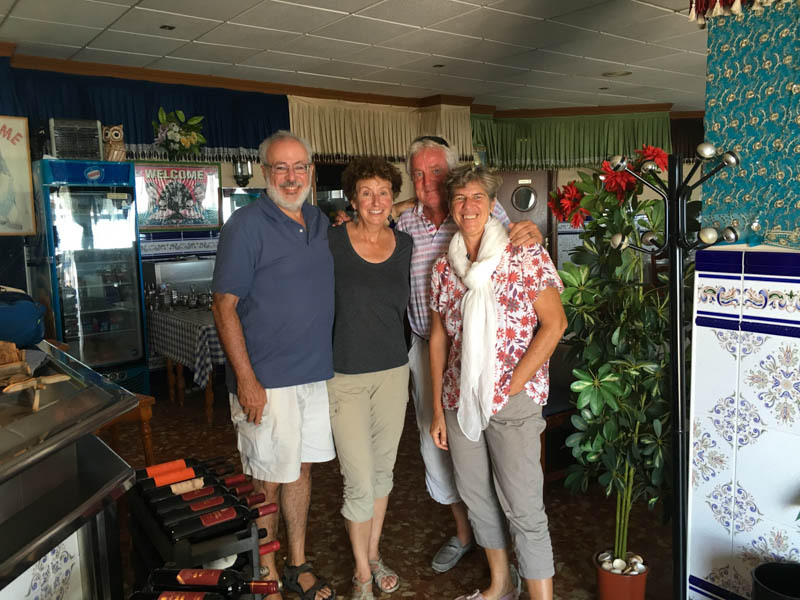 They sailed away from here before we could arrive, but their boat is only 30 km away, and Nathalie and Hans Peter drove down to meet us for lunch yesterday. We had a wonderful time (eating Indian food) and hearing about their adventures since we last met in Thailand. 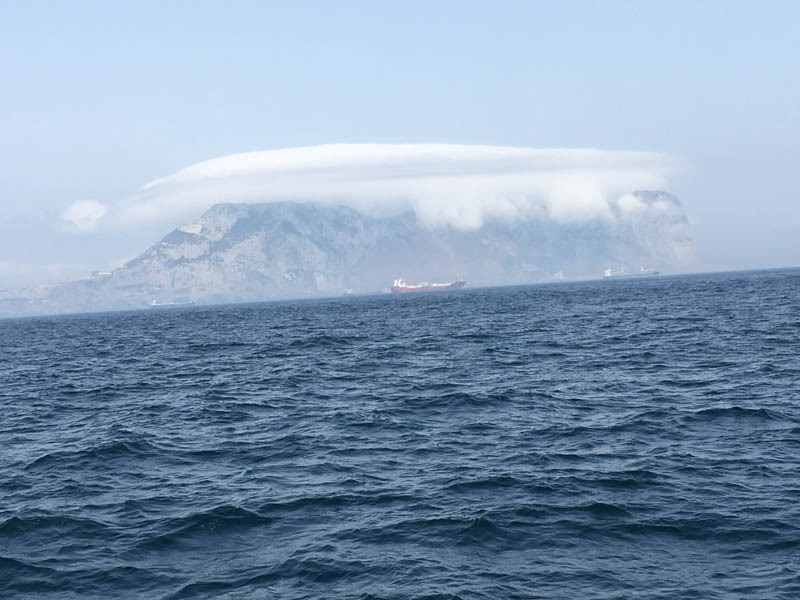 Now we are waiting for weather for the big move: crossing the straits of Gibraltar with all its currents and traffic, and then heading south to the Canaries. 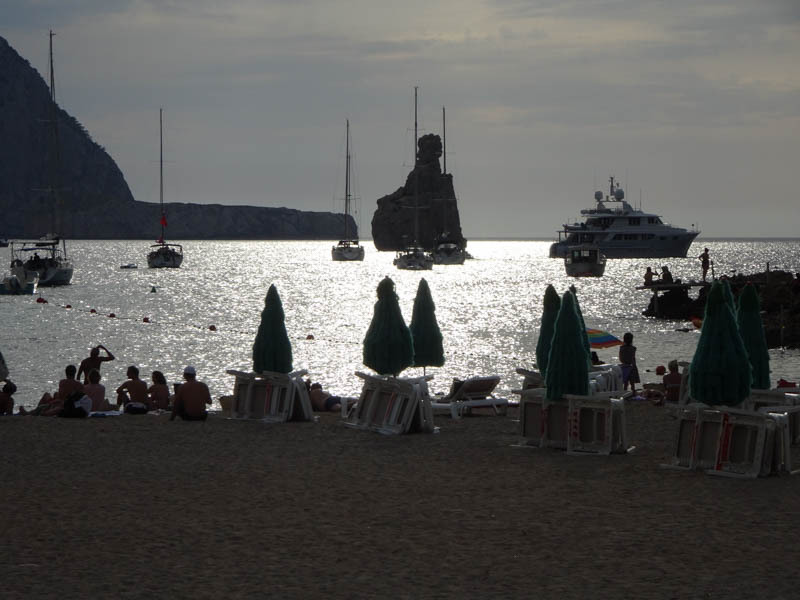 We left Cartagena in the afternoon of July 22nd and sailed a dozen miles or so to a well protected anchorage (Plaja de la Azohia) where we stopped to have a swim and enjoy the beautiful clear water. At about 17:00 we left the anchorage and had a pleasant sail until 20:00 when the wind died and we then motored comfortably until mid-morning. 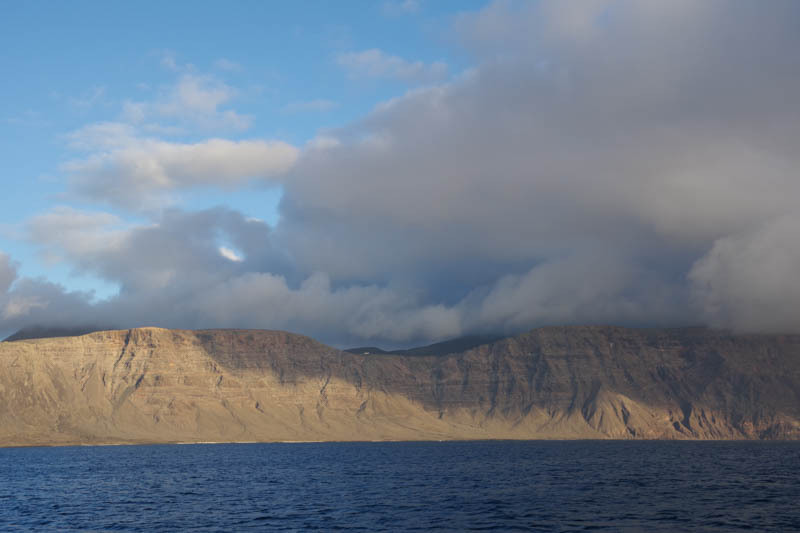 A nice breeze came up for us for our last few hours of the 19 hour passage and we arrived at Almerimar at about 12:00. 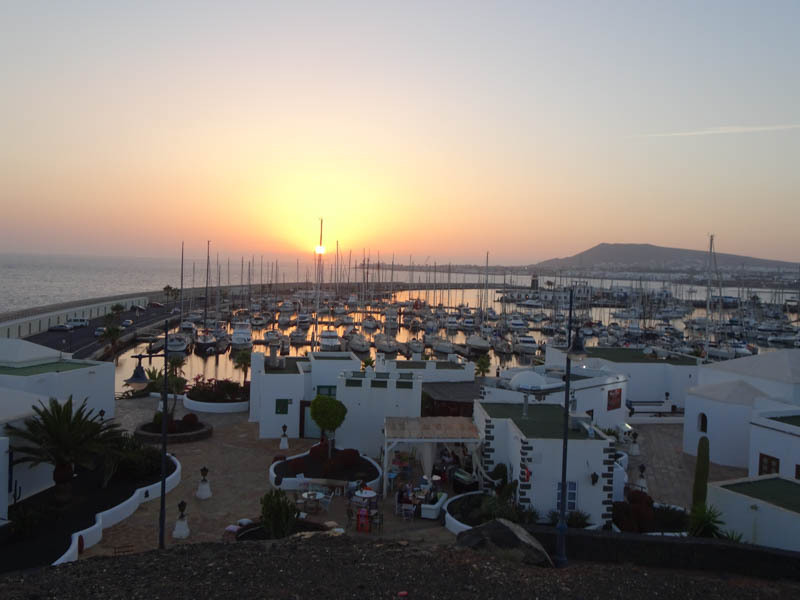 The marina at Almerimar is quite different than other marinas we have been to in Spain, as you must check in at the fuel dock. The office is also on that dock and they require all boats to check in as they enter. This was actually pretty convenient for us as we wanted to fill up with fuel anyways. 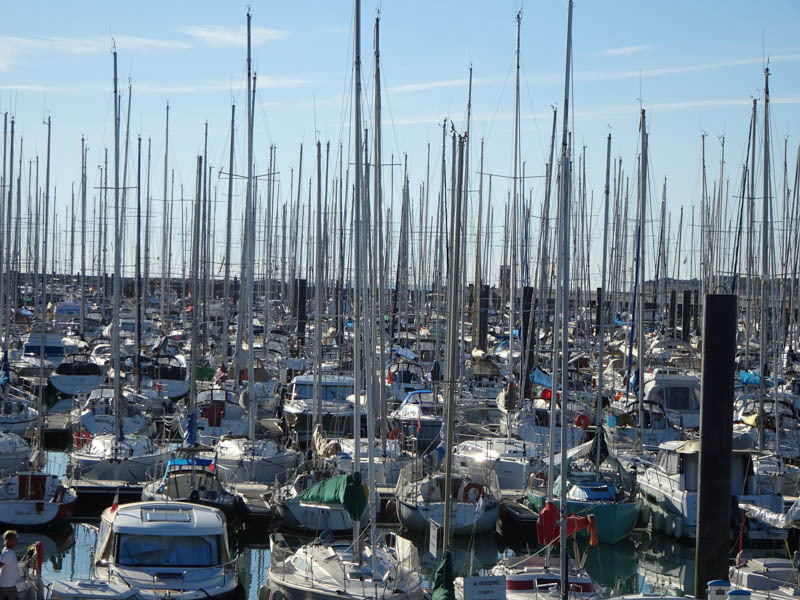 The marina appeared to be half empty and many of the boats there looked derelict. 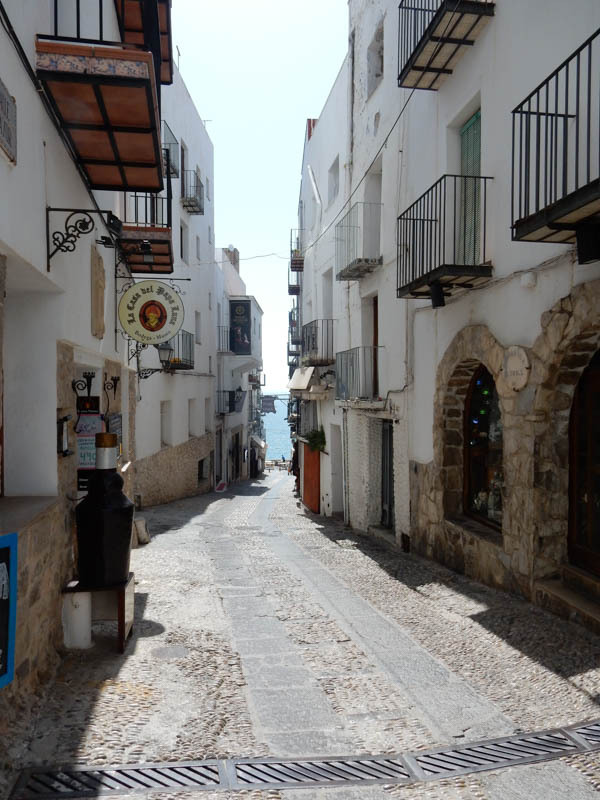 The town was built as a summer tourist destination and the docks of the marina wind in and out of a few man-made lagoons, surrounded by what appeared to be mostly deserted apartment buildings. 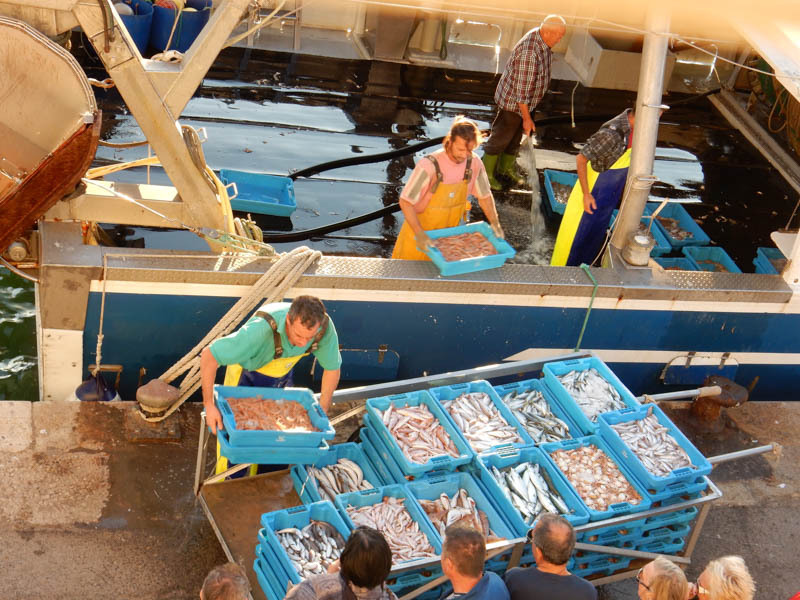 We had to Med moor for the first time this year and the lines they handed us were laden with marine growth and creatures. 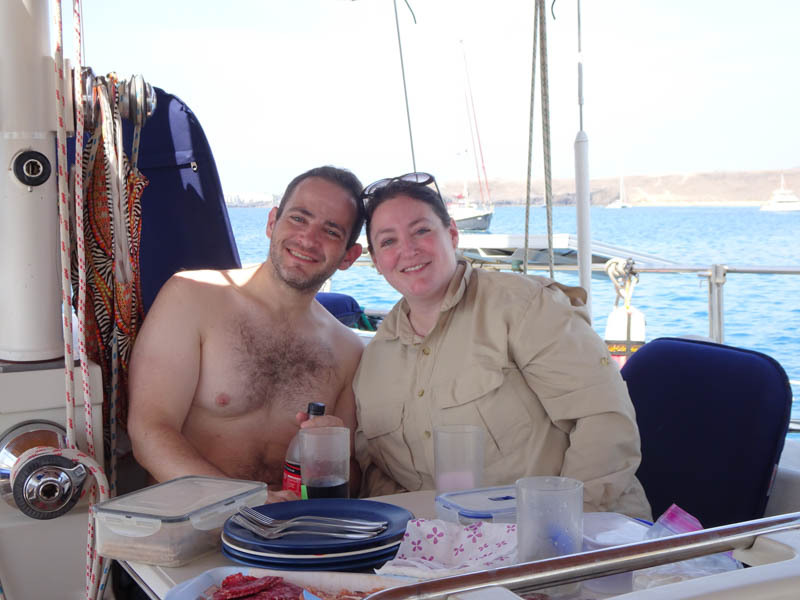 It was kind of hard to get the boat adjusted right and by the time we had finished securing ourselves forward and stern, it was quite hot and we were exhausted and dirty. 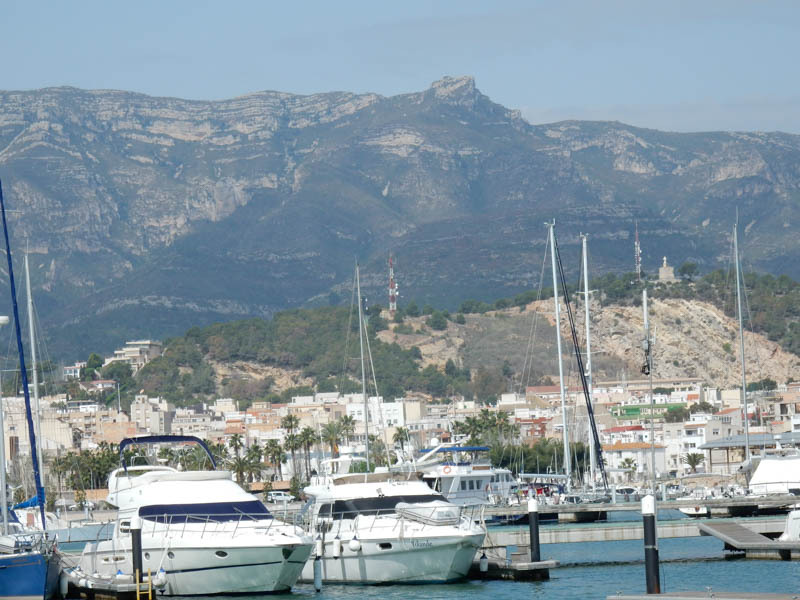 Almerimar was a pleasant town, however, filled with restaurants and tapas bars, all very close to the marina. 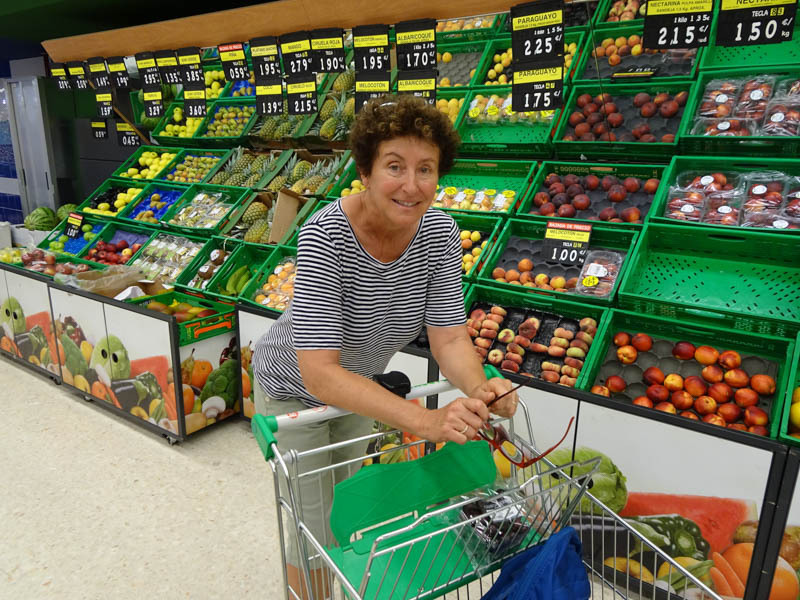 A big, well stocked Mercadona supermarket was just a few blocks away as well. 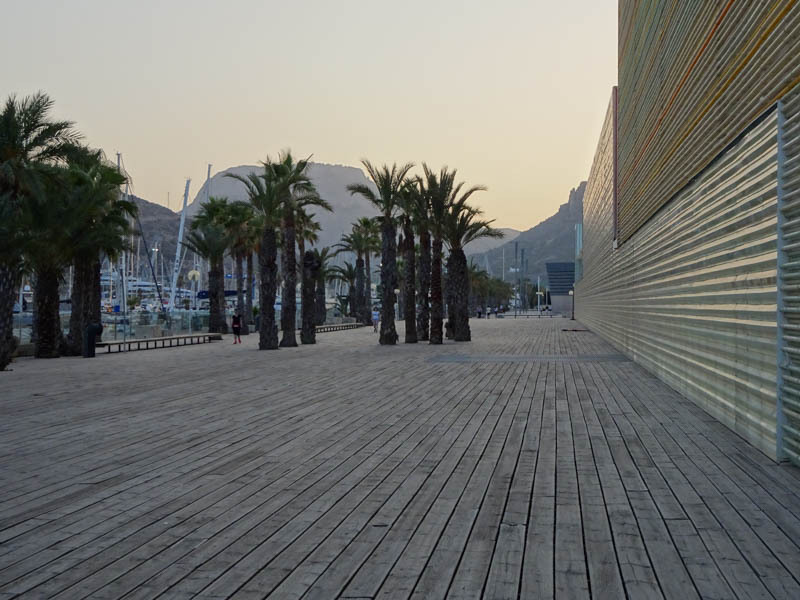 There were nice long beaches on either side of the marina, with clean, pleasant boardwalks to stroll on. 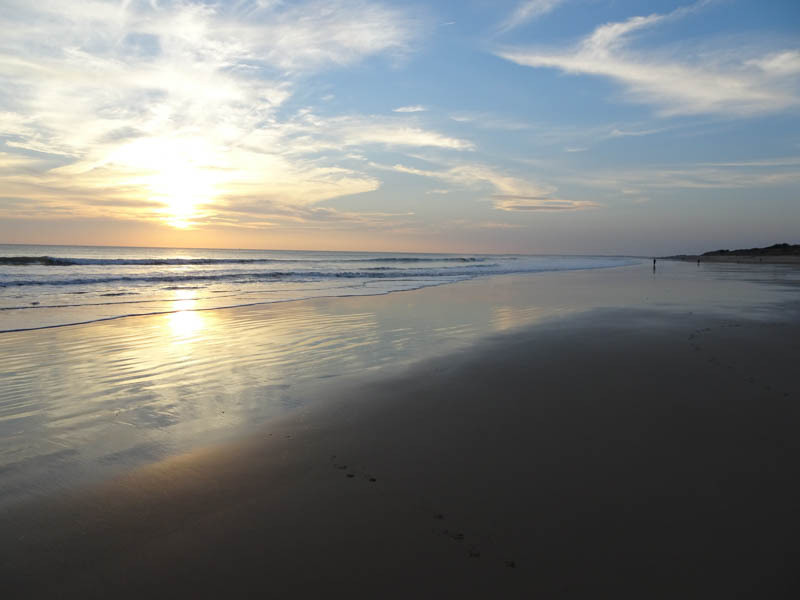 The beaches were absolutely packed. It was not a bad place, except that there was a terrible problem with noise at night. Some bars on the beach started playing electronic music at 11:00 p.m. every night and the synthesizer base sound pounded through the night, getting louder and louder, until their grand finale somewhere around sunrise. Every night. The weather forecasts suggested that we could not continue sailing south for some days. 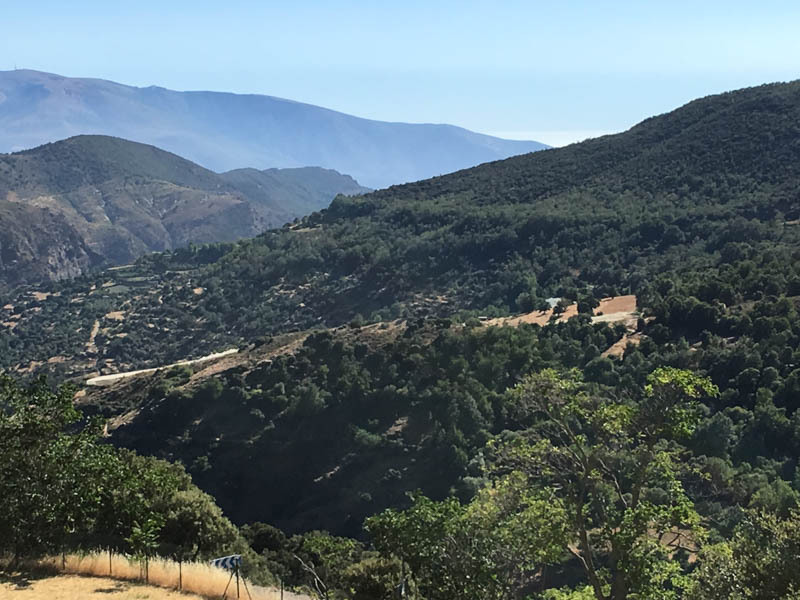 So after three nights we got smart, rented a car, and drove up to the nearby Sierra Nevada National Park – to the mountainous area known as Las Alpujarras, in the province of Granada. We found an amazing place to stay and ended up staying for five nights. 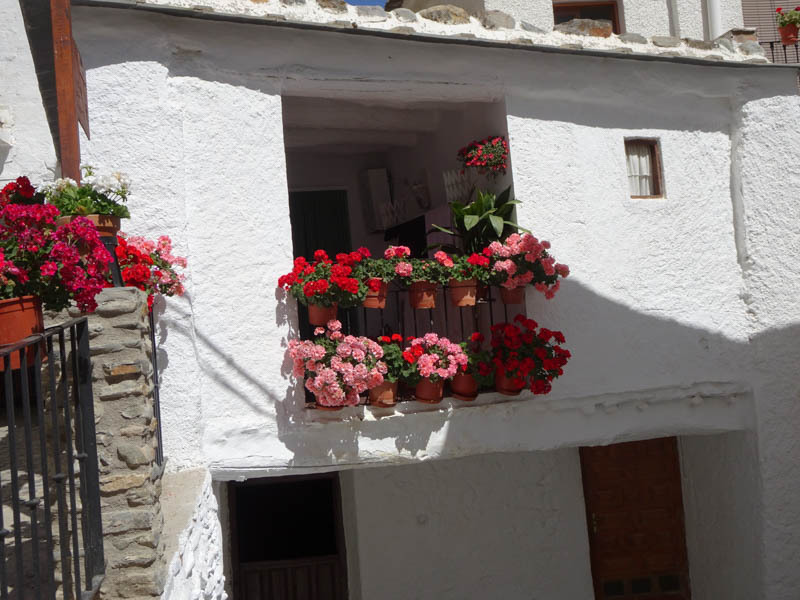 Our bed and breakfast lodging (called El Castañar Nazari) was in a lovely stone building, with five guest rooms, up on a hill with terraces overlooking the beautiful mountain range. Most nights we were the only guests because, in Spain, summer is not the season for going to the mountains. 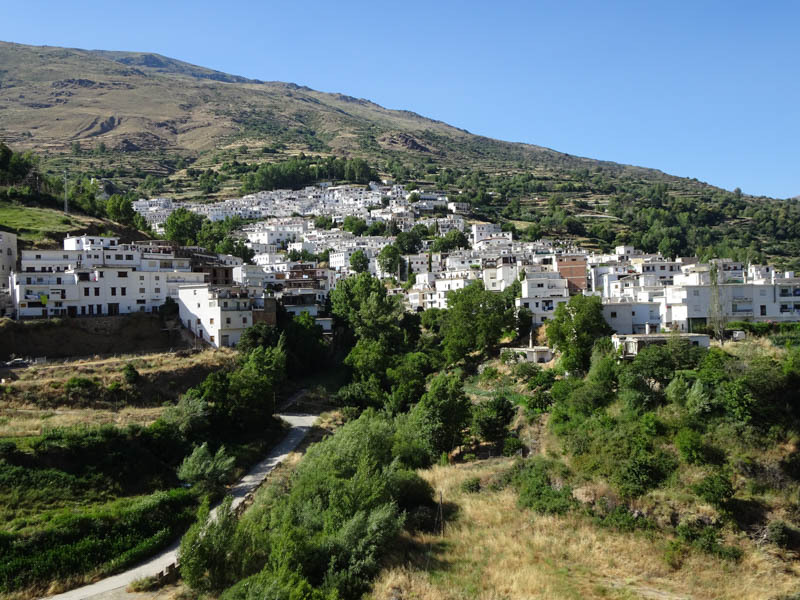 The nearest village was Trevélez.. Trevélez is an Andulusian “White Village”, famous for its air-cured hams, a speciality throughout the Alpujarras but particularly associated with this village, because the dry climate, a consequence of its altitude, makes for ideal conditions for storing them. 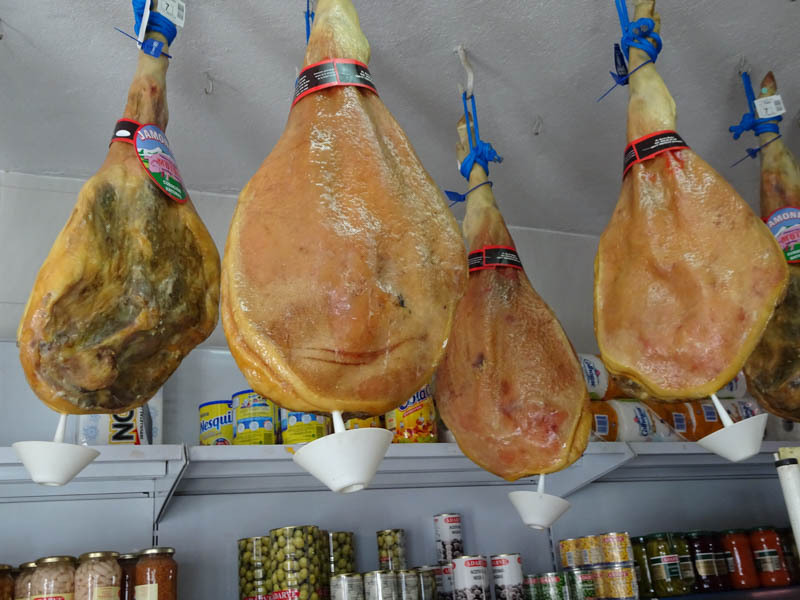 It was clear that ham was a big business in this area as there must have been two dozen shops in the tiny town, all advertising their hams. 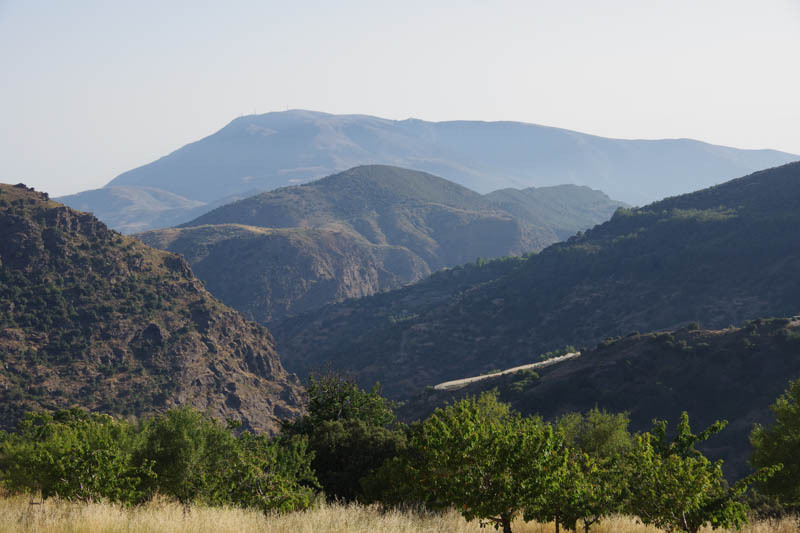 Two of the highest mountains in Spain are just to the north of the village, and there was still a little snow on the peaks even at the end of July. 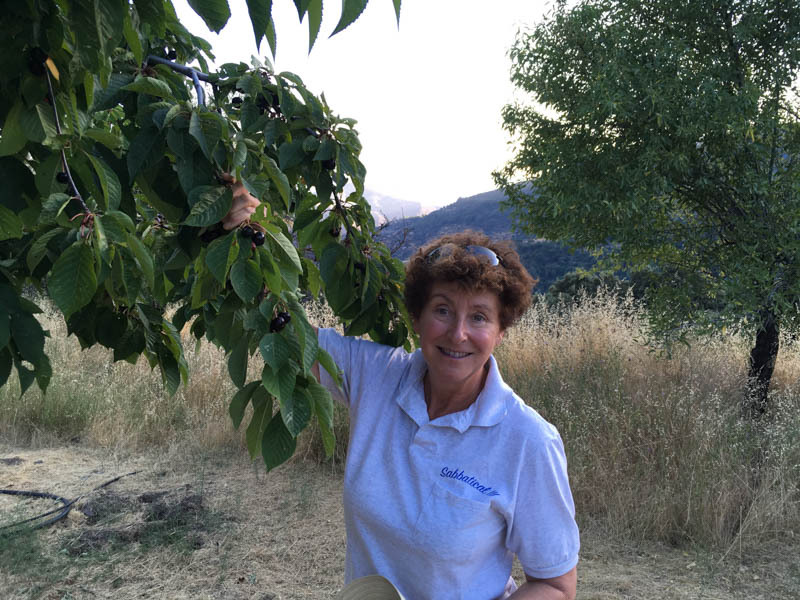 We loved our lodgings and the whole area… completely quiet with gorgeous views of the mountains, a pretty private garden where we spent most of our days reading under a big chestnut tree, and delicious breakfasts prepared by the proprietor, Felix. 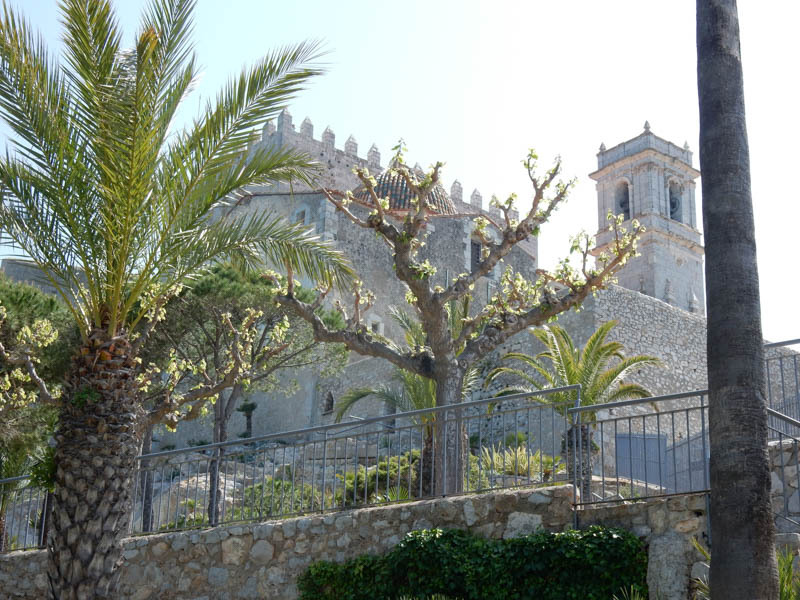 It cooled off beautifully at night, which was a relief, as the sun is so intense in Spain at this time of year that it can feel unbearable (and we were there when it was just “normal” heat, not the terrible heat wave that washed over the area the following week). 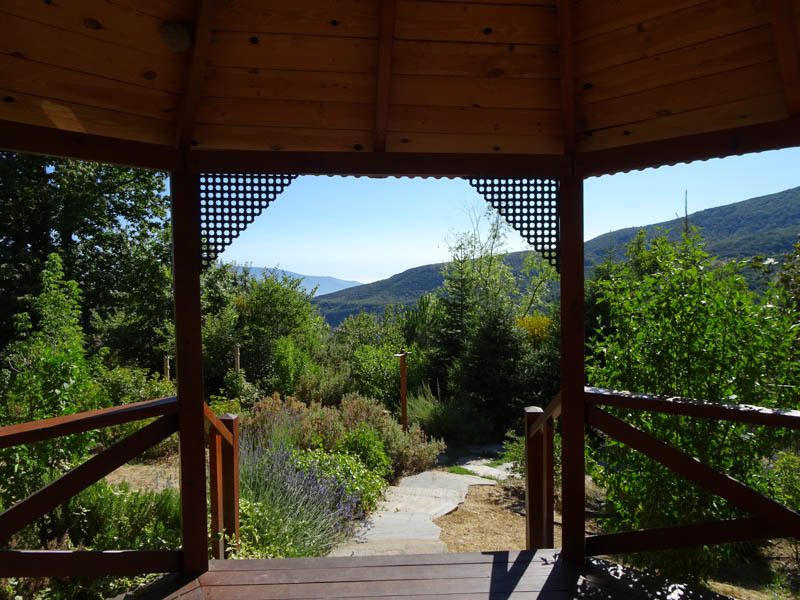 We also found a beautiful restaurant in Trevélez, called La Fragua. 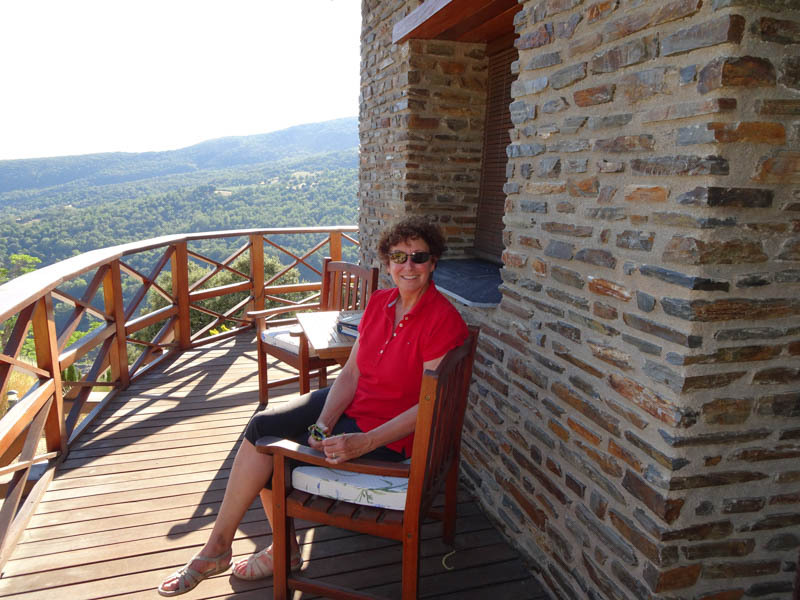 We ate a late lunch there every day and then just skipped dinner and watched the sun set over the mountains at night. 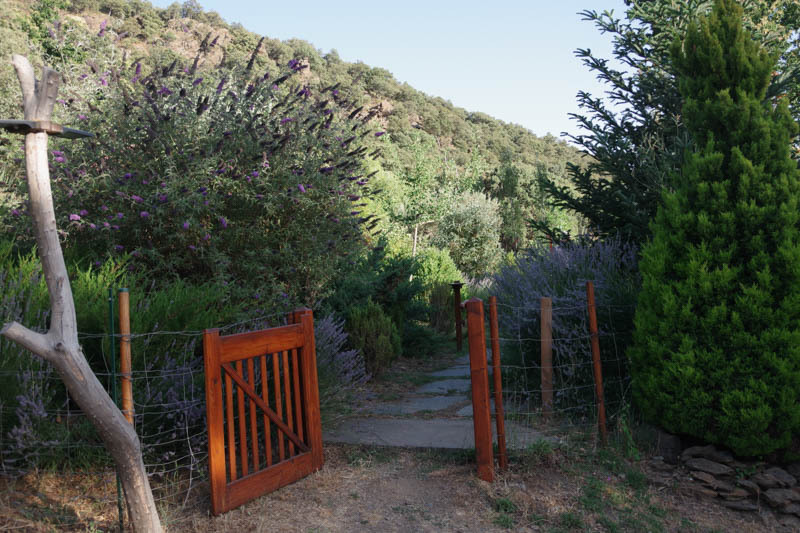 There was even a beautiful easy hike from the back side of our lodging up a steep hill and then along a beautiful irrigation stream with water running through it from the snow runoff on the mountains. 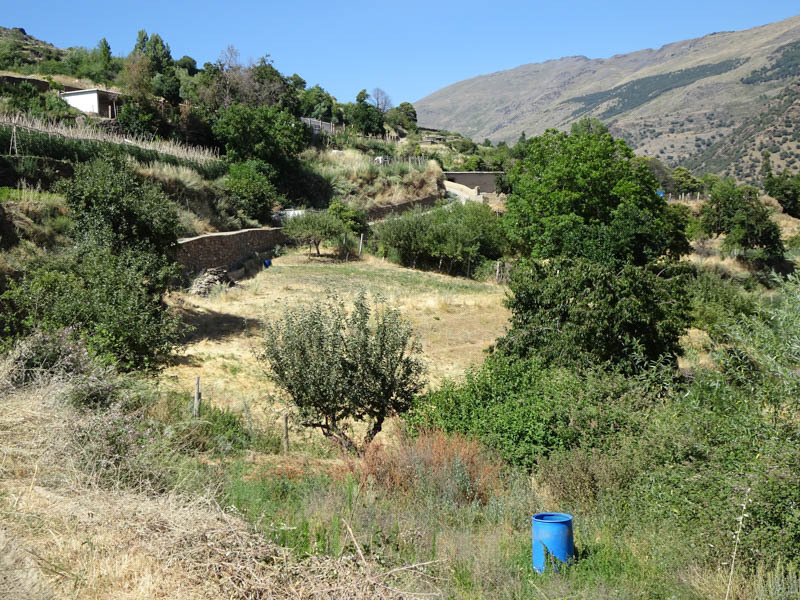 We also enjoyed driving through the windy mountain roads to visit the other white villages of the area: Pampaniera, Bubion and Capileira. 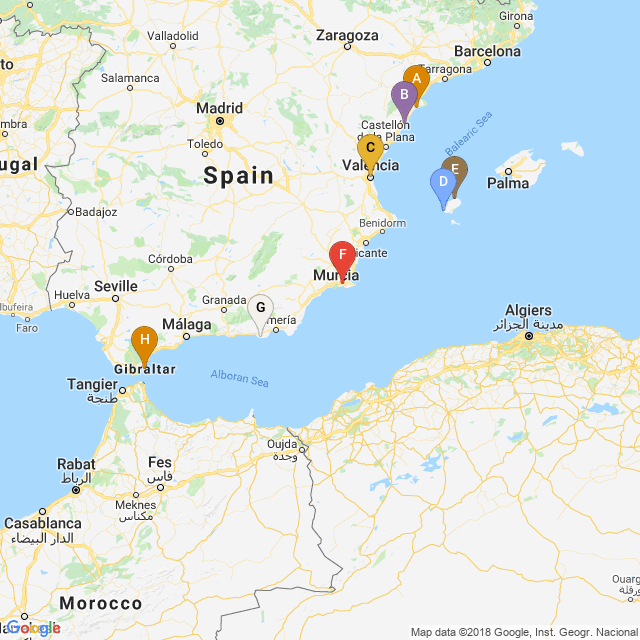 After five days up in the mountains we saw that the weather forecast was predicting excellent winds in just a couple of days which would allow us to continue our sail west, so we headed back to Almerimar. 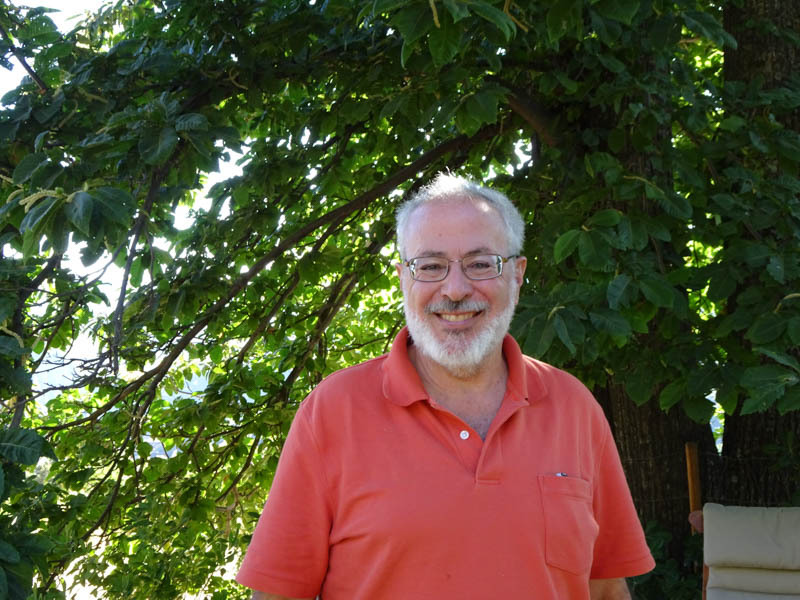 It been quite a while since we last posted a blog. 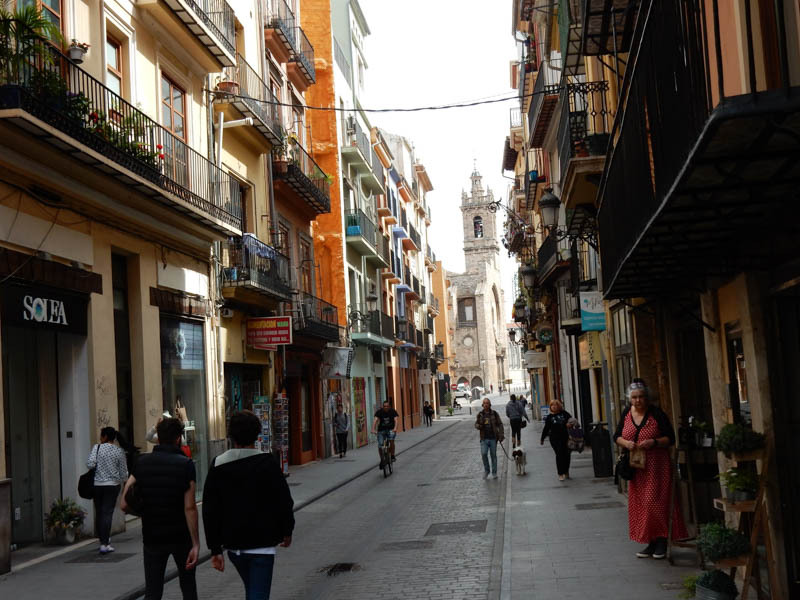 The last blog was posted from Valencia, where Sabbatical III spent roughly two months. 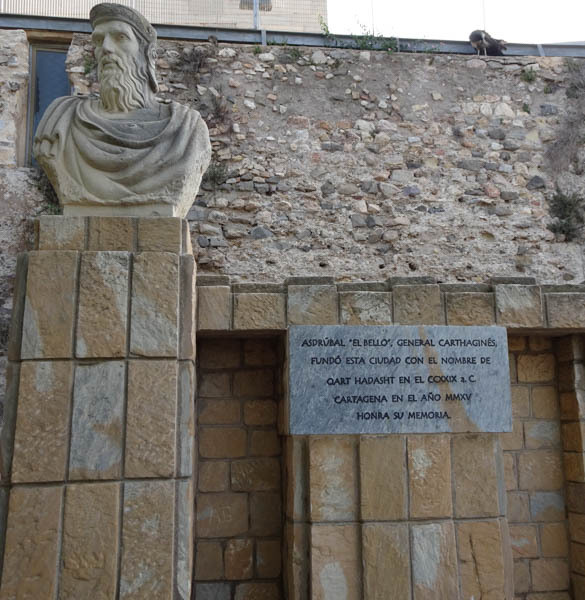 Now we are in the ancient city of Cartegena. In between we had two trips away from Valencia without the boat. 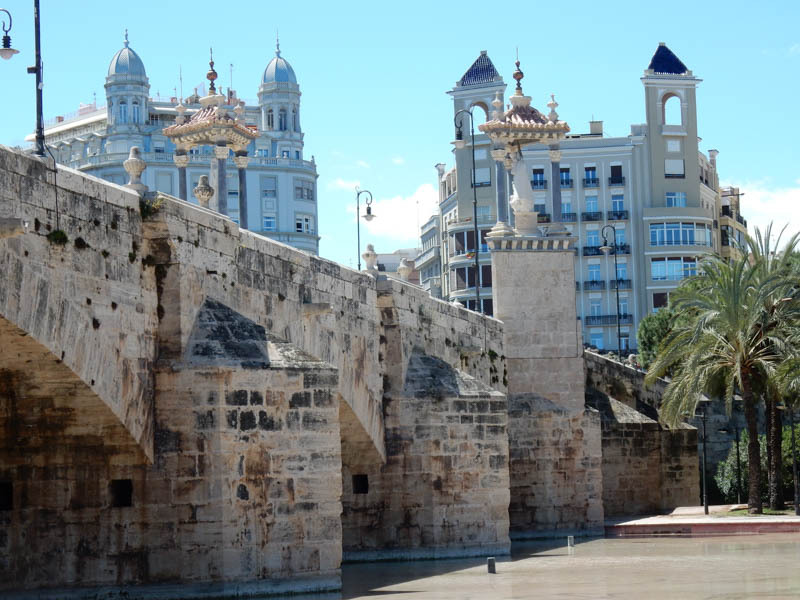 A ten day trip (April 3 to April 12) took us by train and bus to Cuenca, Madrid and Toledo, and then by plane from Madrid to Lisbon and back to Valencia. We took many wonderful photos of that trip. Unfortunately, our camera disappeared on the last day in Lisbon and all of our photos are lost. The second trip in early June (May 31 to June 12) took us to Saint Paul, Minnesota to visit Laura’s mother, Shirley, and then to Chicago for the PhD graduation of our son Benjamin. While in Chicago we spent time with the Pitt side of the family — our daughter Hannah, my sisters Fran and Naomi, brother-in-law John, nephew Daniel, and niece Nina and her two children Justin and Vera. 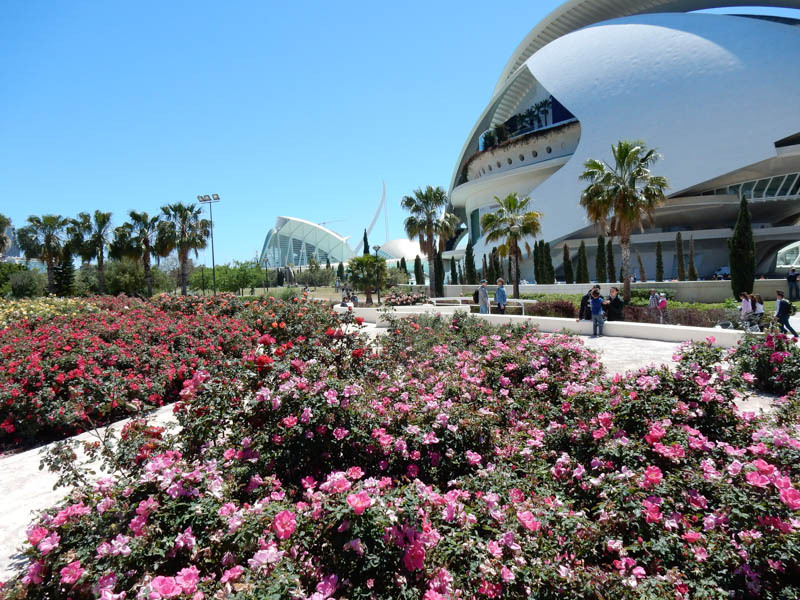 While we were in Valencia we worked on boat repairs and improvements and took the time to become very familiar with this beautiful city. It helped that we had a rental car the entire time that we were there. 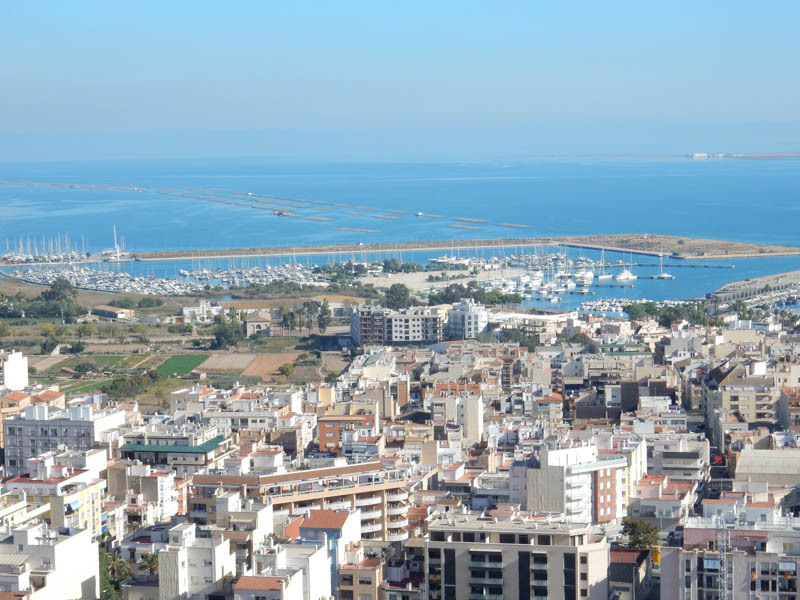 Access to town, as well as stores and restaurants, was so difficult from the Valencia Yacht Port, where Sabbatical III was berthed, that a car was a must. Plus, at 23 euros a day, the price was right. I did not like driving in Valencia. There are very few street signs, Google Maps often did not provide good directions, and parking was tricky. We did finally find our way around but finding our way to new places was always an adventure. 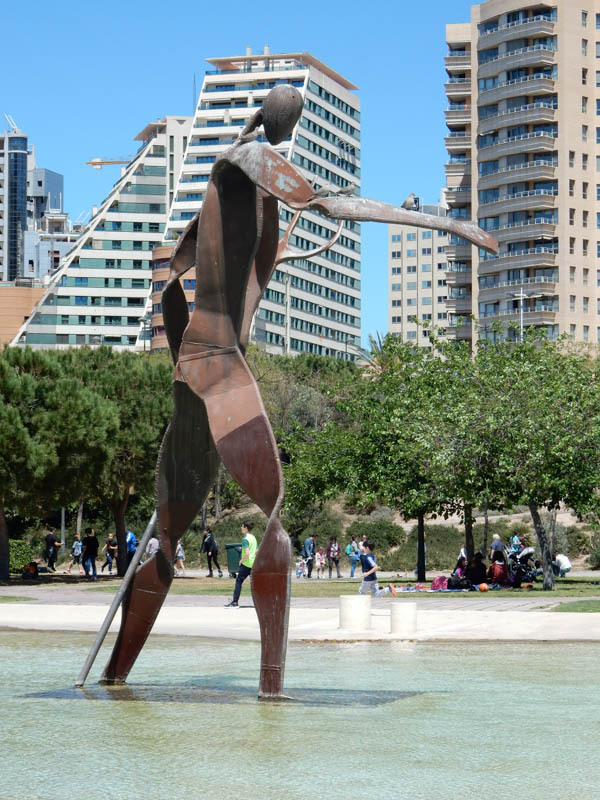 One of our favorite places was the Turia River Park. 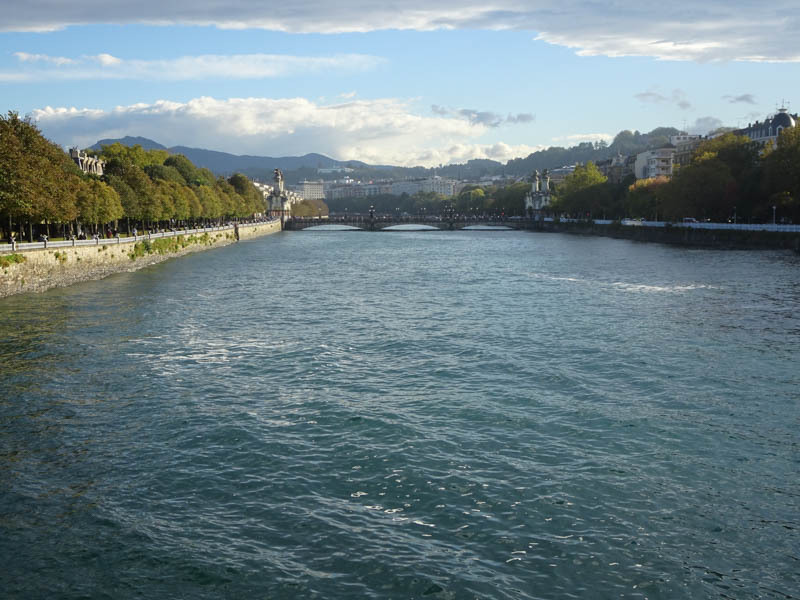 The river used to flood regularly, and after a particularly bad flood in 1957, approval was given for the river to be diverted away from the city center. Since then, the 7 kilometer long river bed has been transformed into a mixture of playing fields, cycling & walking paths, and gardens. 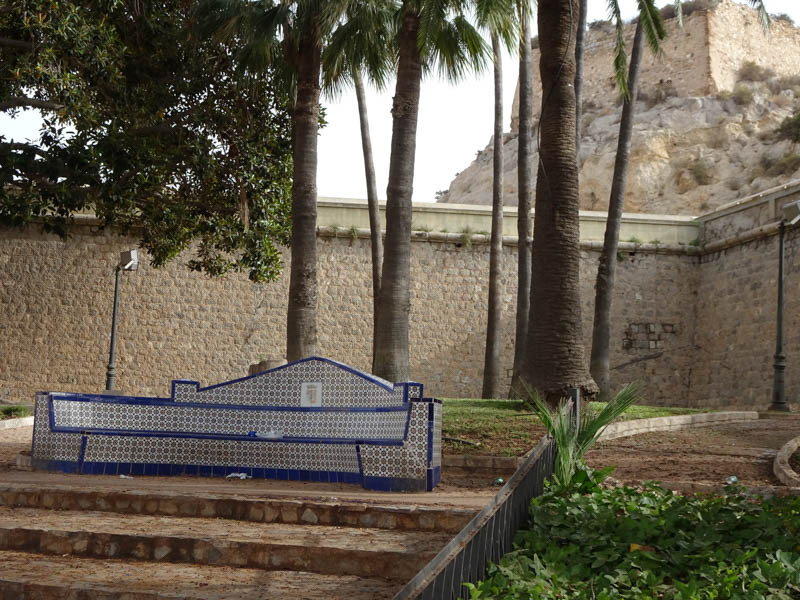 At one end is the City of Arts & Sciences and the old city is at the other end. On Sundays, we would park somewhere near the park and spend hours walking and people watching. 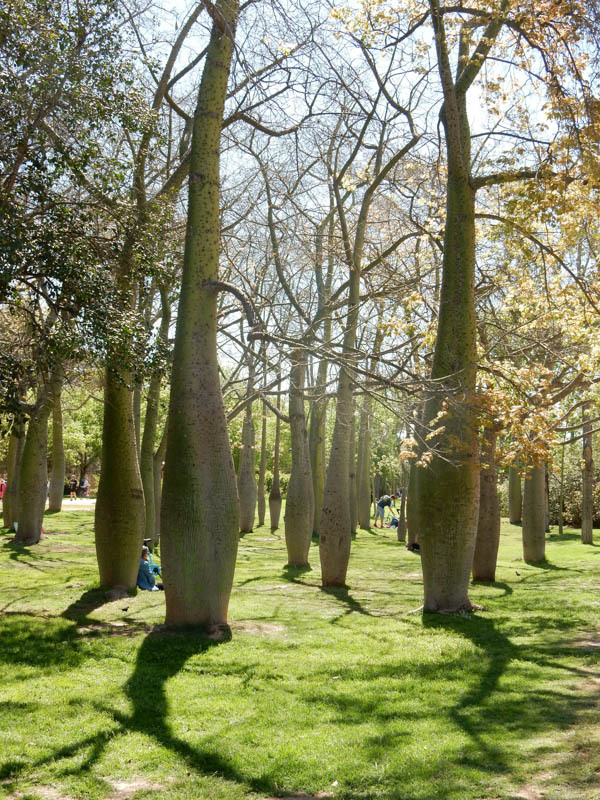 We ate a traditional Sunday mid-afternoon meal at El Riconet and then walked back to the park to lie in the shade while the effects of wine and food wore off. We were not alone in doing so. 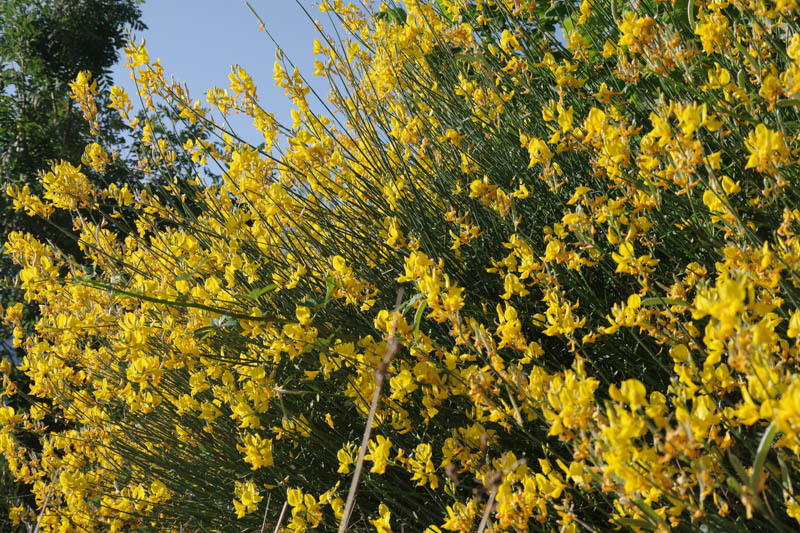 We also discovered the nearby parklands (Parc Natural de l’Albufera) around Pobles del Sud, a large lake that forms the center of the rice growing district south of Valencia, as well as the beach walk and restaurants at Pinedo, just across the Turia River bridge from the marina. 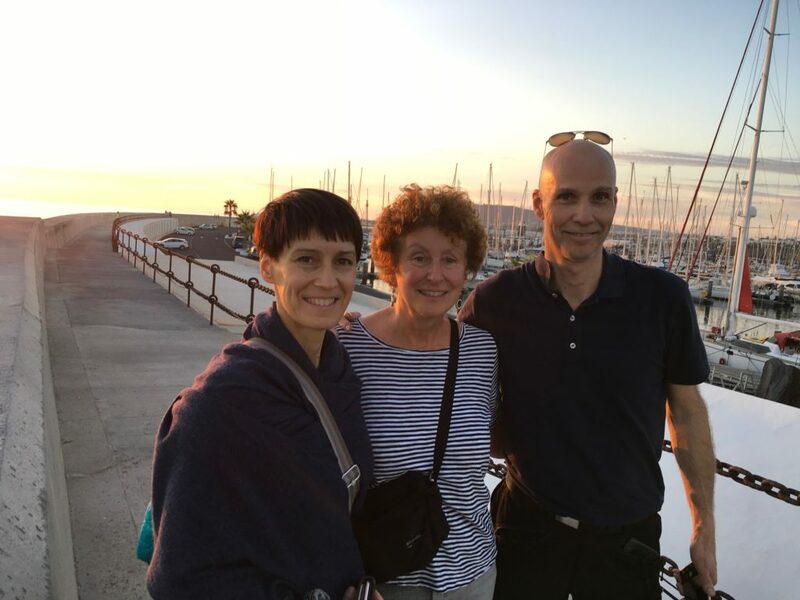 Finally, we enjoyed spending time with Chimo and Jane of “Pangea Barco”, berthed only one dock away from us at the Valencia Yacht Port. 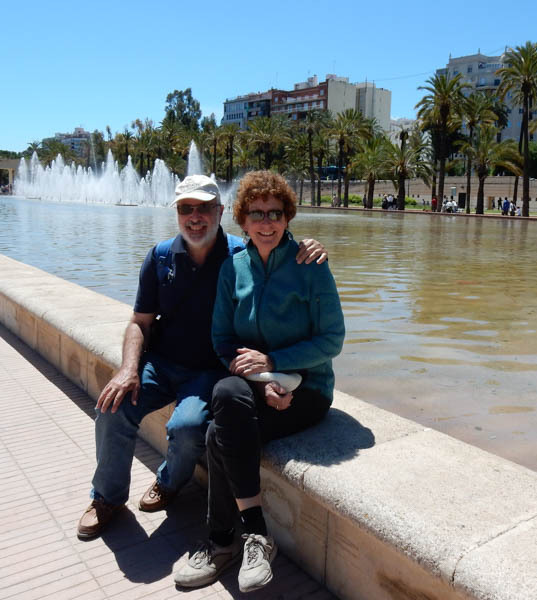 They took us for great paella, cooked us marvelous meals, and directed us to interesting places. 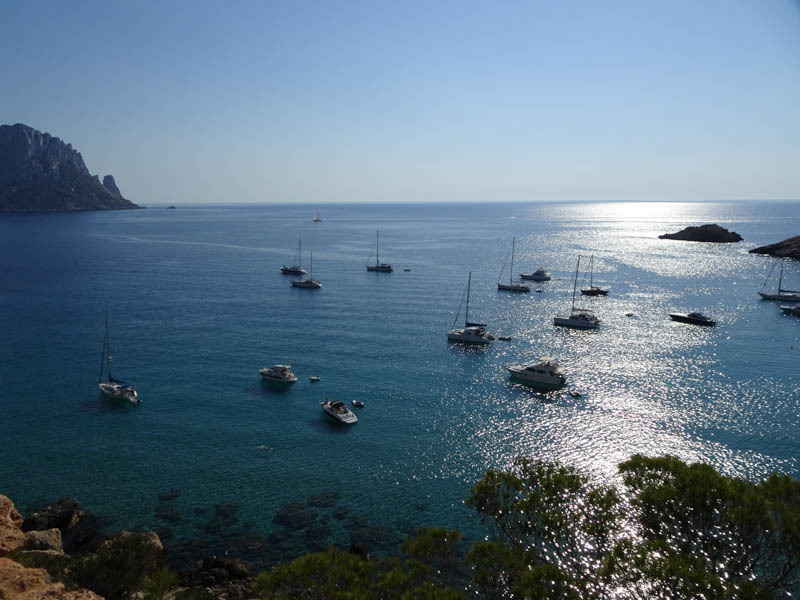 On June 17, we left Valencia for an overnight sail to the island of Ibiza. 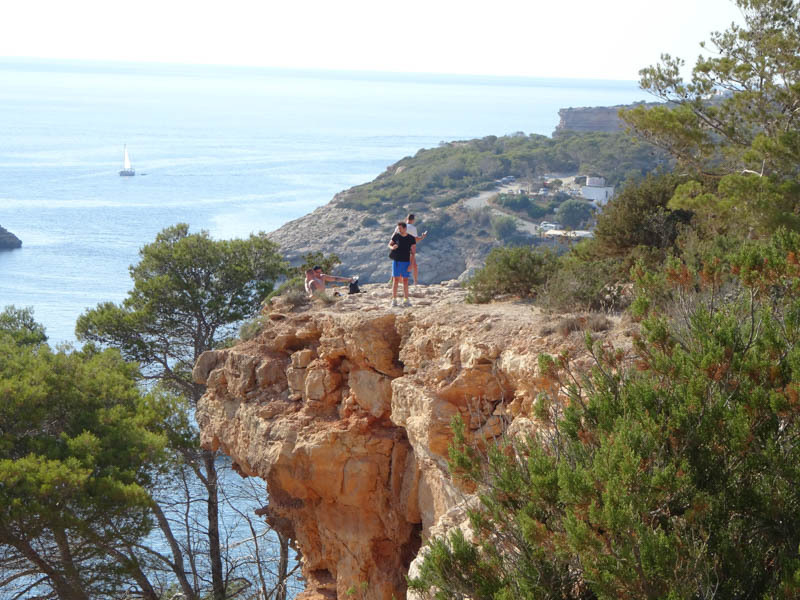 We spent about three weeks in Ibiza. We were anchored out every day and noticed how the anchorages became increasingly crowded each day. By the time we left, the crowd of boats, some with careless anchoring techniques, made us nervous. 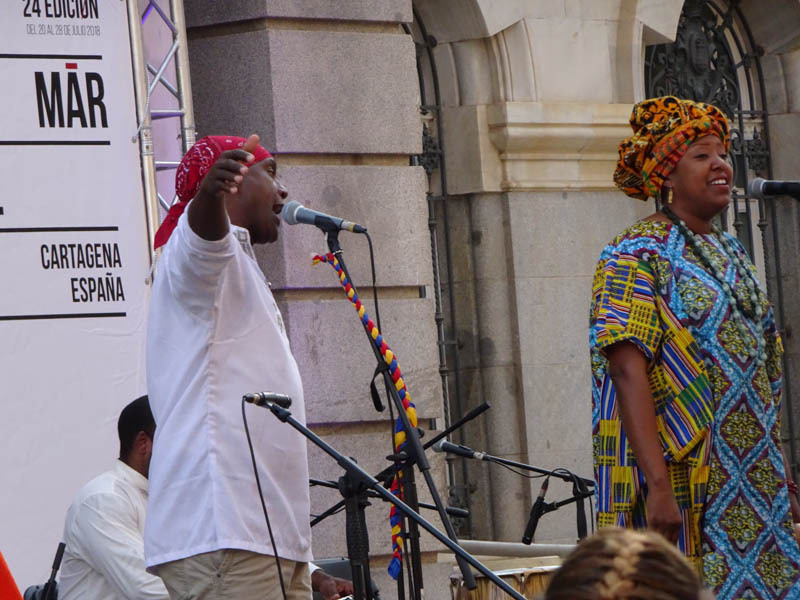 But no harm came to Sabbatical III and we thoroughly enjoyed our time. Finally we could swim off the boat again. 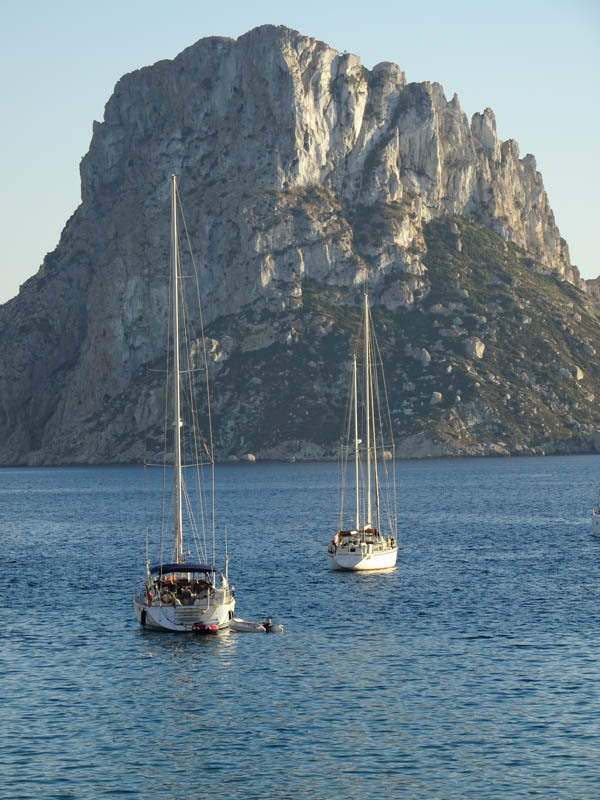 We caught some unusually great sailing weather for the overnight sail (July 6/7) back to mainland Spain. 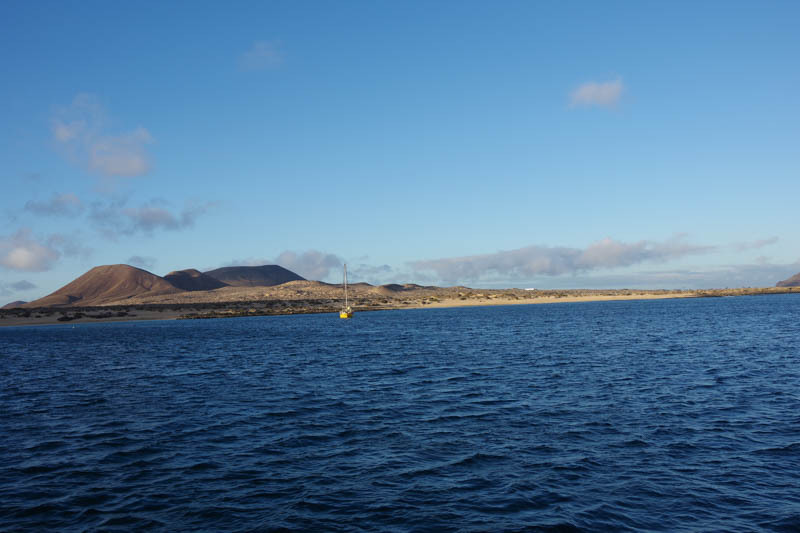 The excellent conditions ended when we were approaching our destination of Cartegena. Squalls came up bringing strong winds (30+ knots) and even some rain tinted with African dust. Unwilling to enter the marina at Cartegena in these conditions, we found a little semi-protected notch in the coast 5 miles past the town where we anchored in a swell. The squally conditions continued until sunset and then the roll from the swell diminished and we had a decent nights sleep. 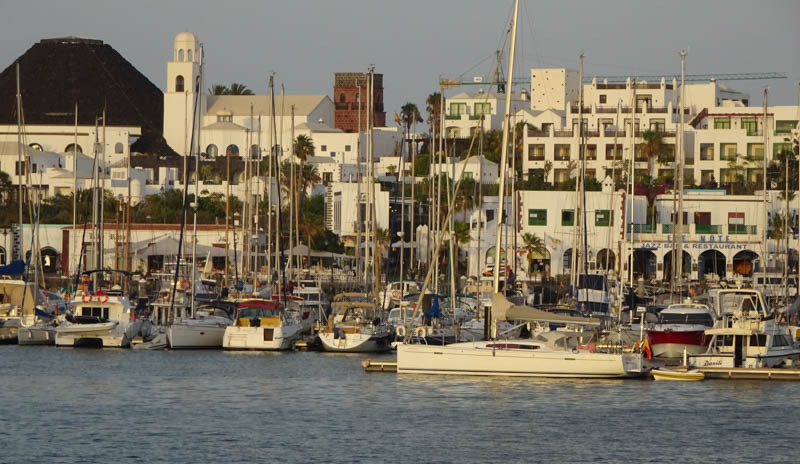 The next morning (July 8) we headed into the Yacht Port Cartegena. 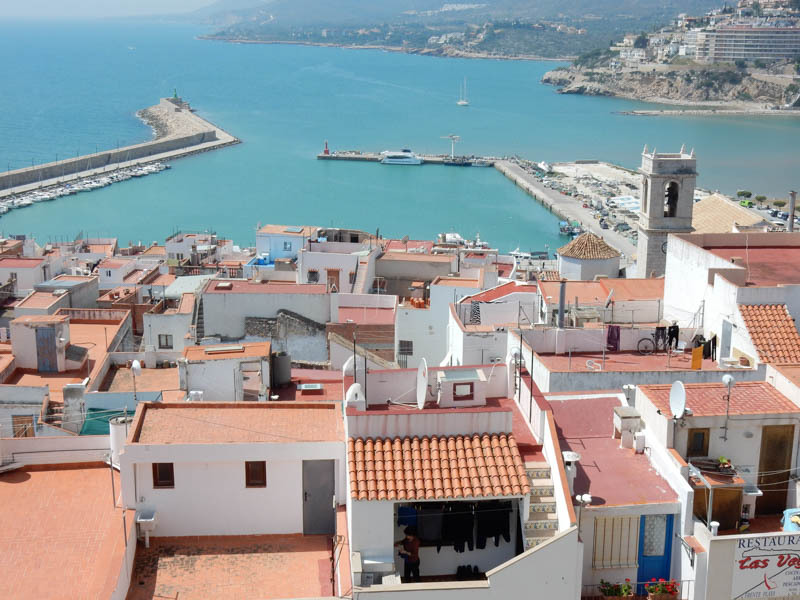 This is a much smaller city than Valencia. 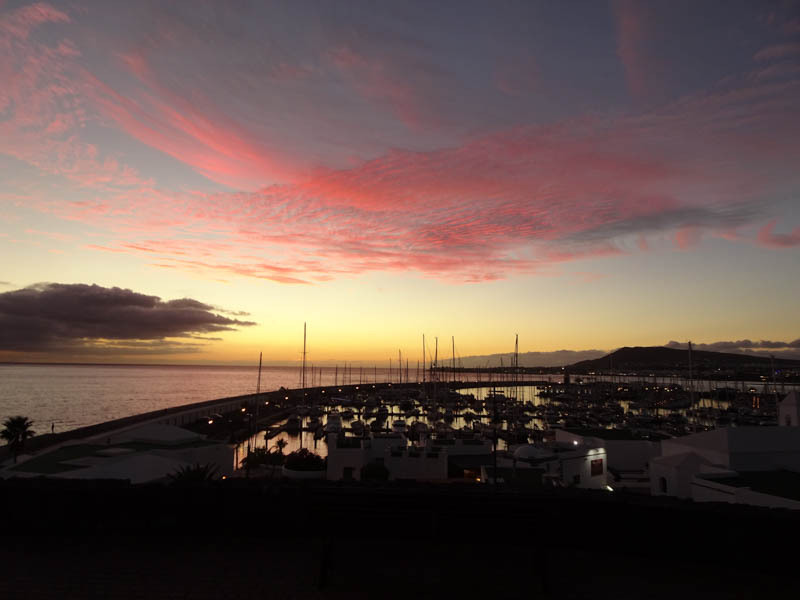 The marina is right in town and everything we need is within walking distance. More on Cartegena later.